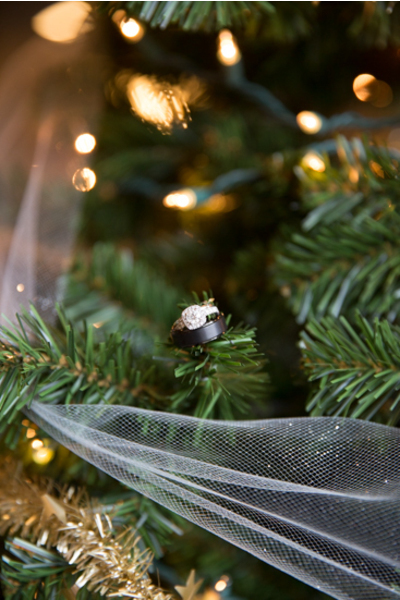 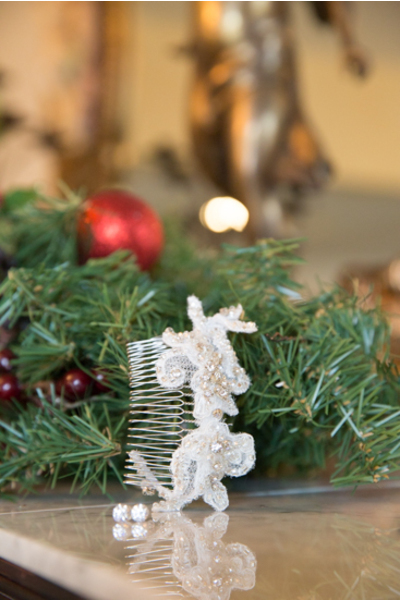 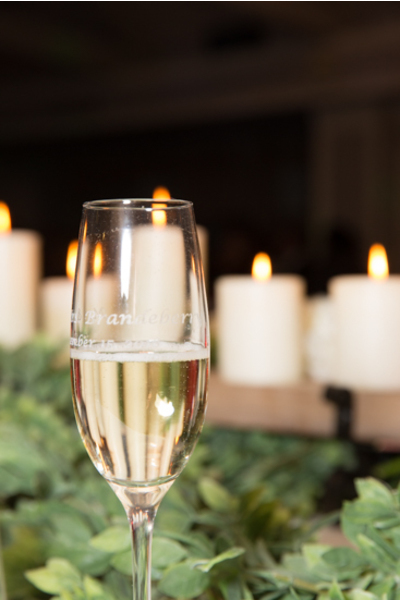 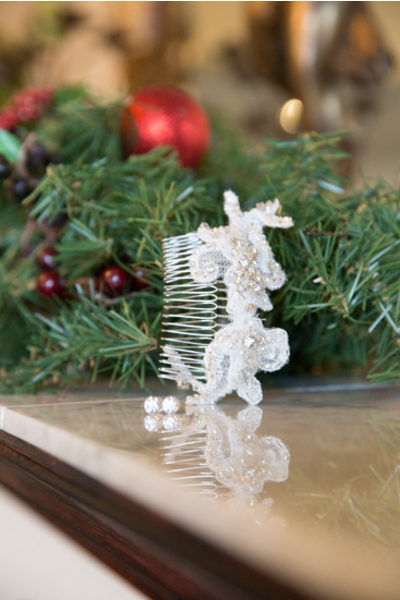 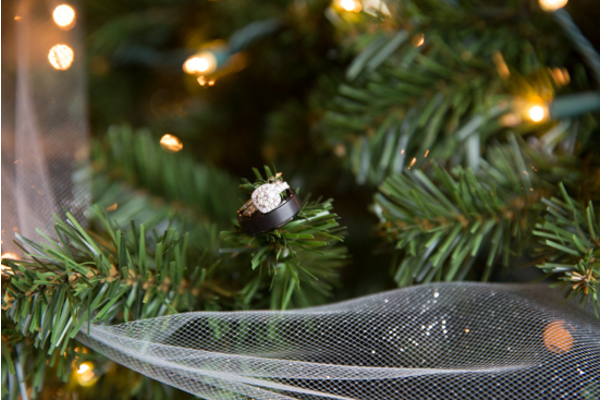 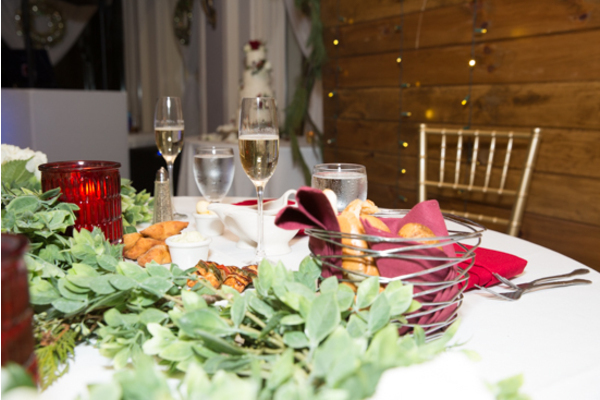 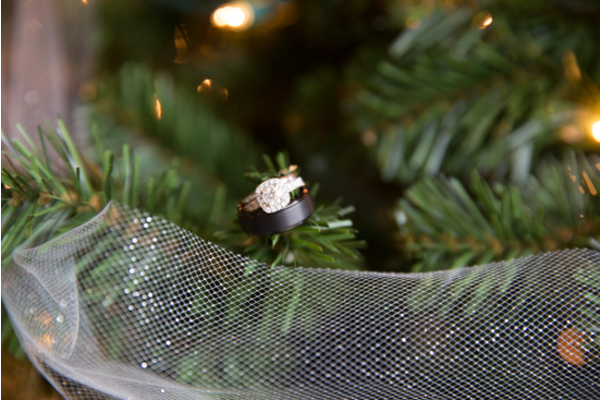 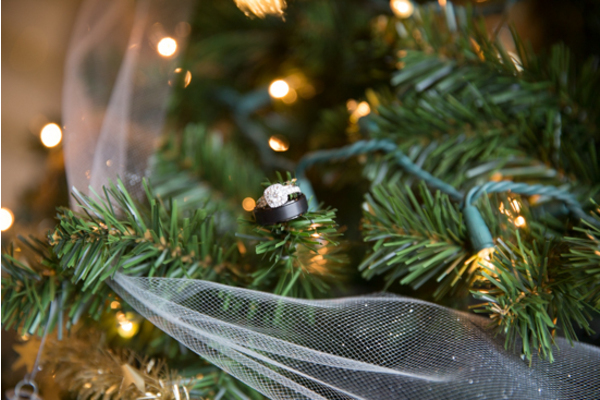 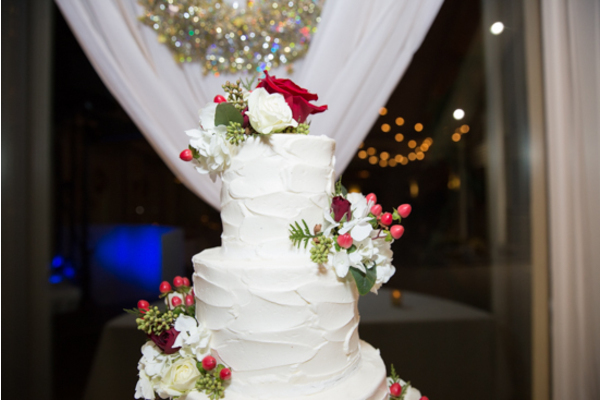 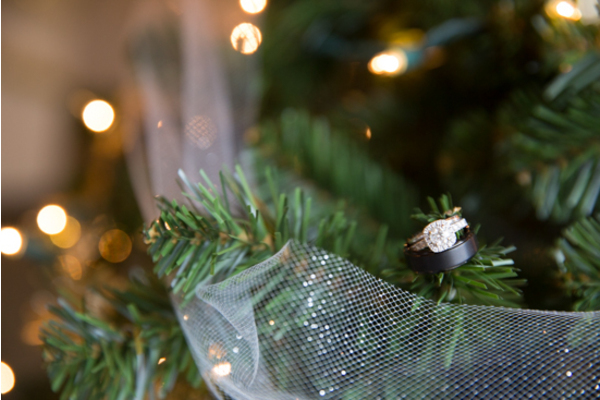 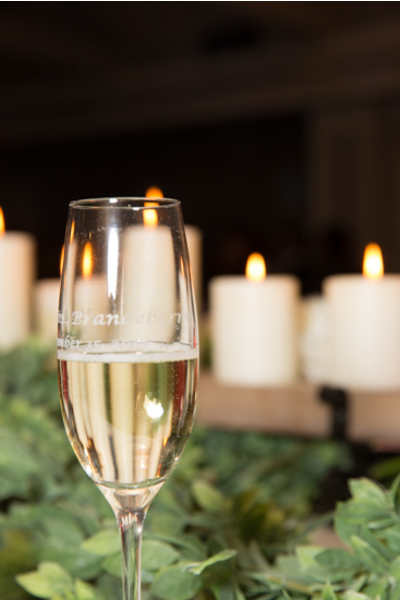 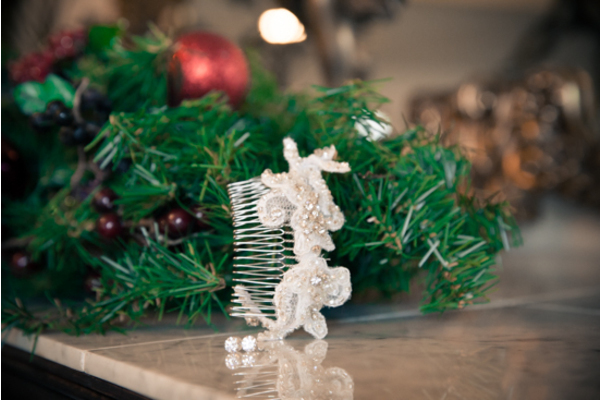 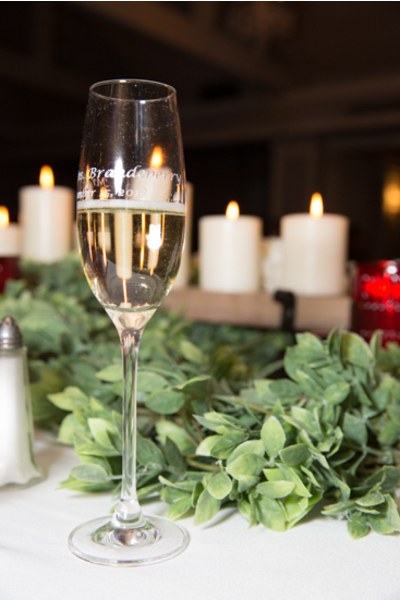 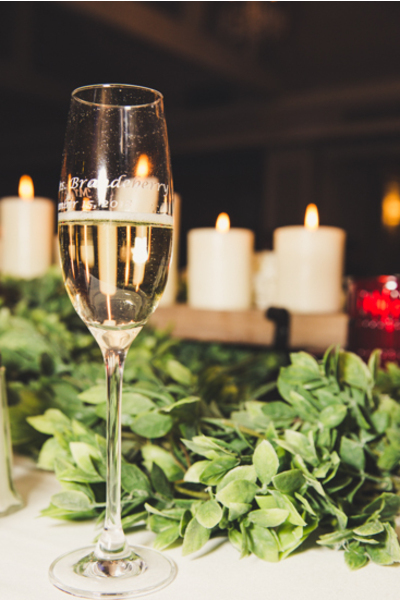 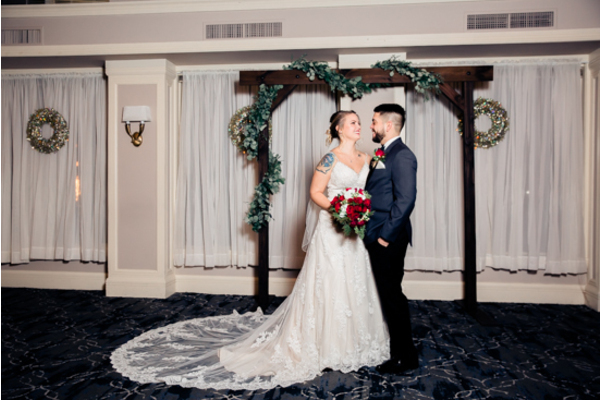 Congratulations to Samantha and Jake on their gorgeous winter wedding! 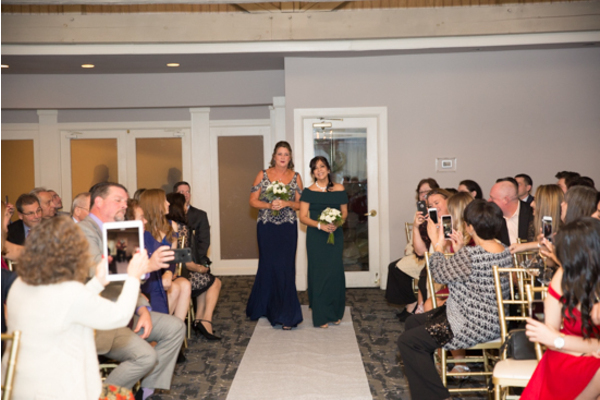 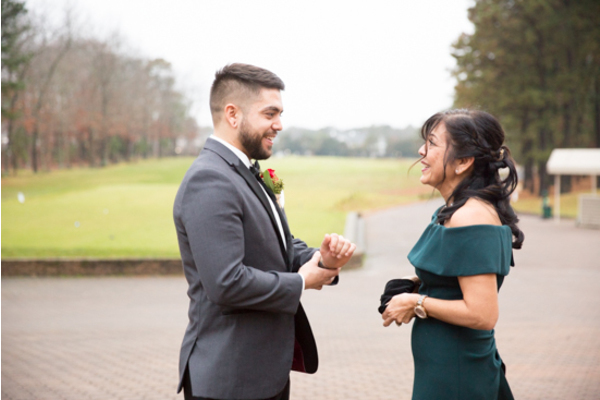 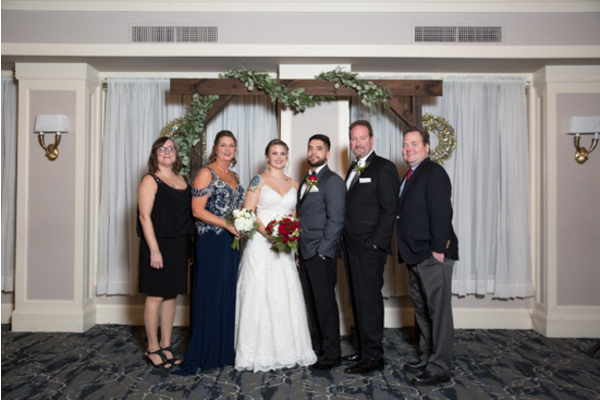 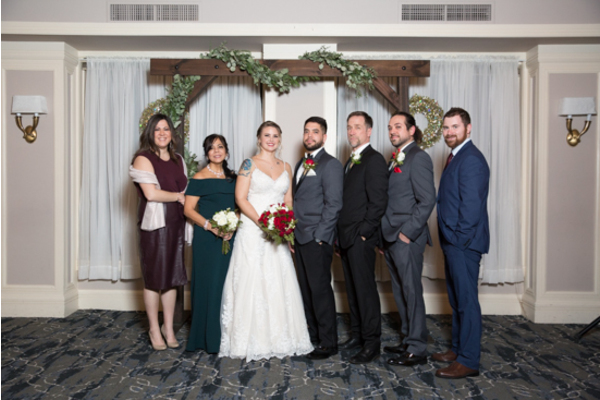 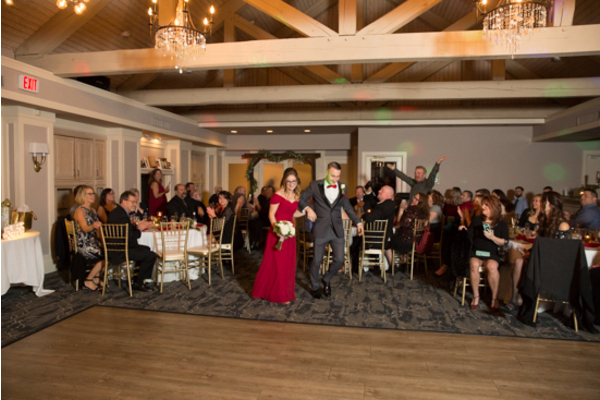 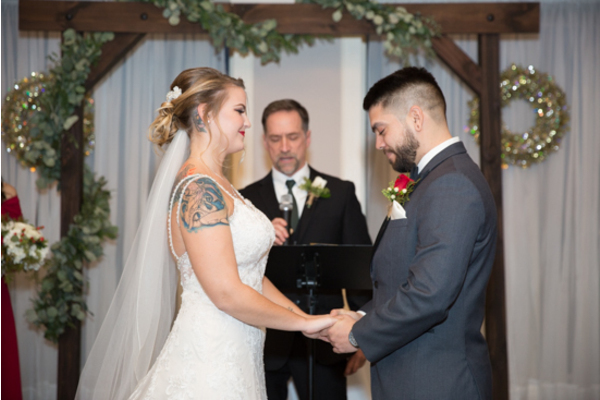 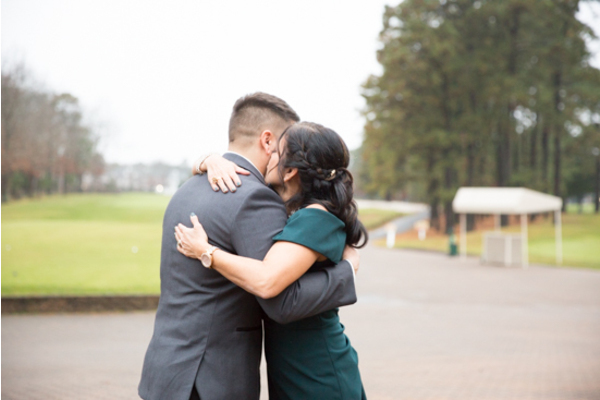 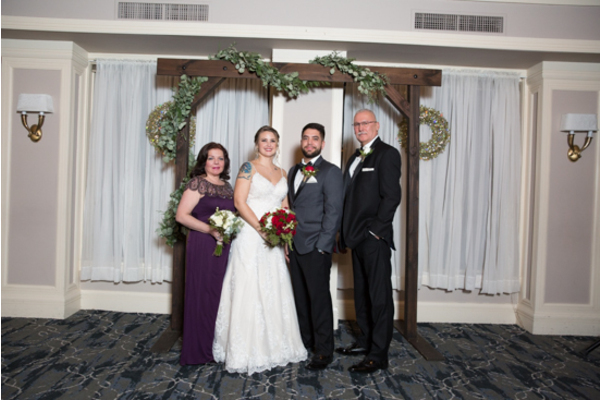 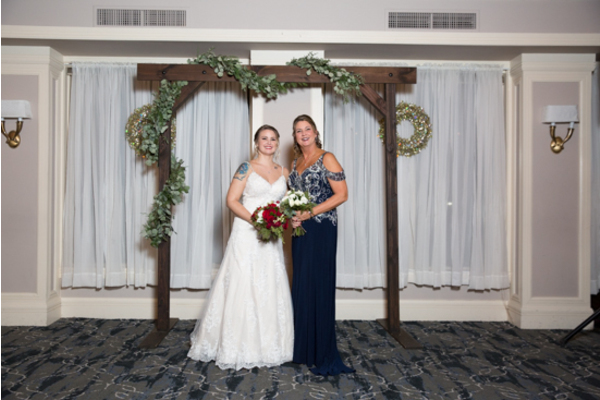 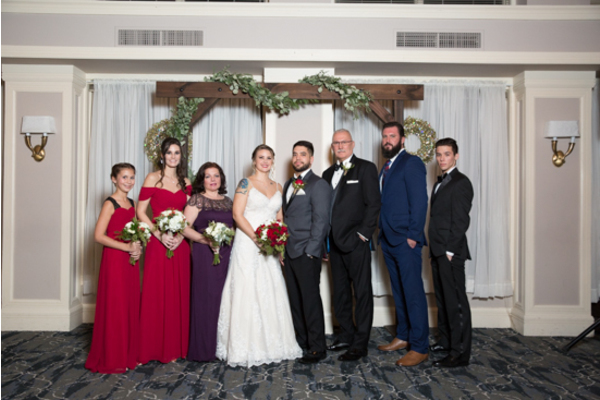 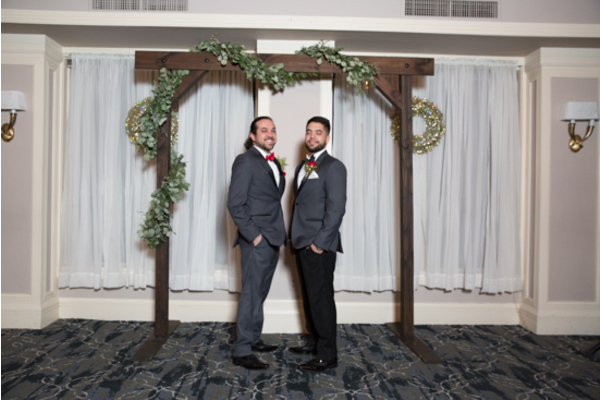 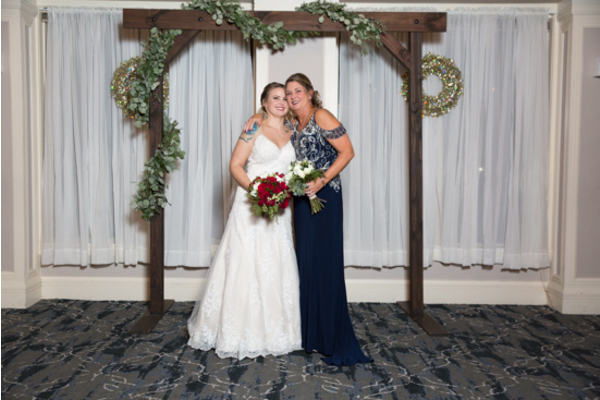 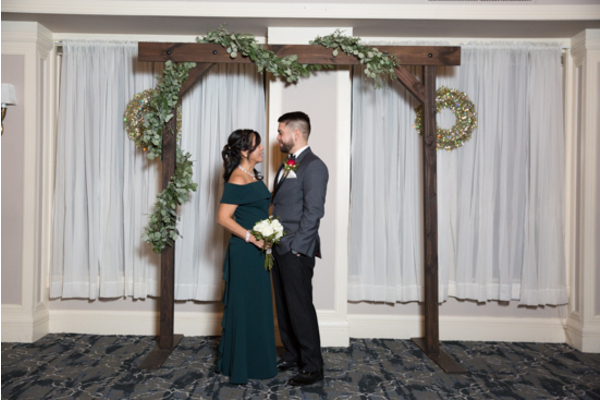 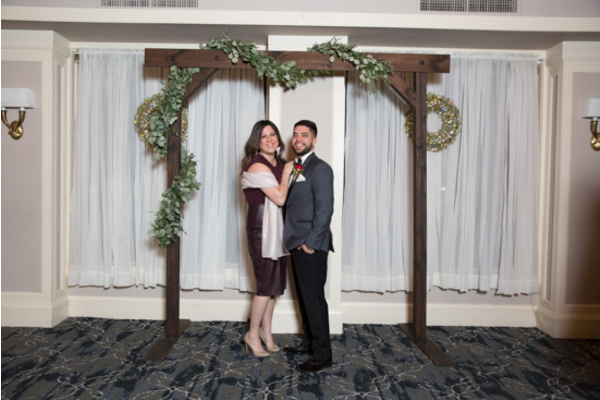 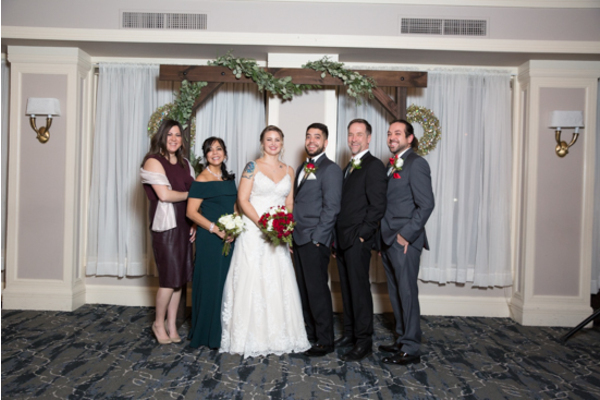 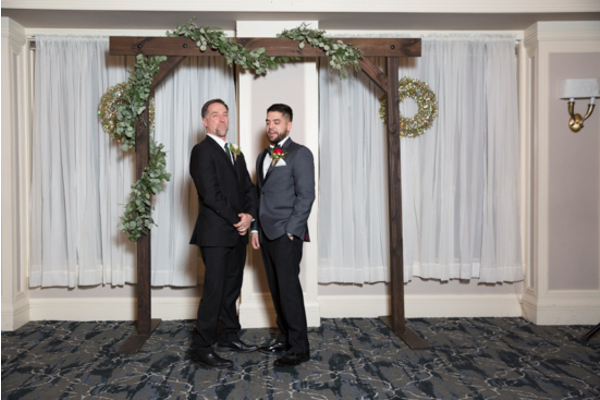 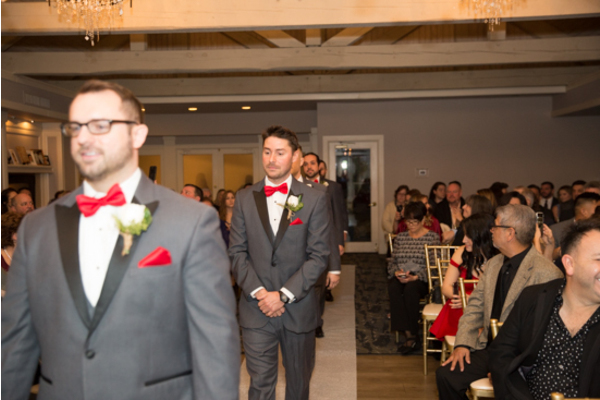 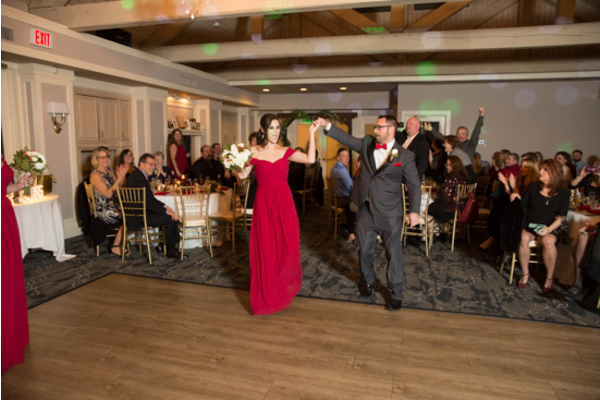 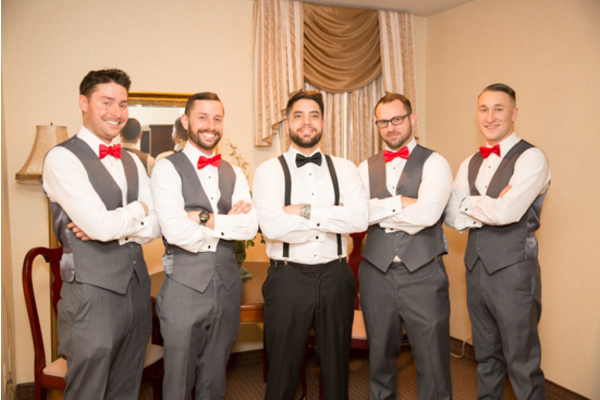 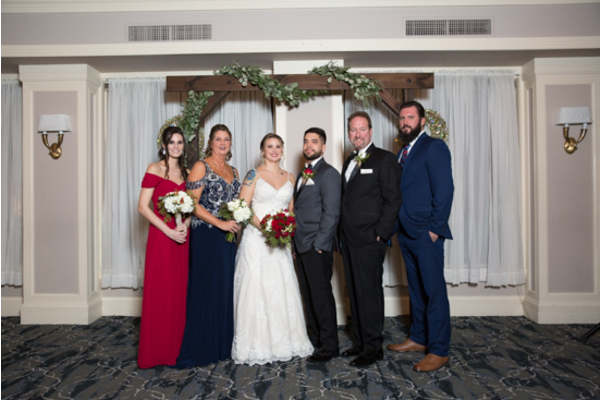 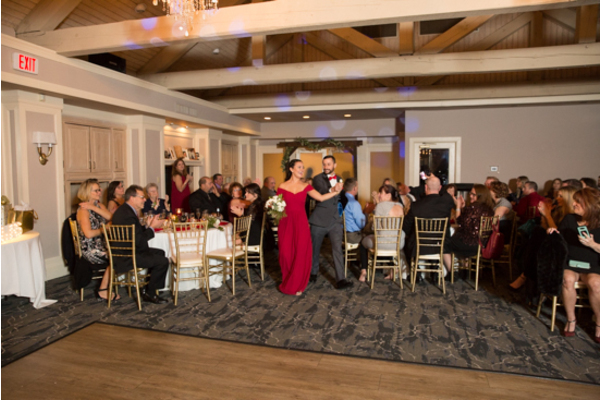 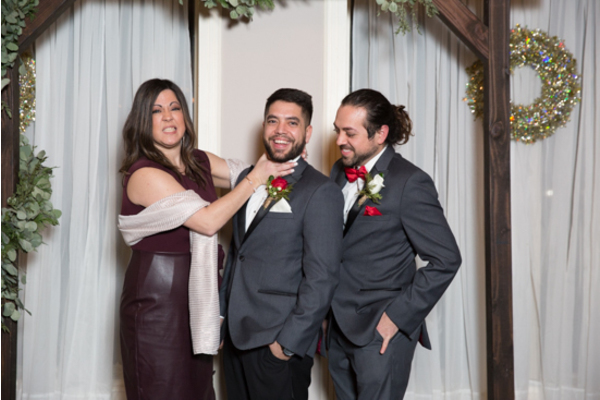 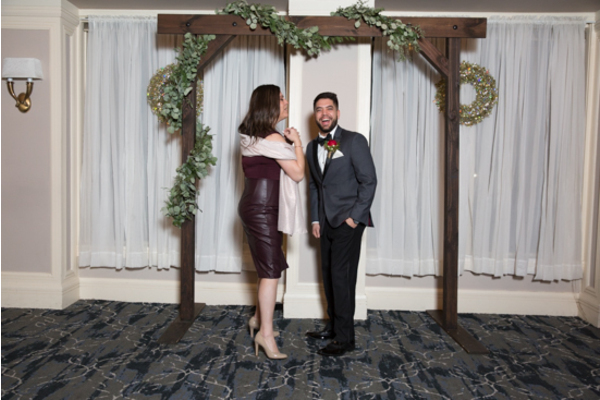 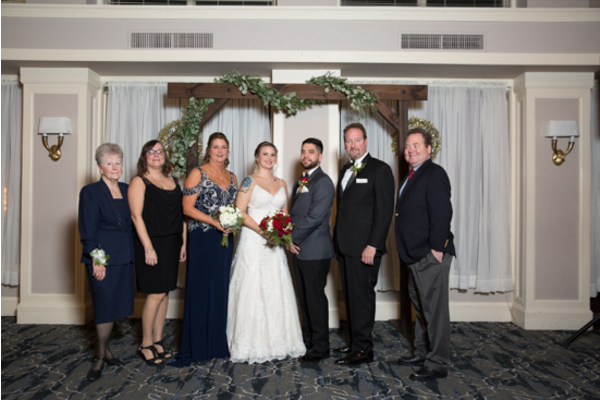 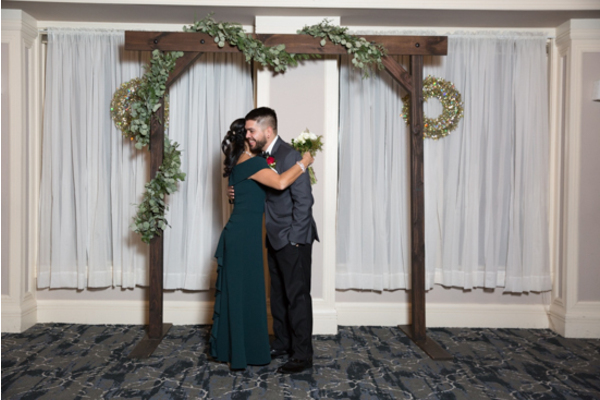 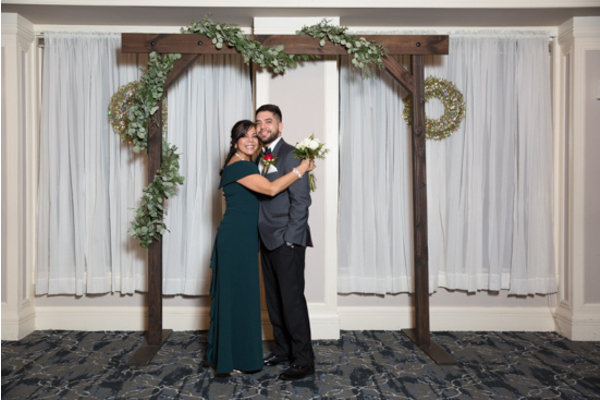 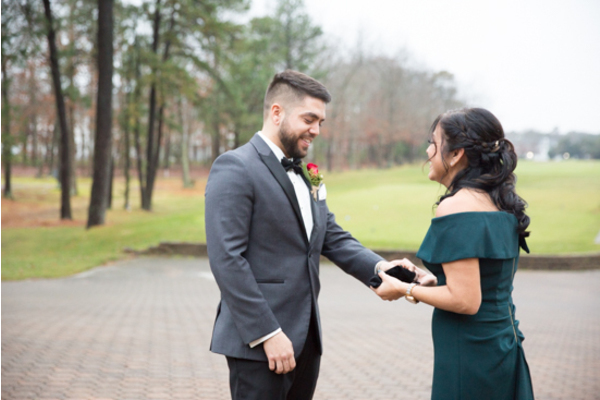 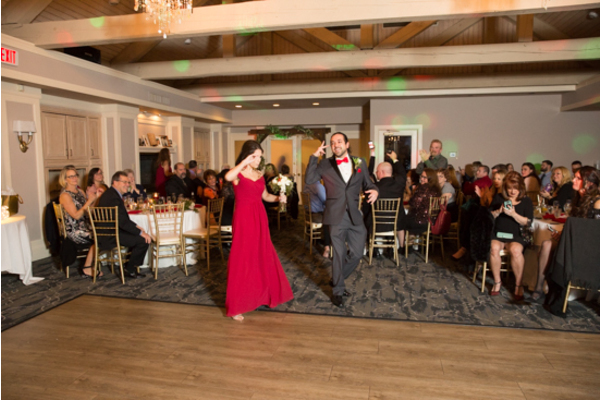 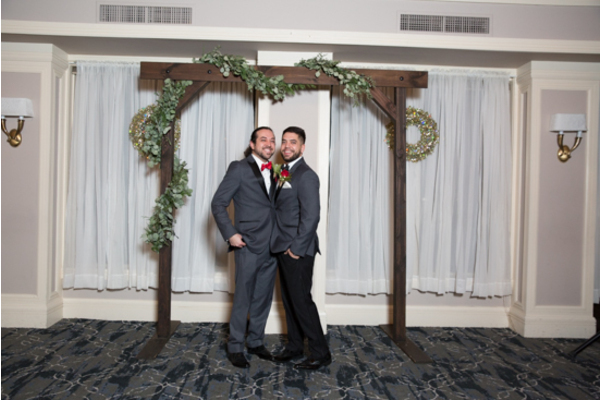 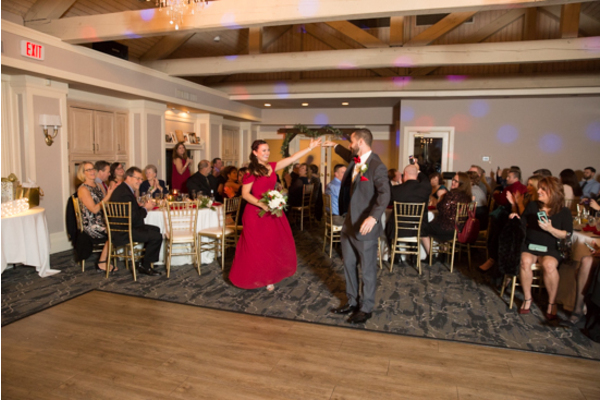 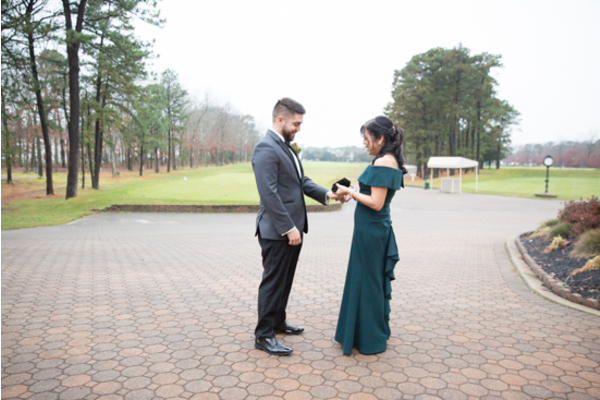 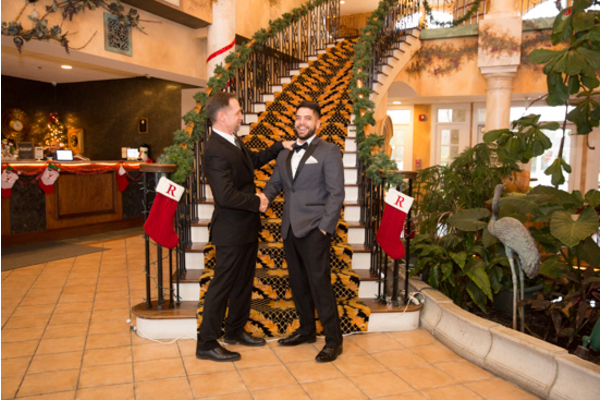 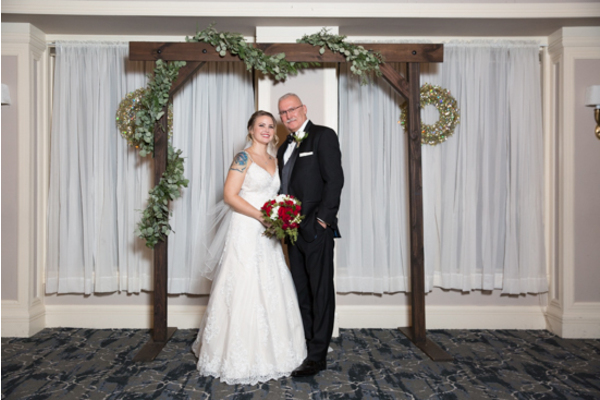 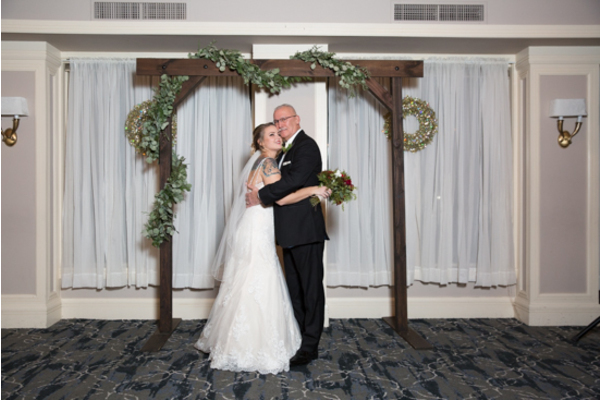 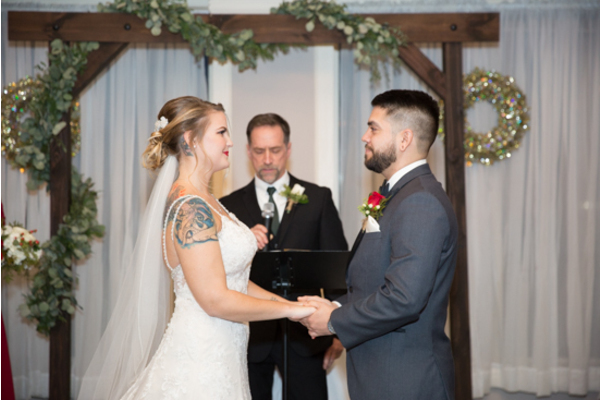 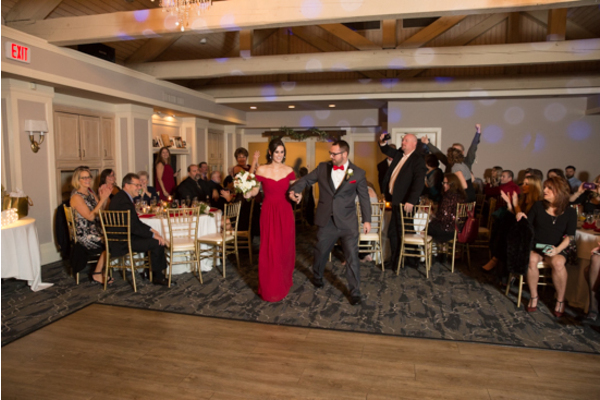 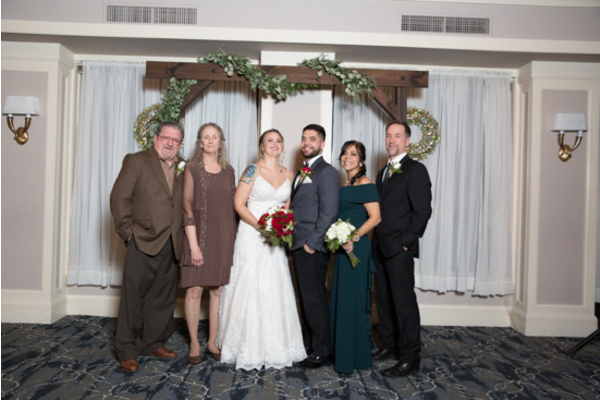 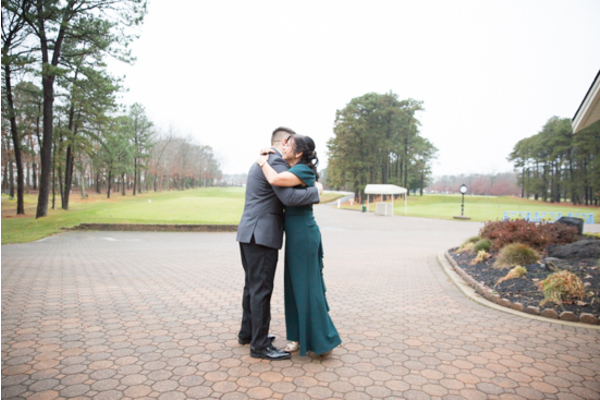 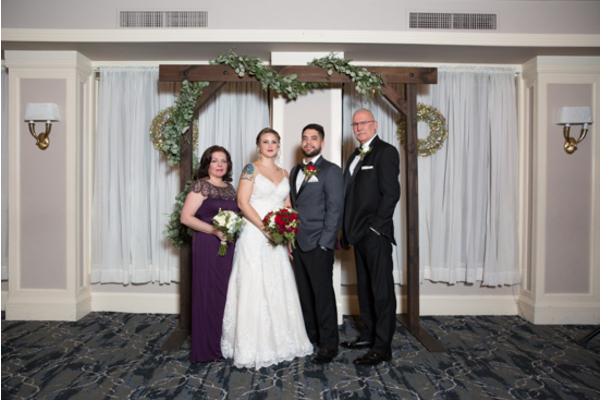 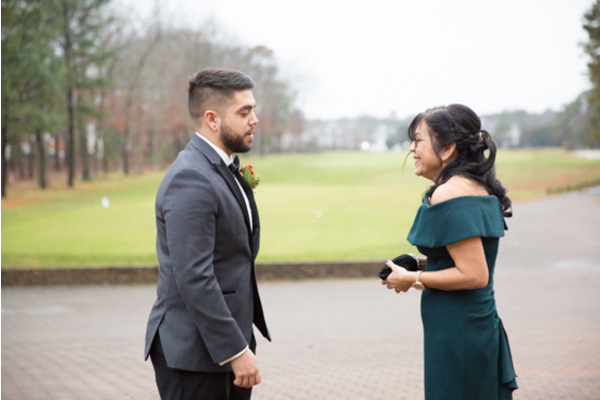 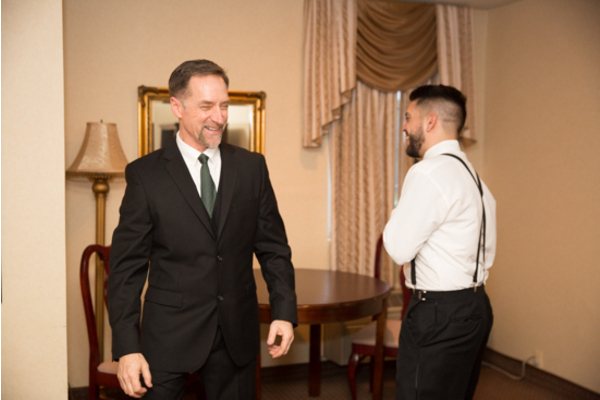 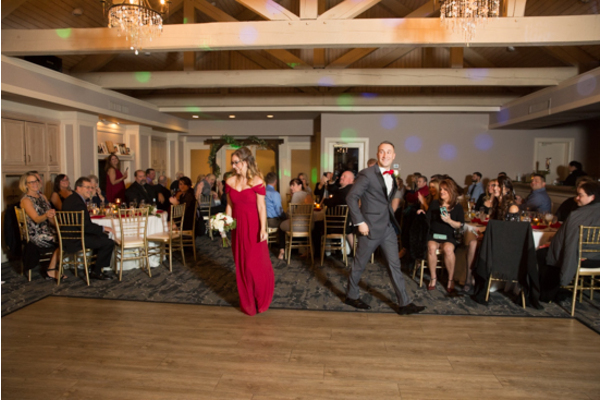 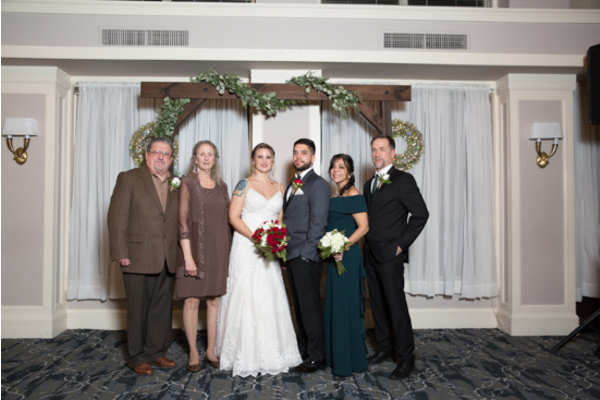 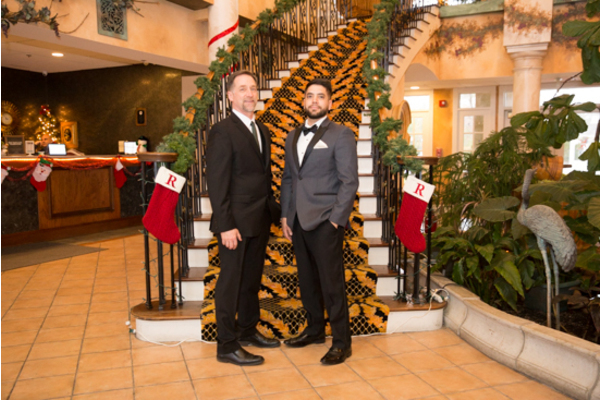 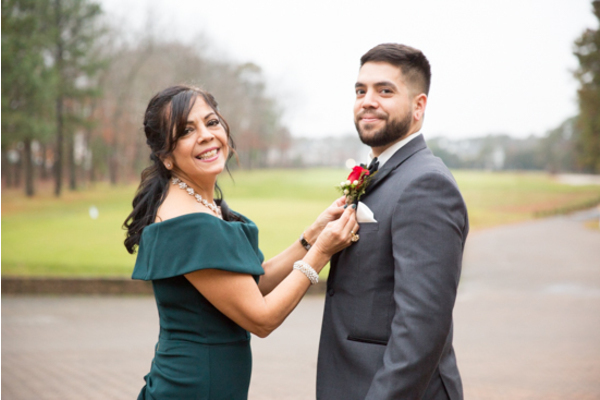 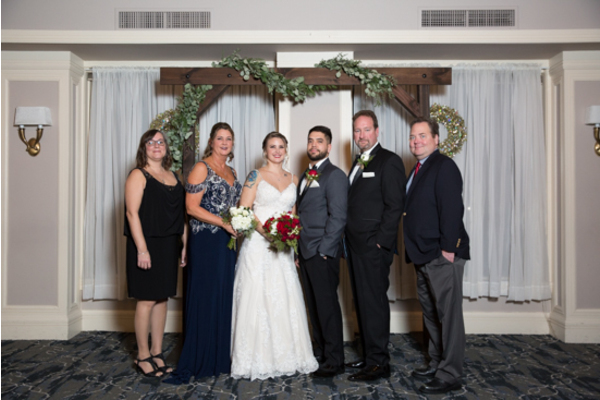 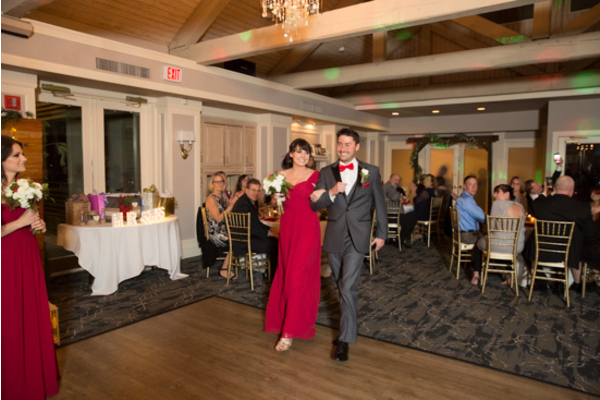 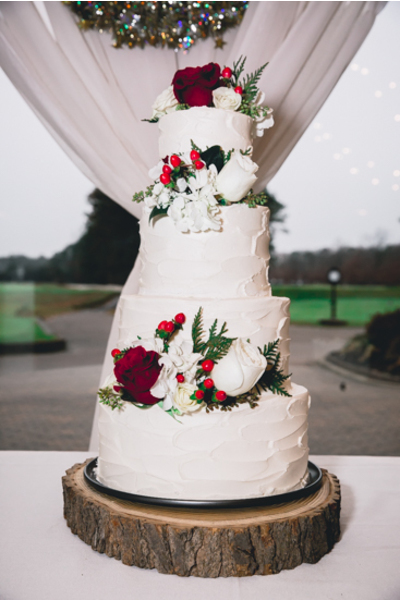 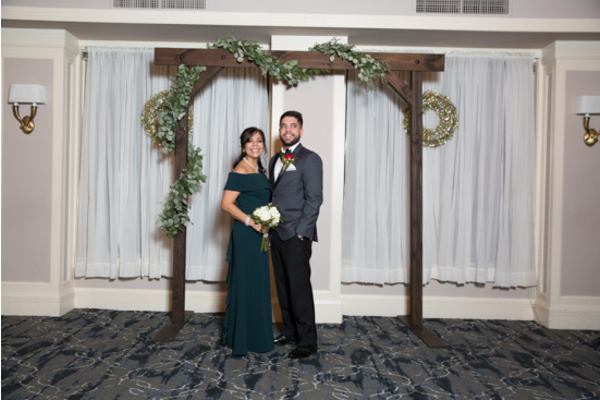 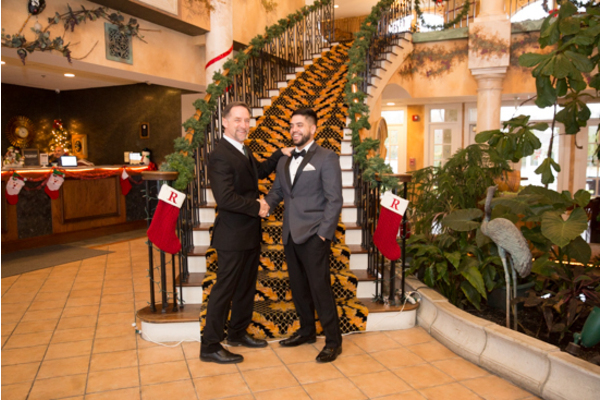 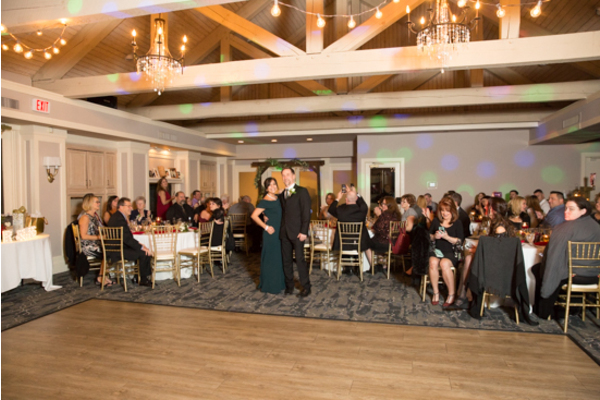 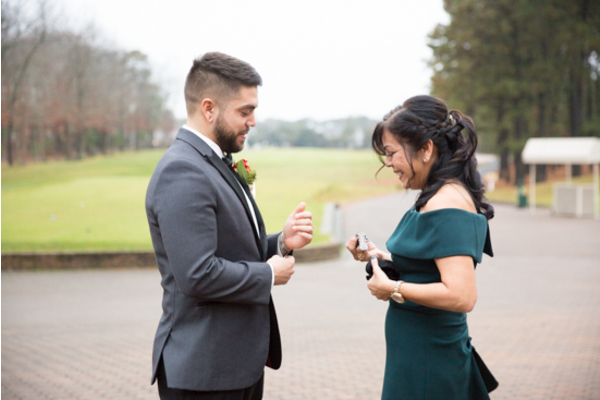 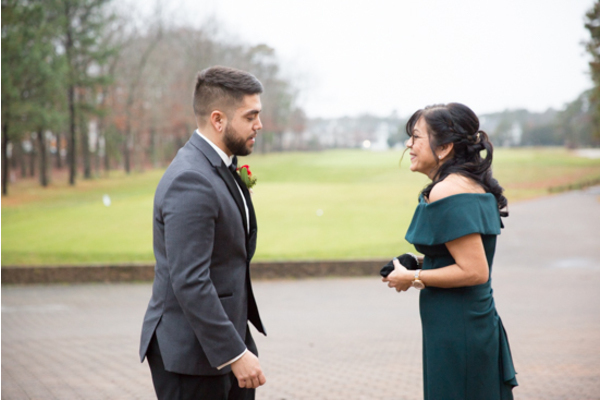 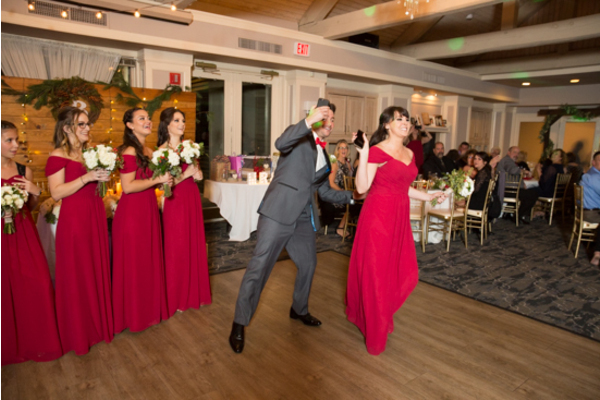 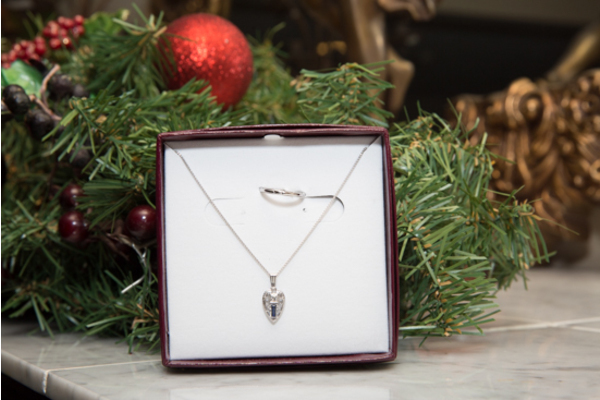 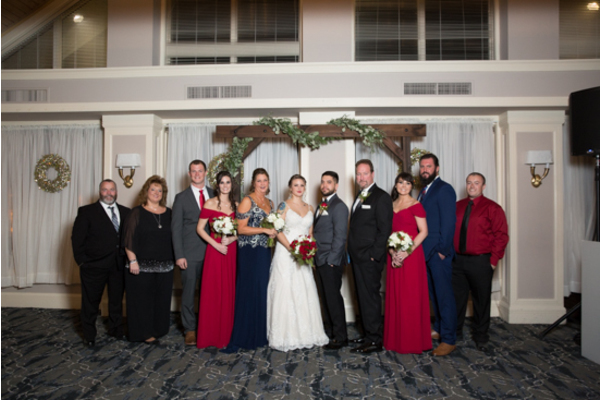 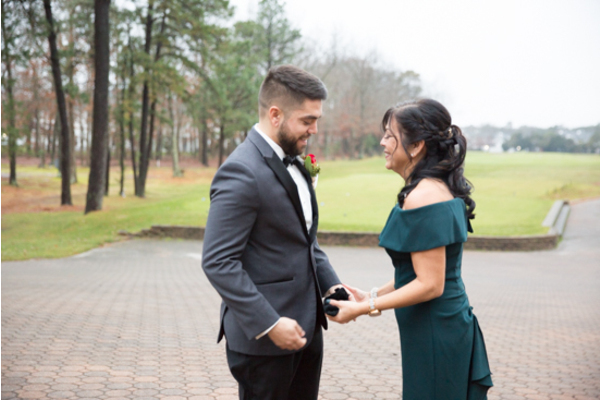 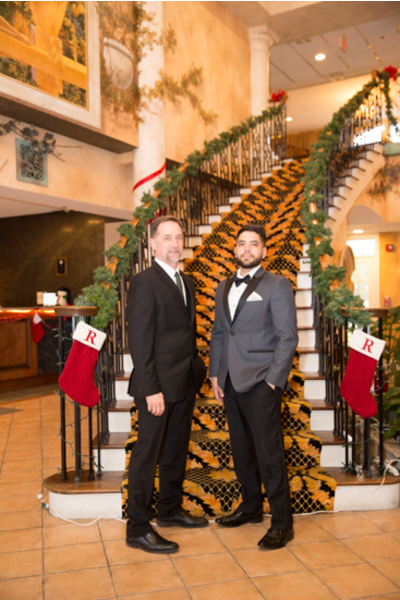 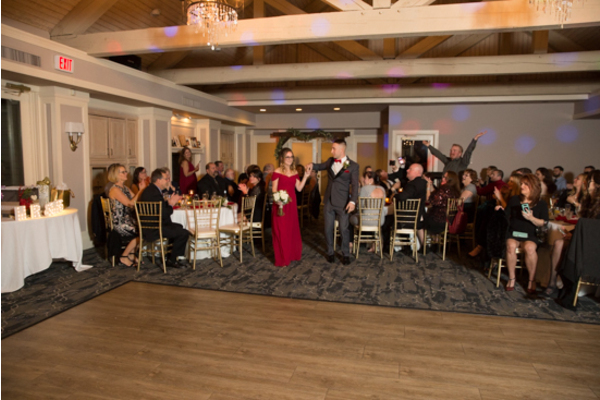 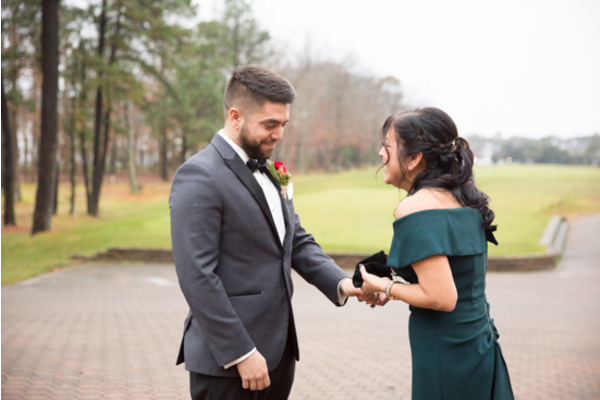 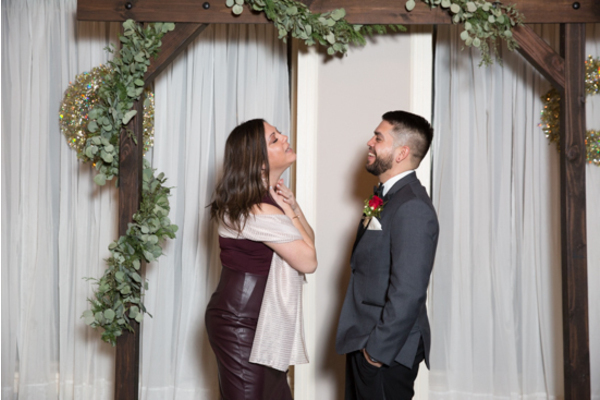 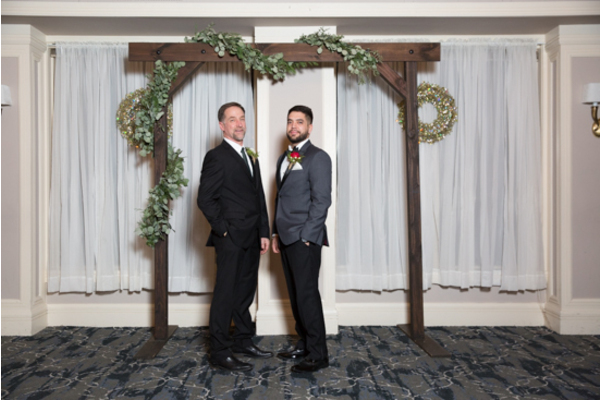 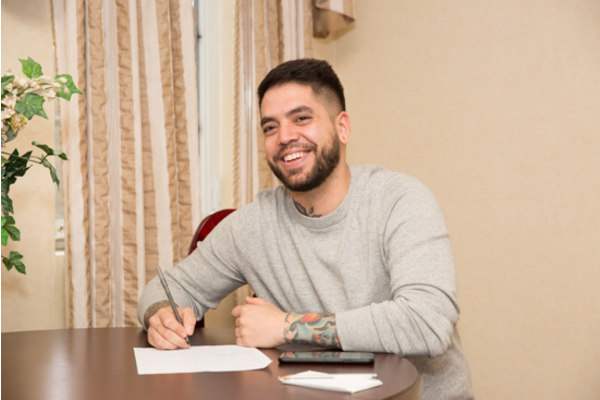 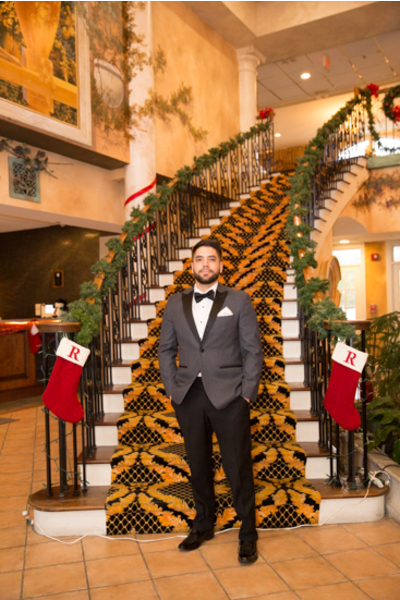 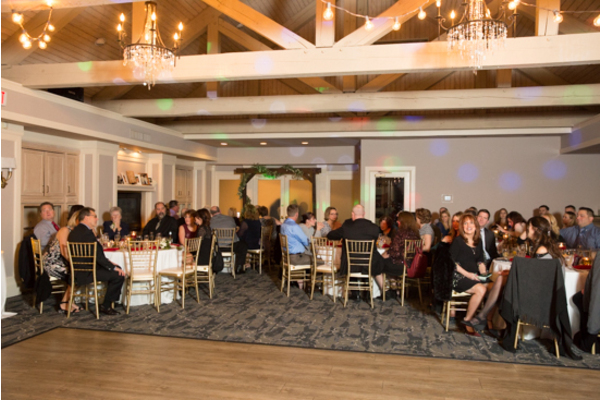 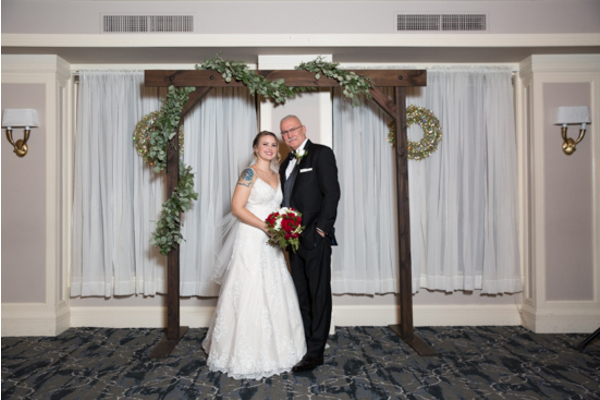 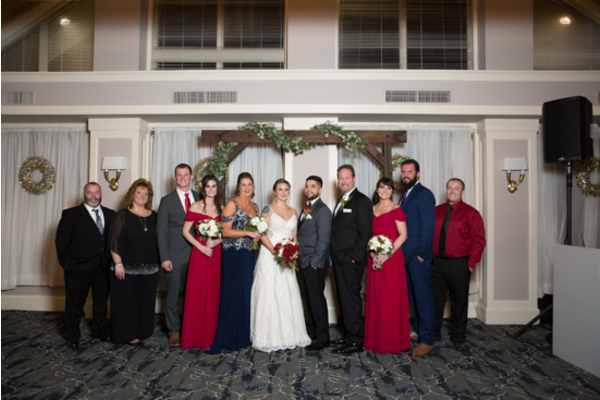 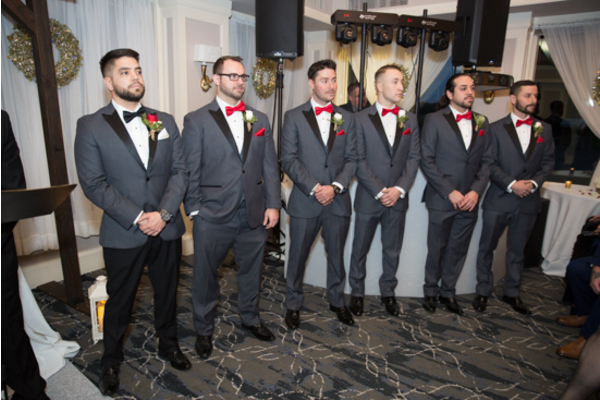 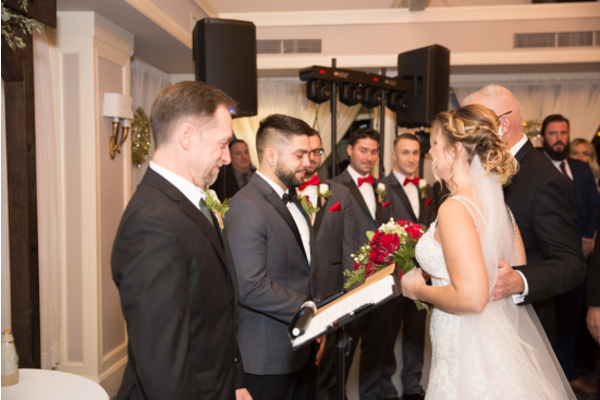 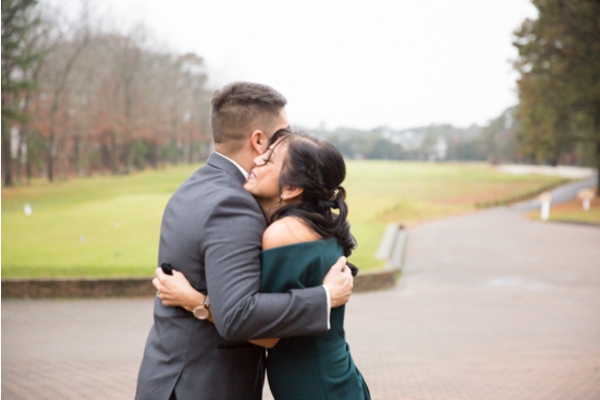 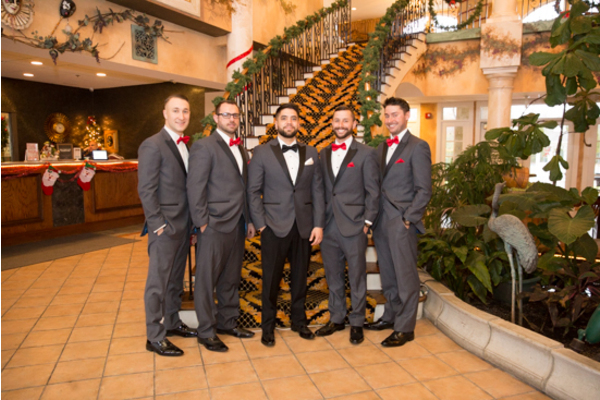 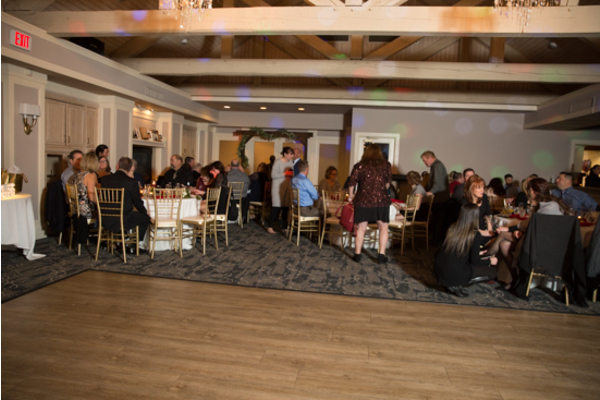 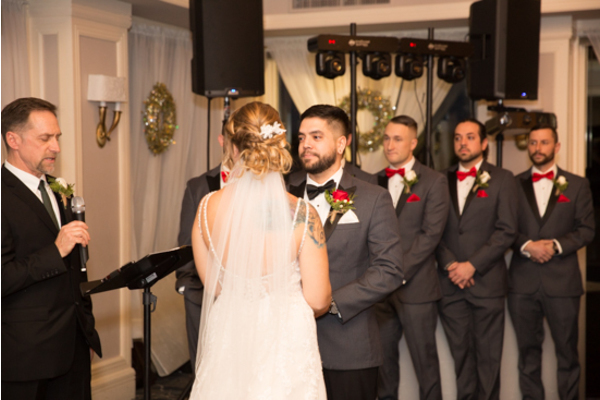 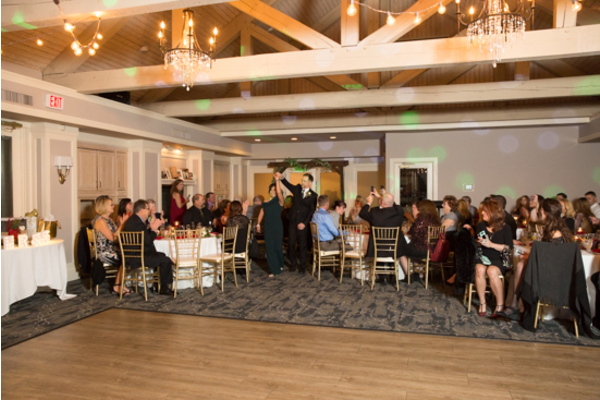 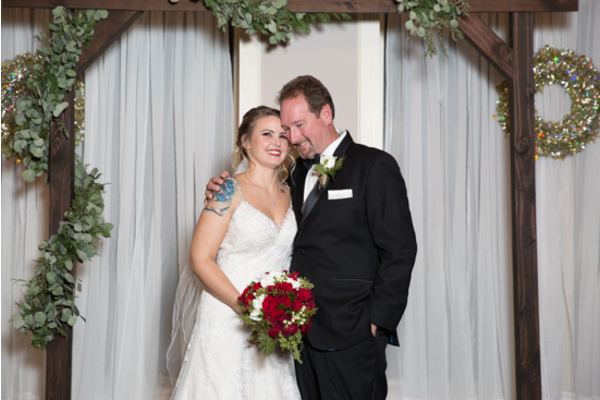 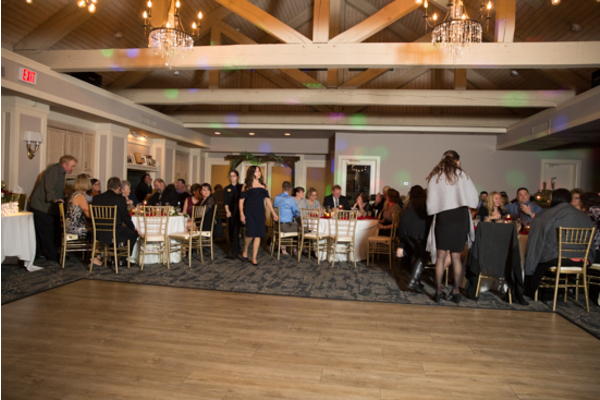 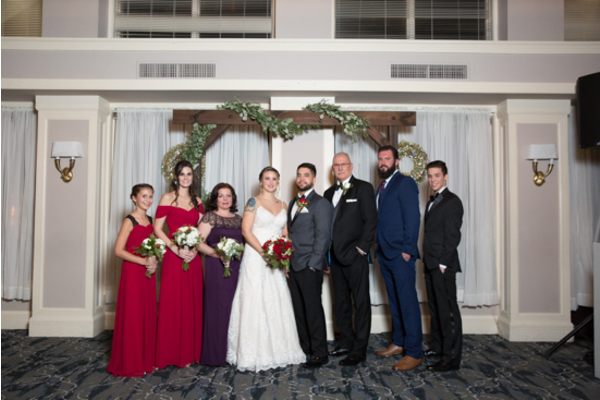 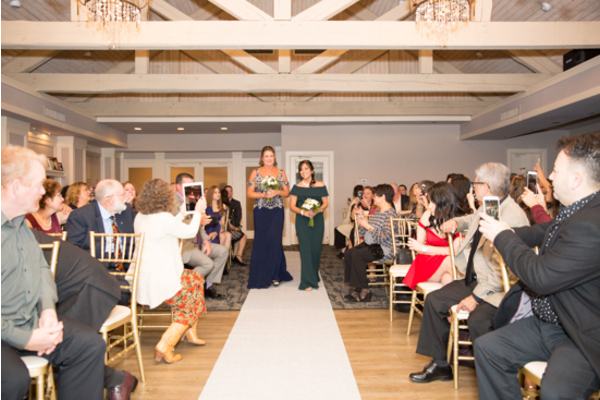 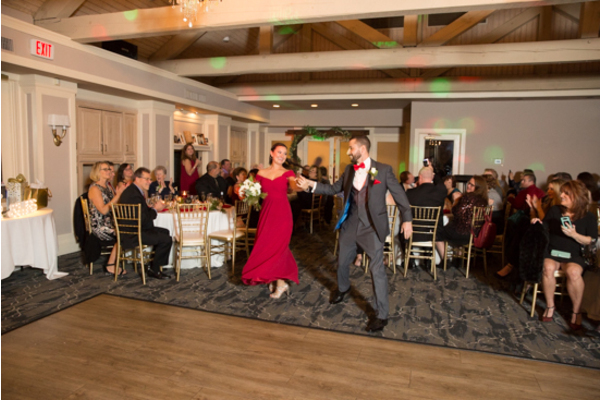 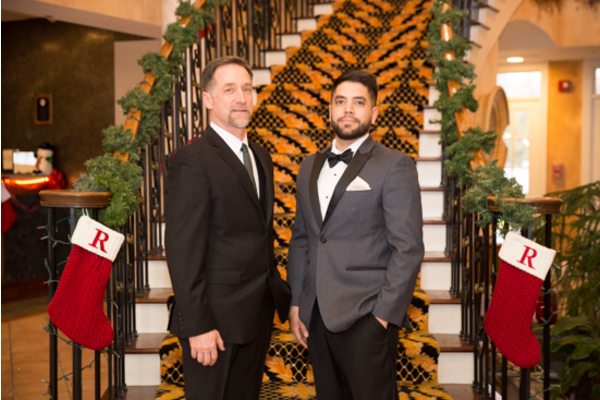 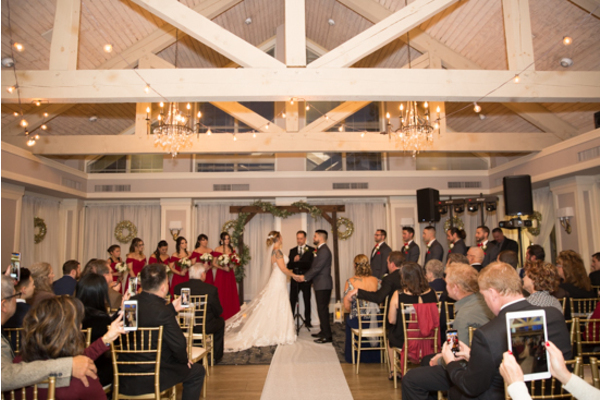 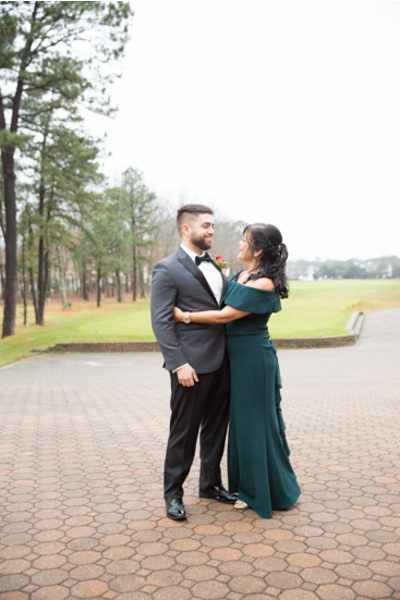 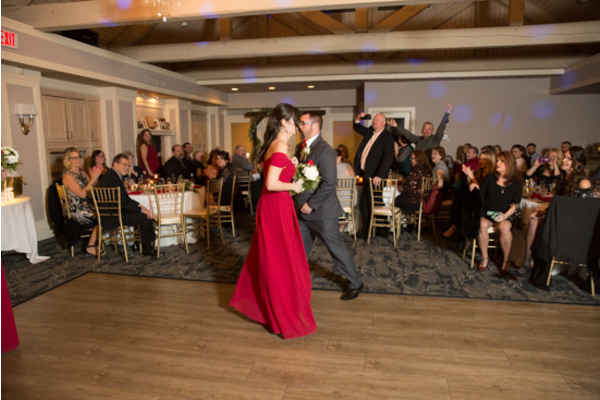 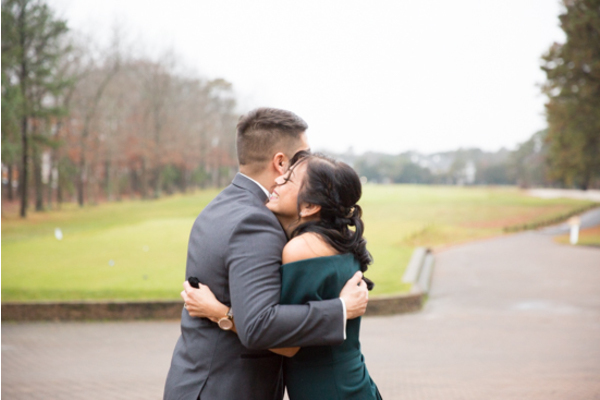 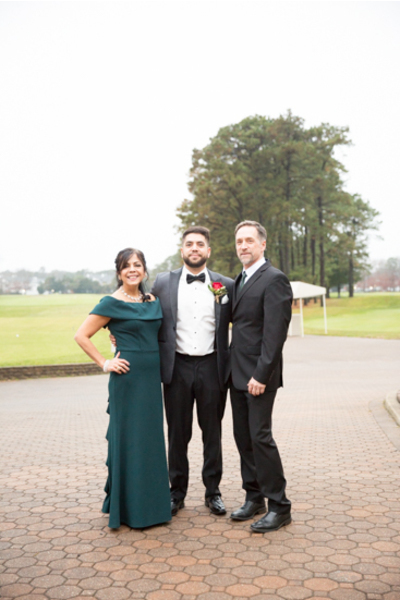 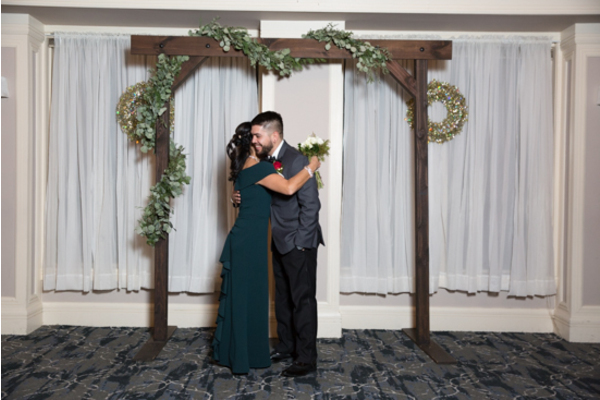 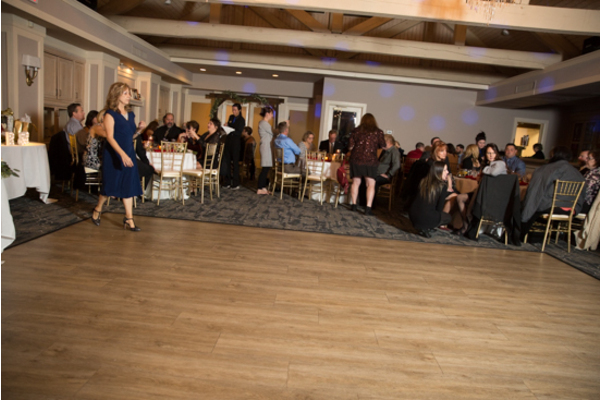 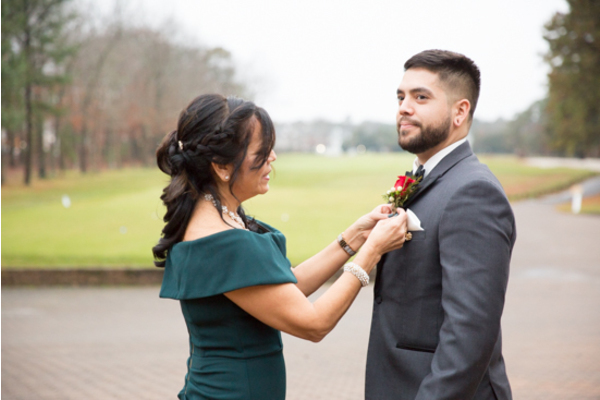 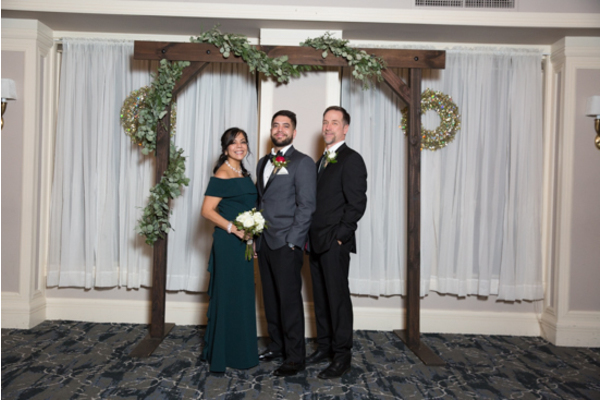 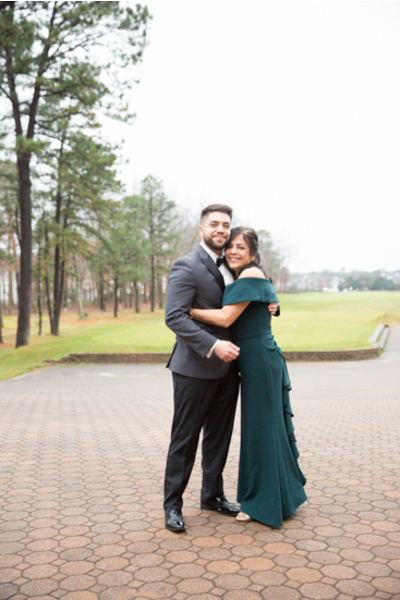 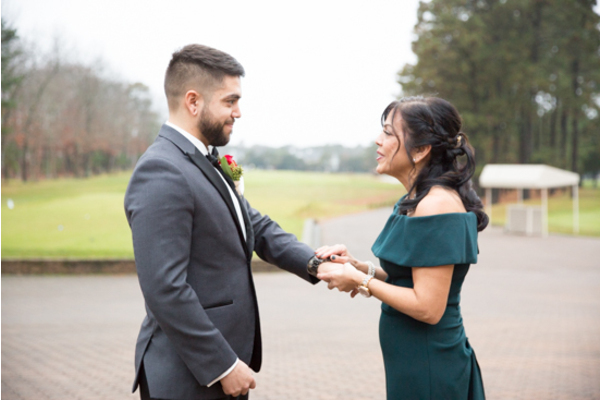 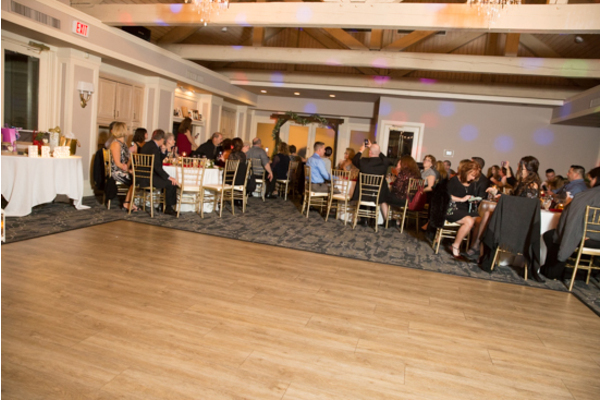 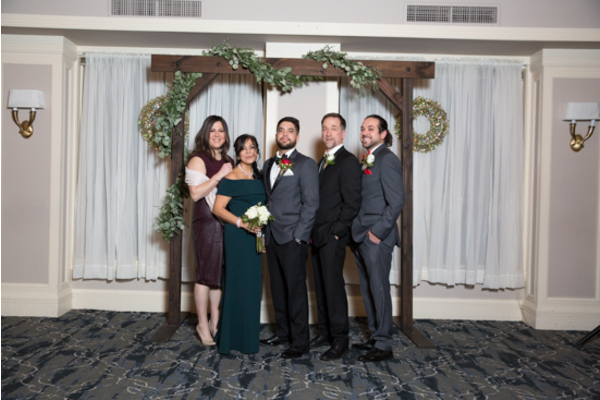 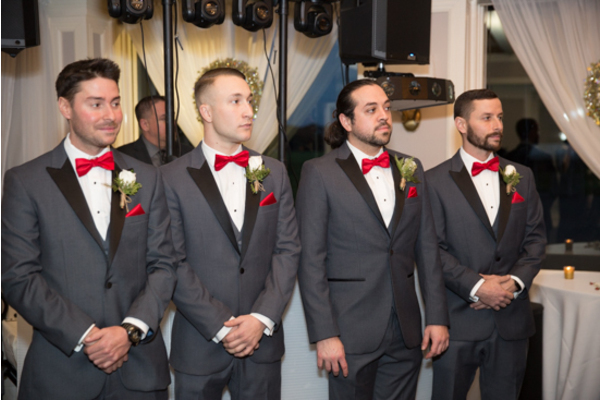 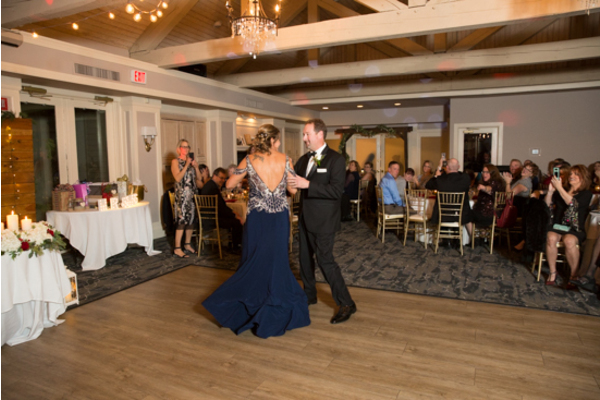 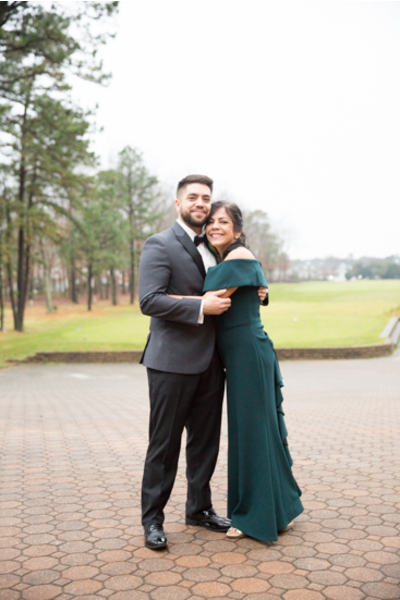 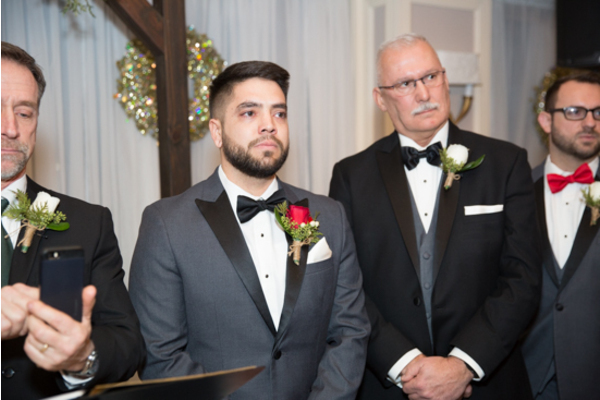 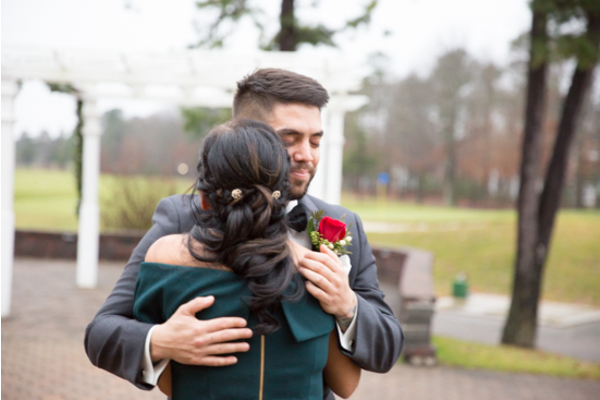 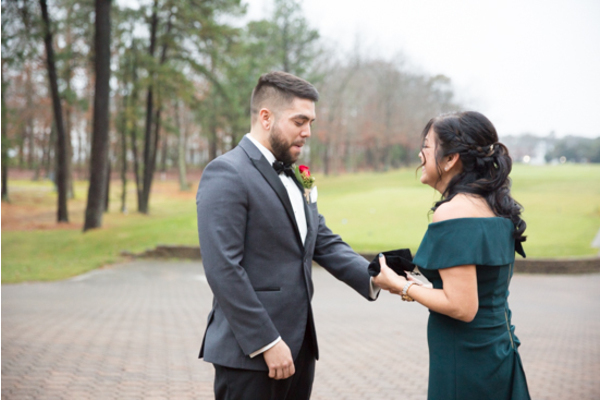 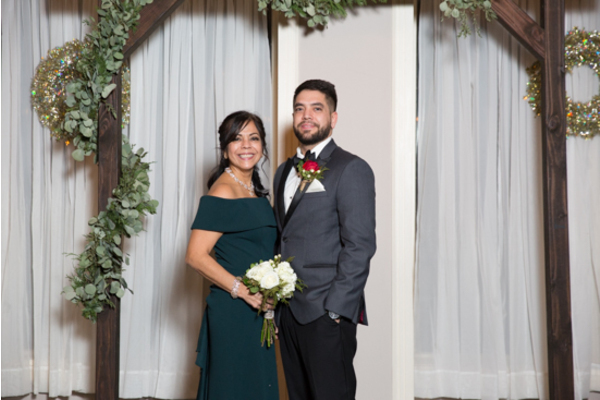 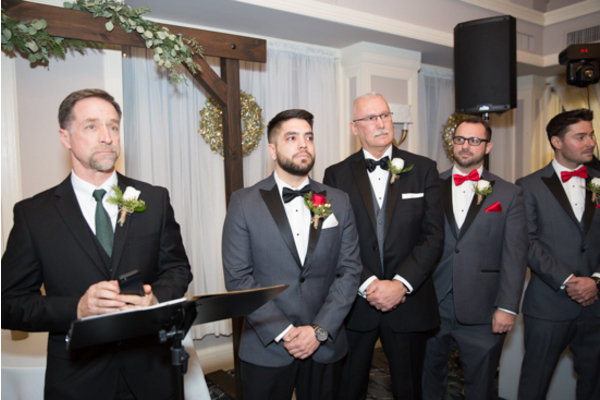 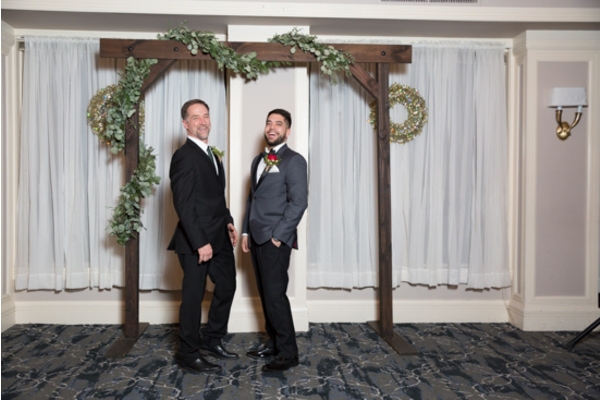 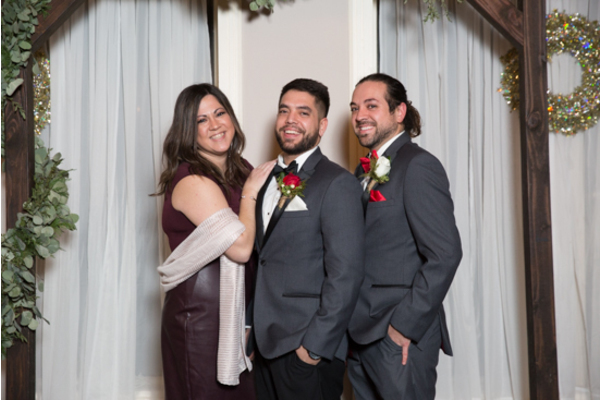 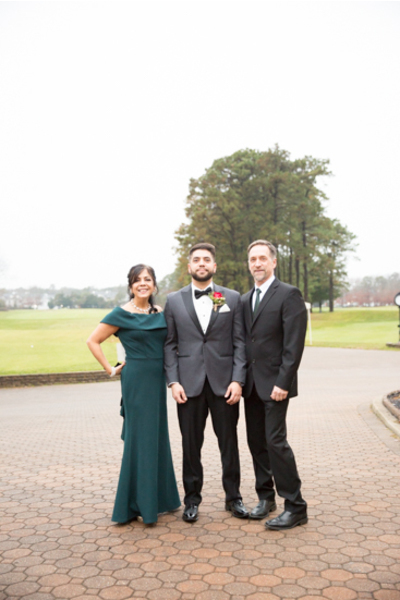 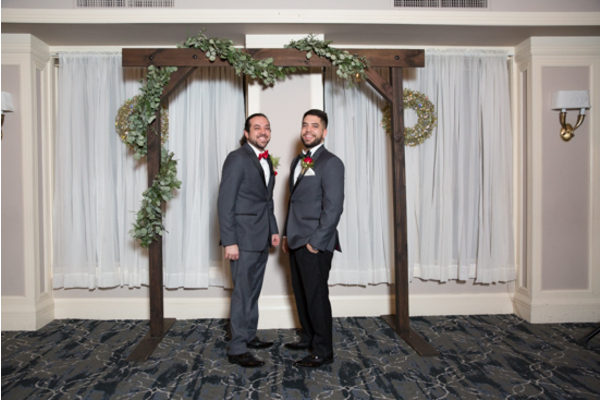 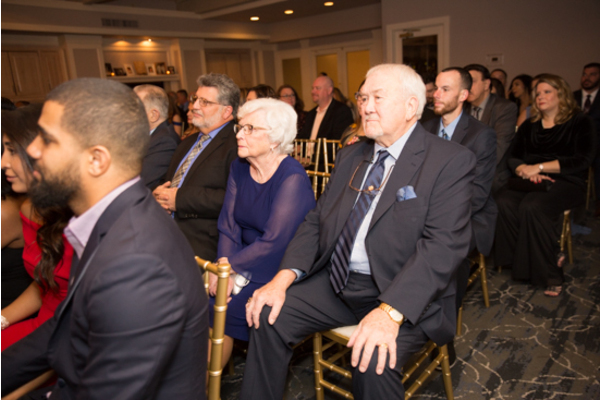 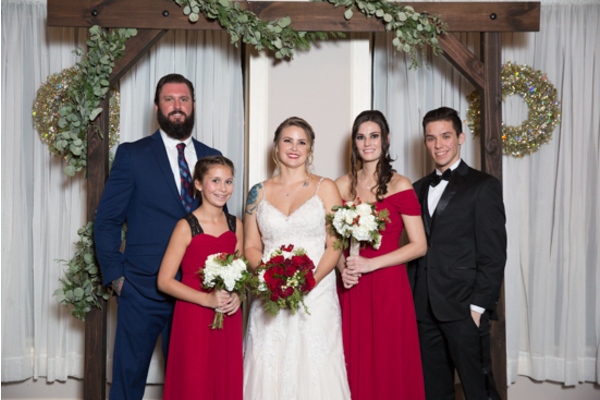 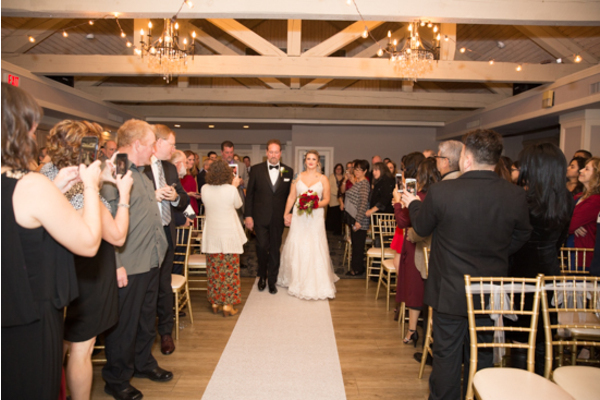 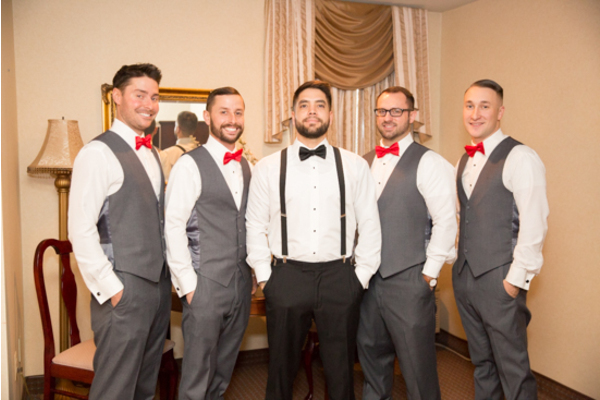 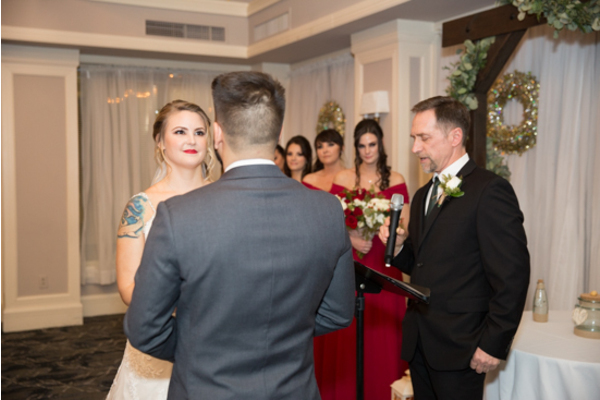 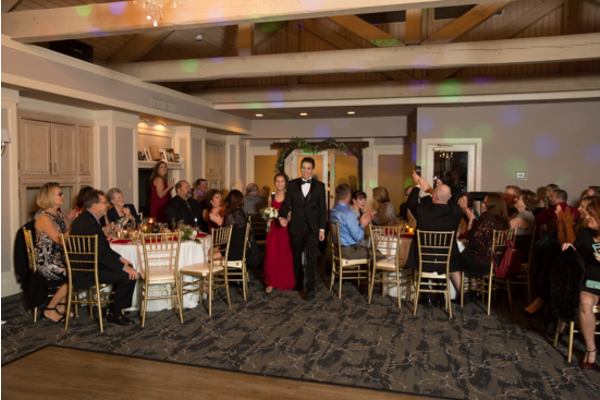 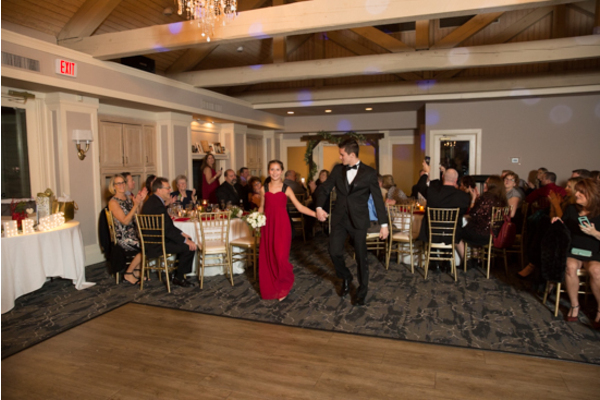 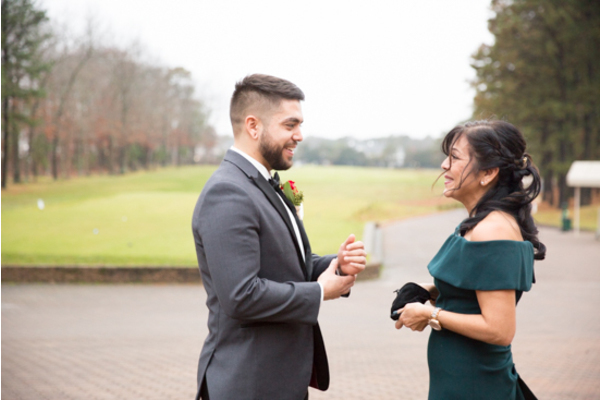 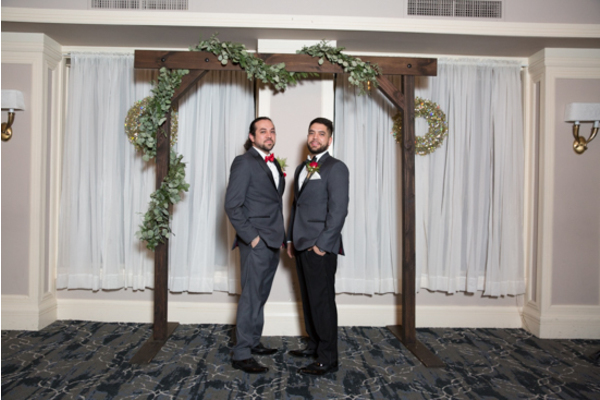 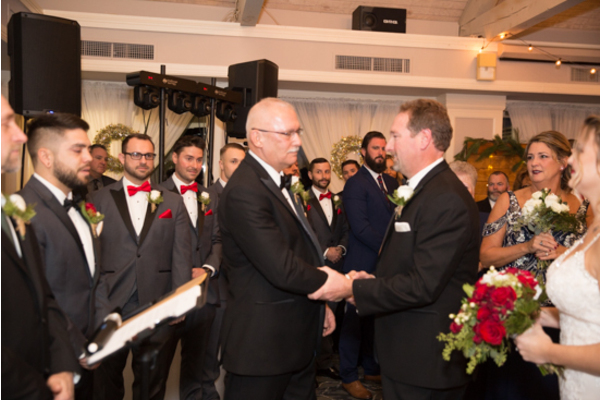 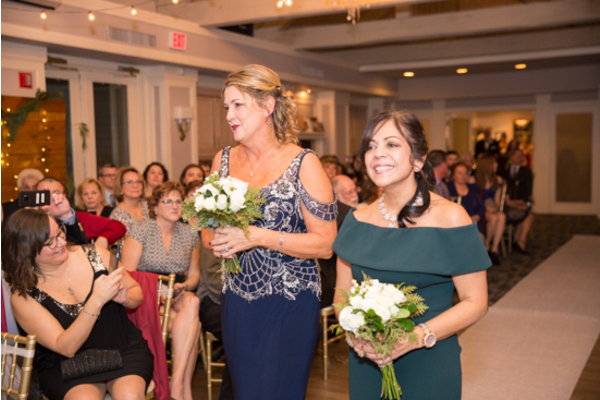 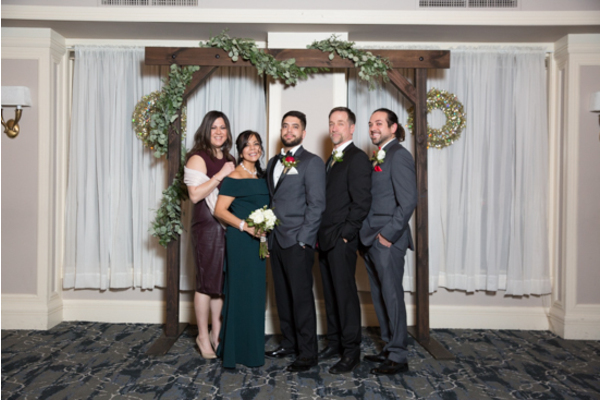 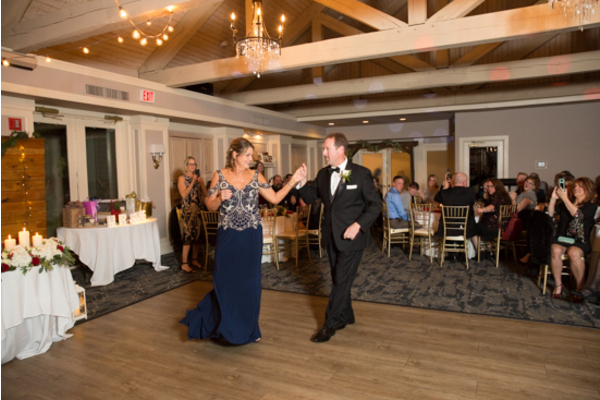 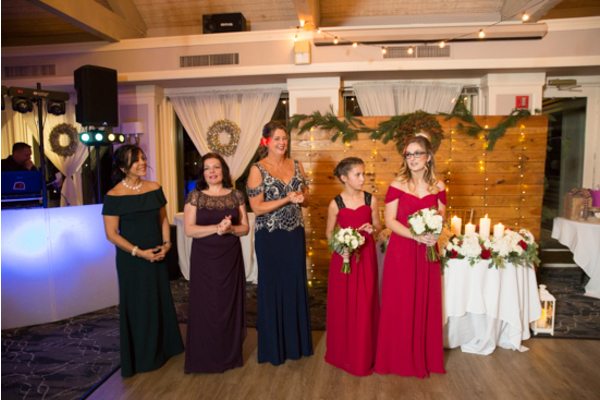 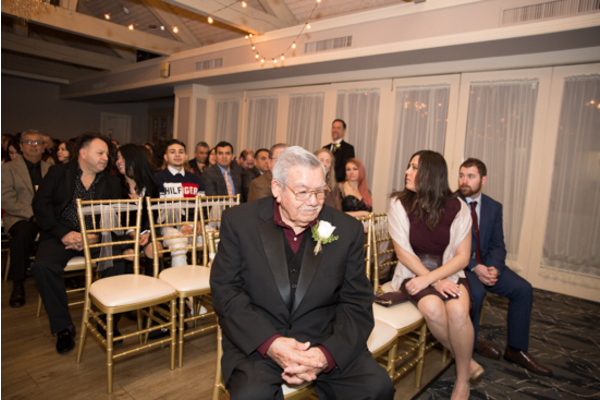 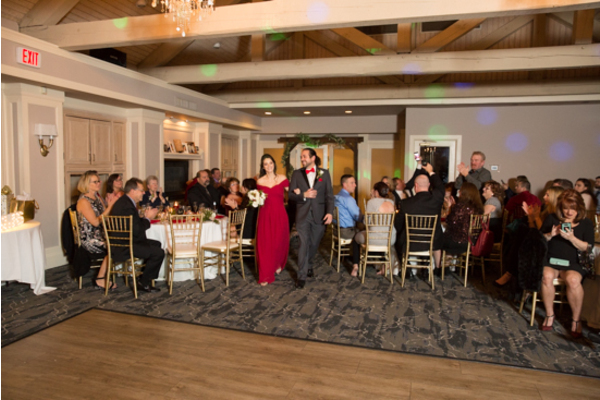 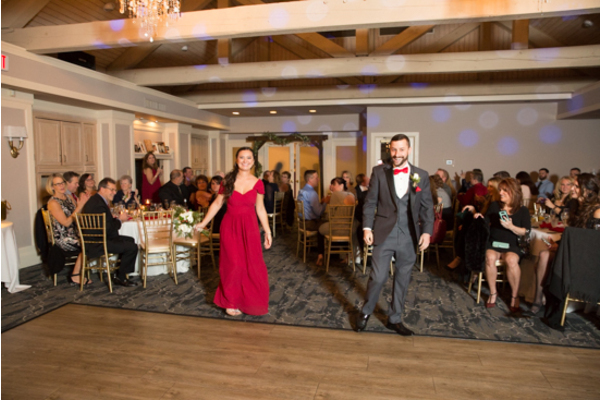 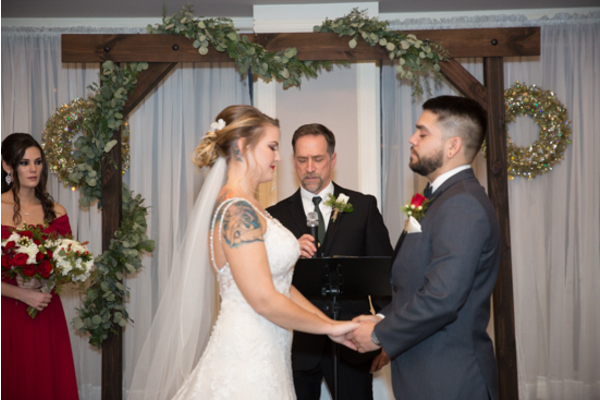 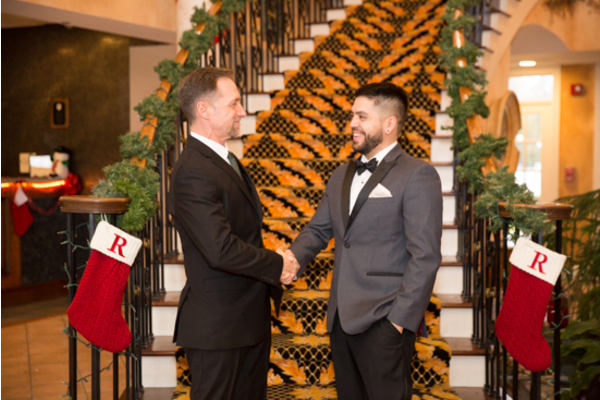 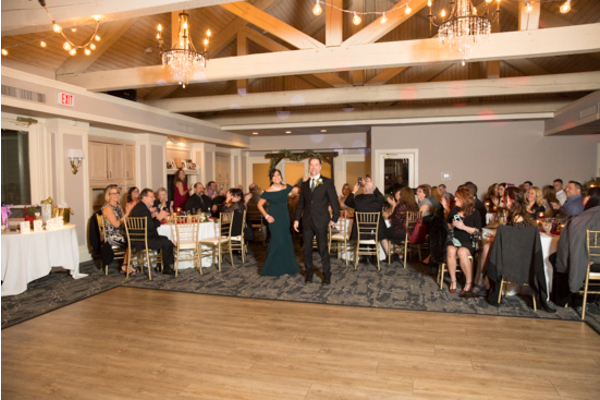 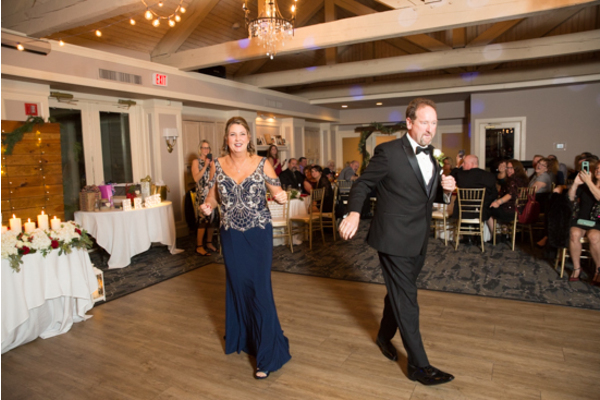 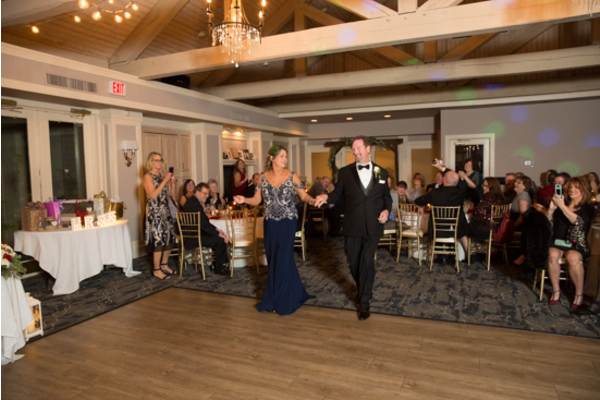 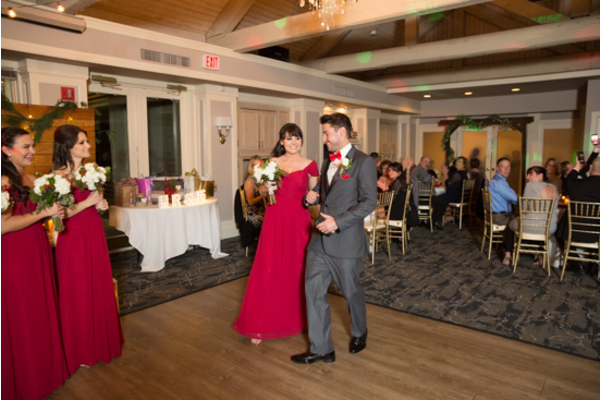 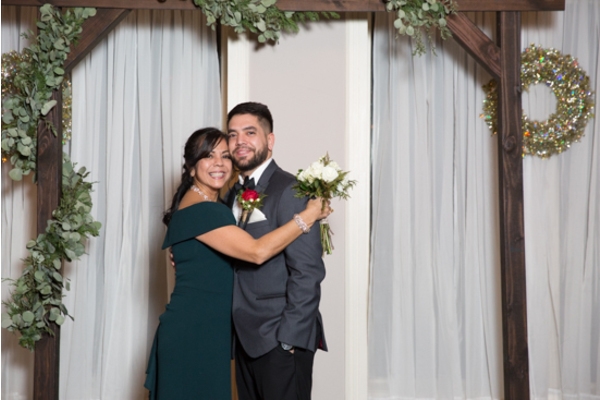 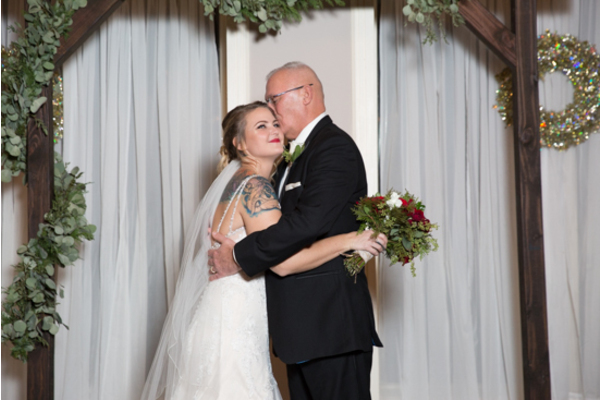 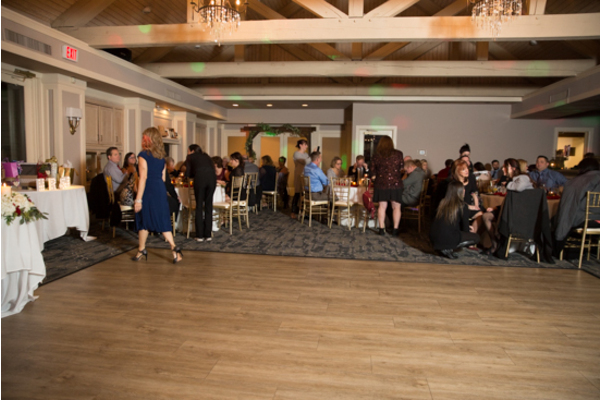 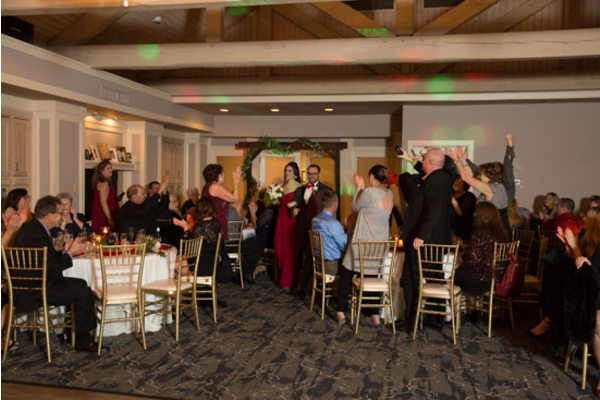 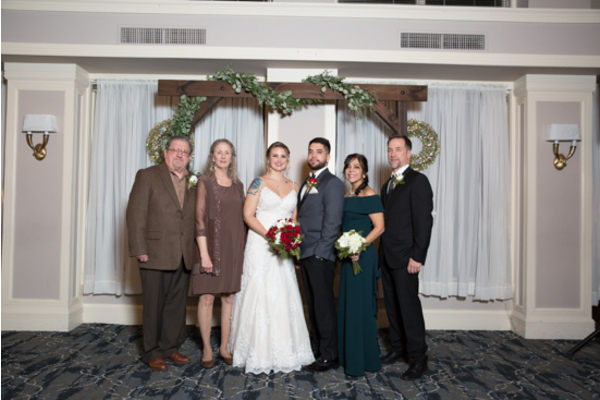 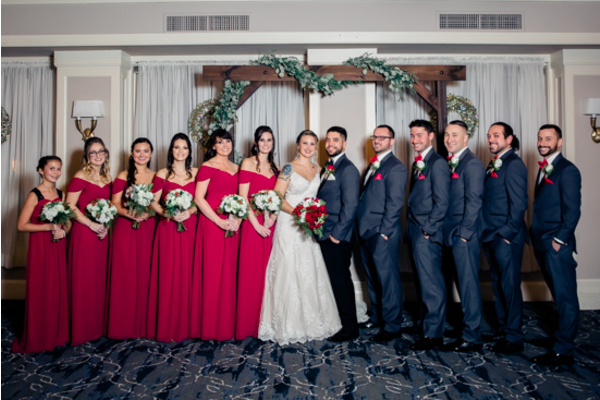 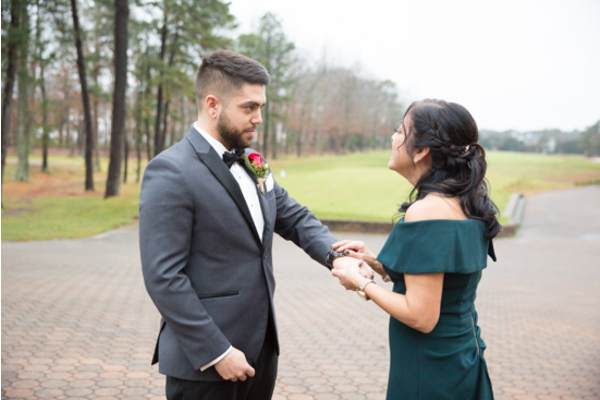 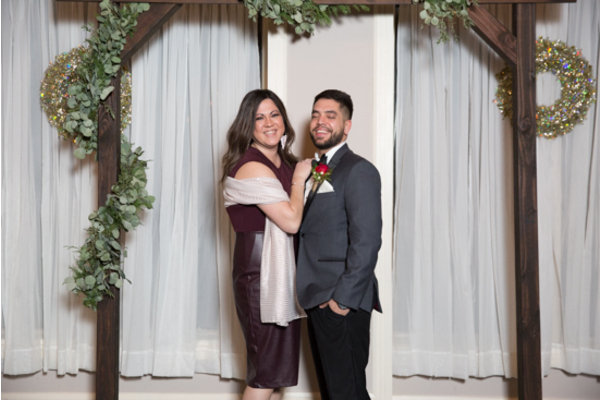 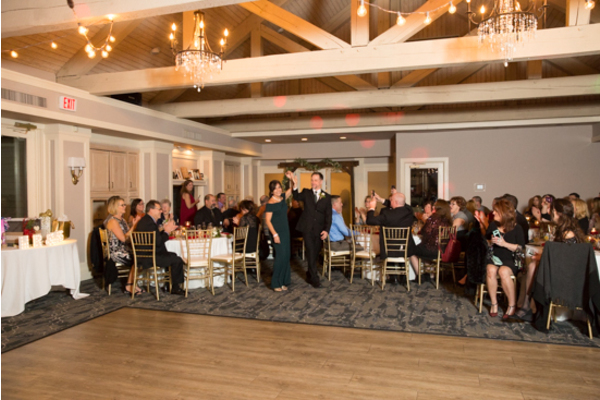 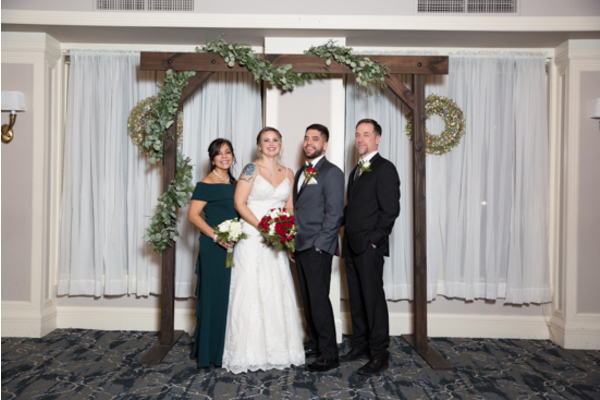 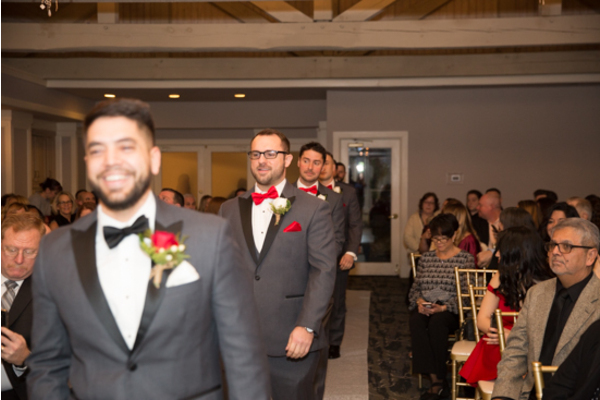 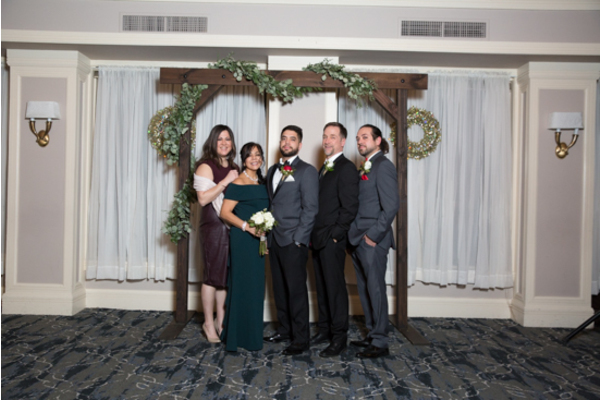 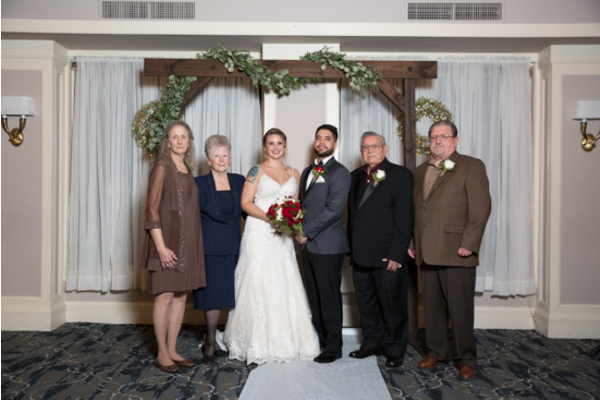 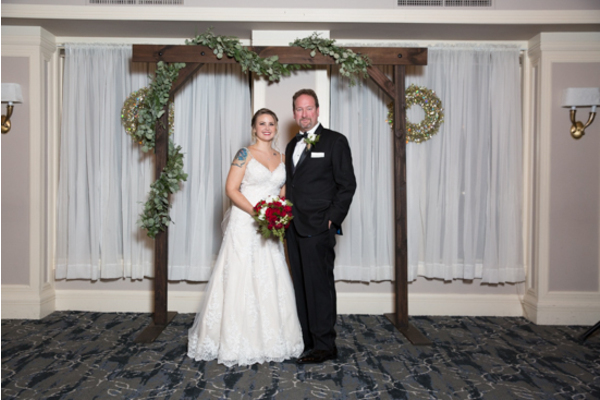 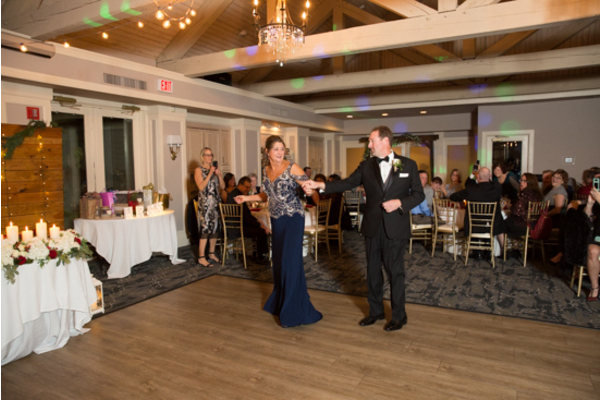 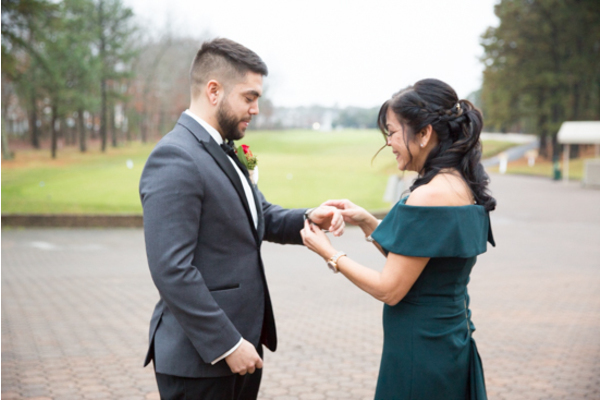 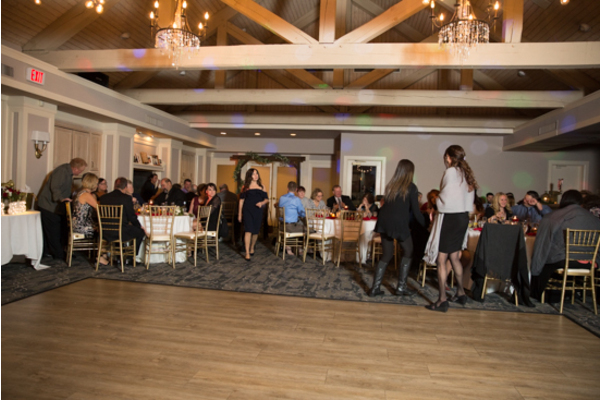 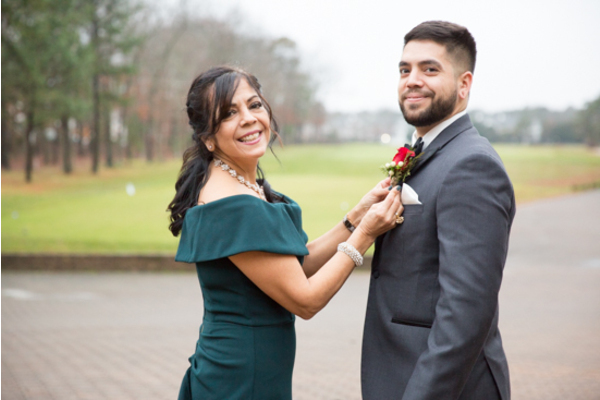 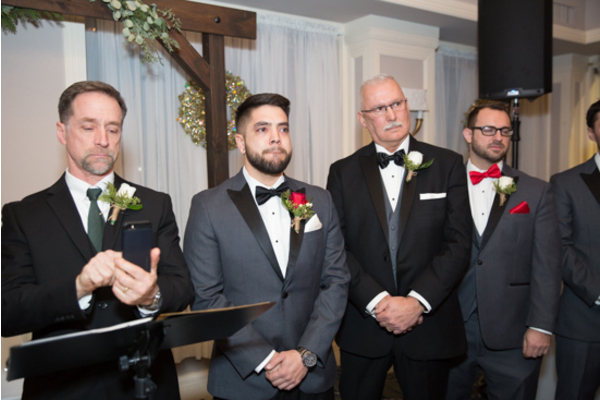 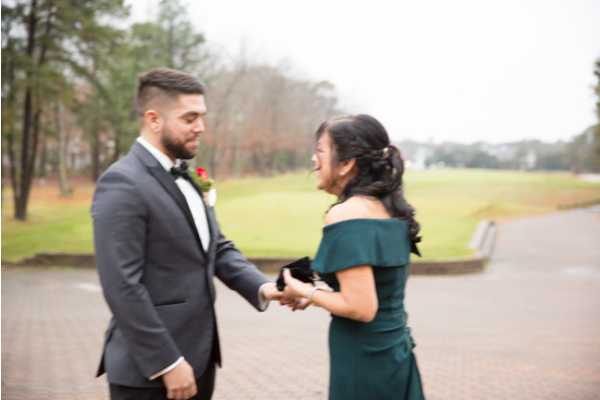 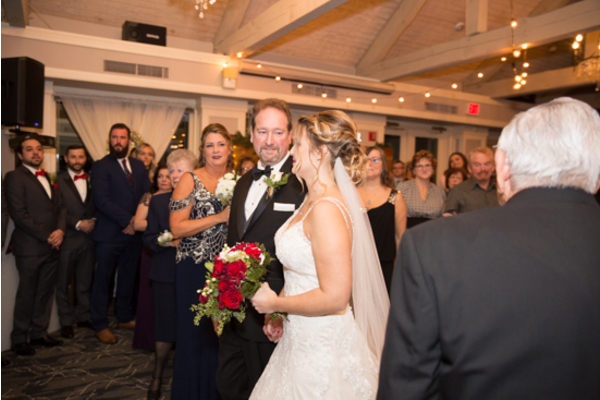 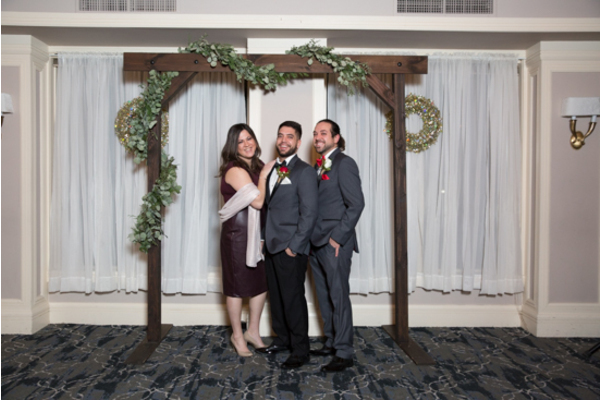 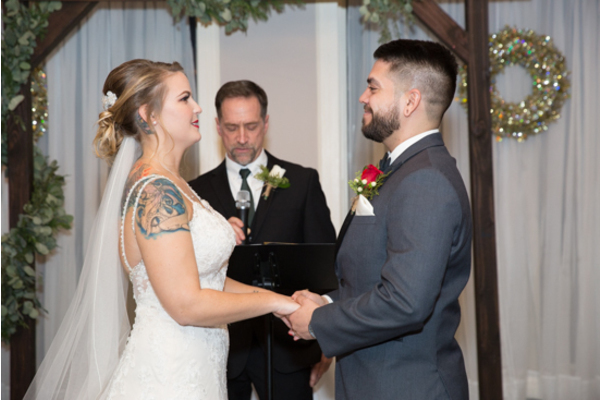 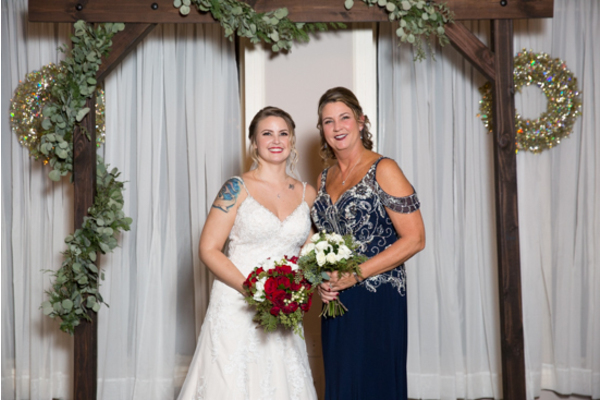 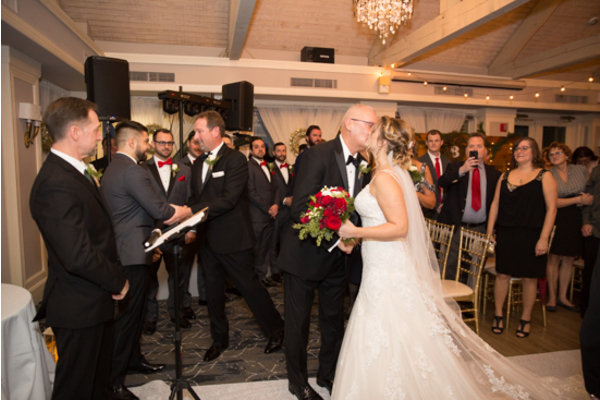 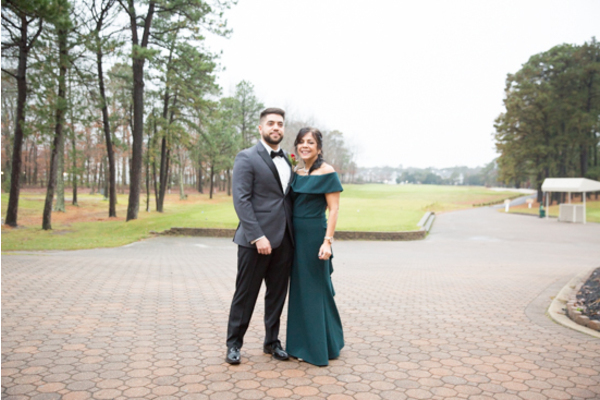 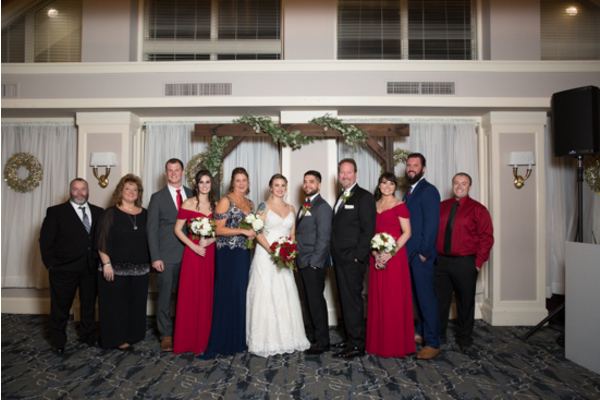 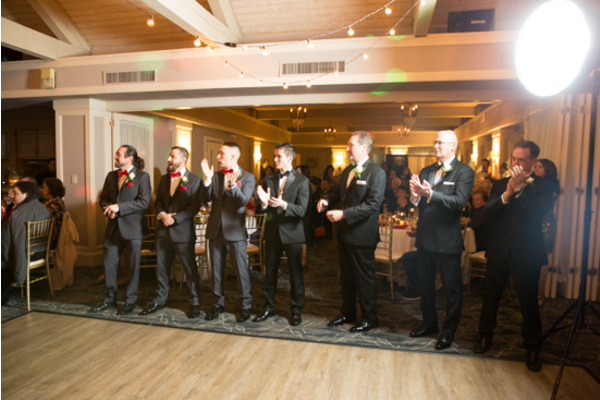 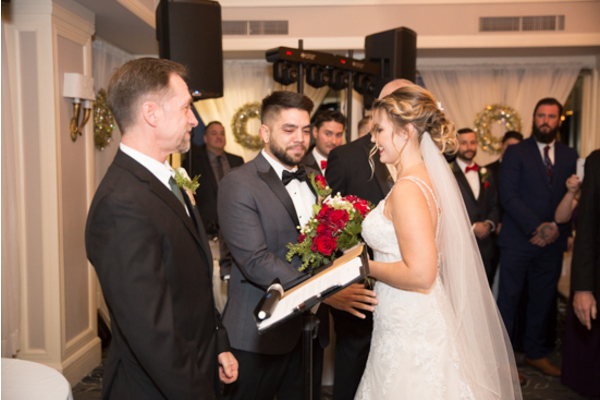 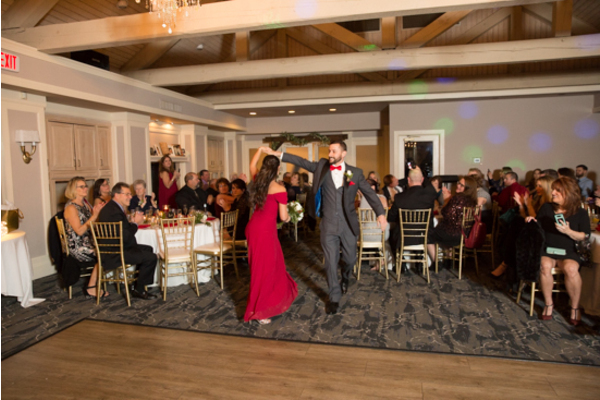 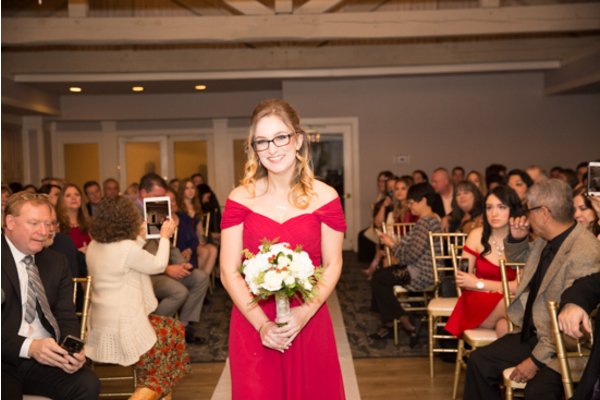 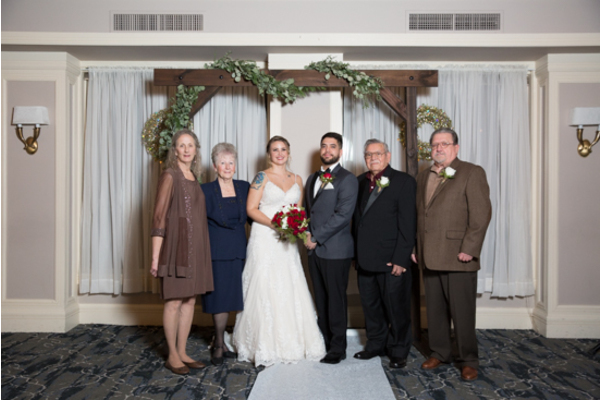 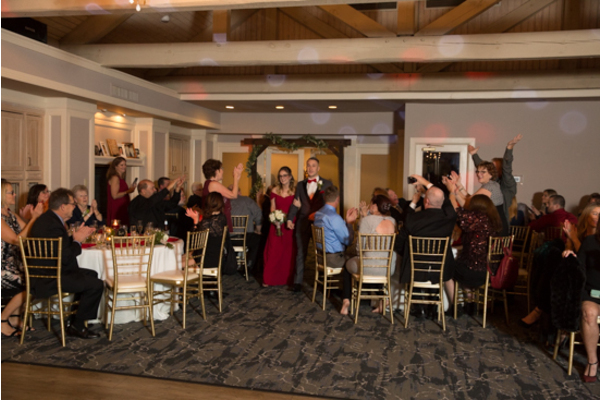 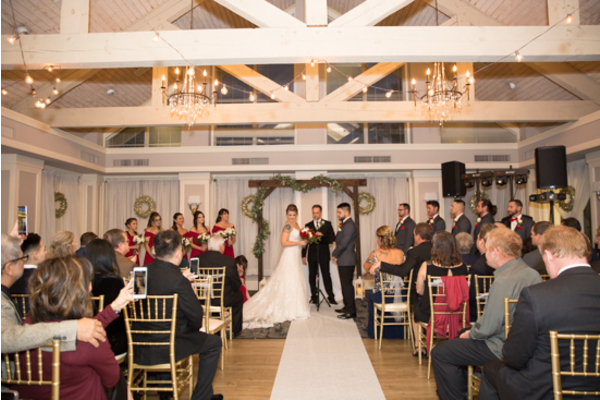 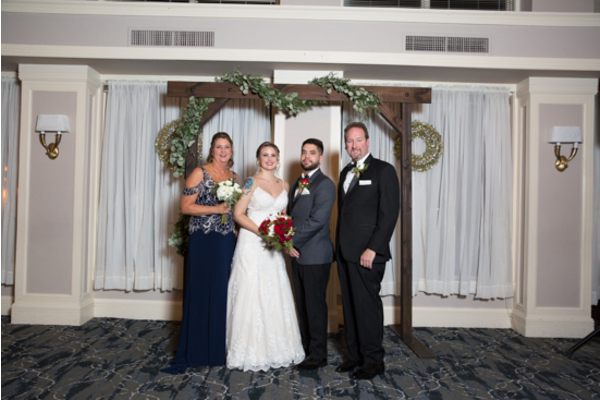 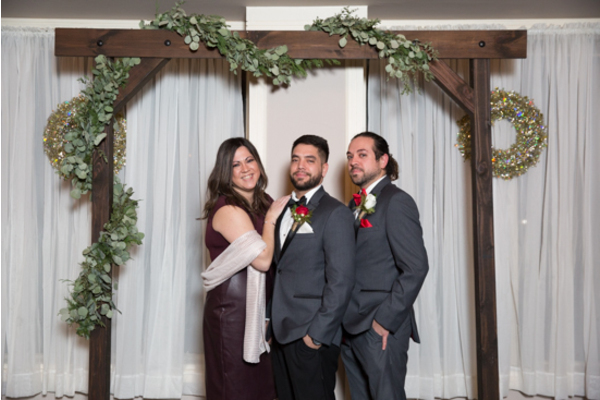 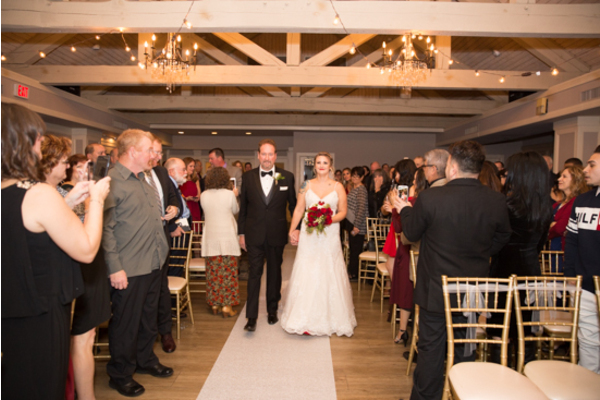 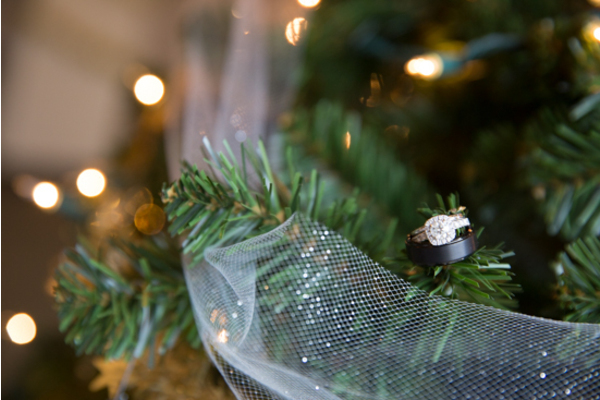 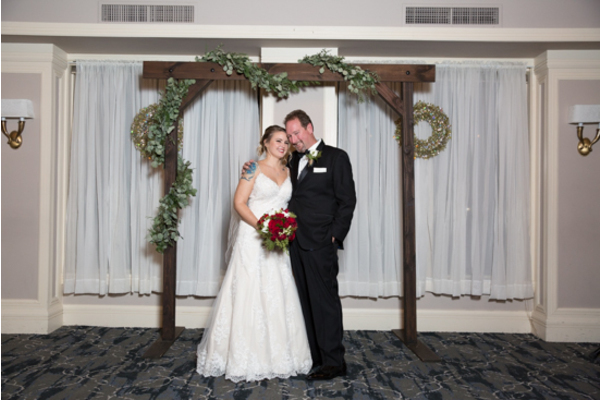 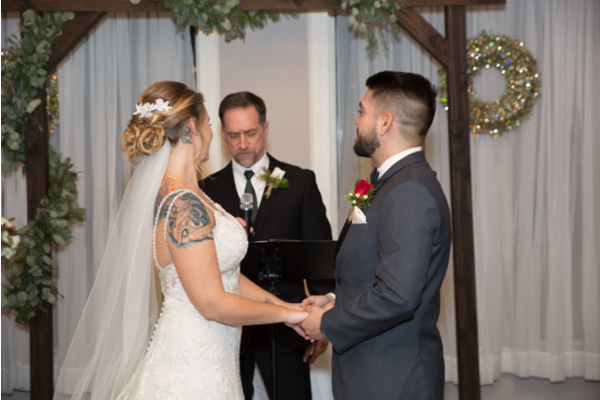 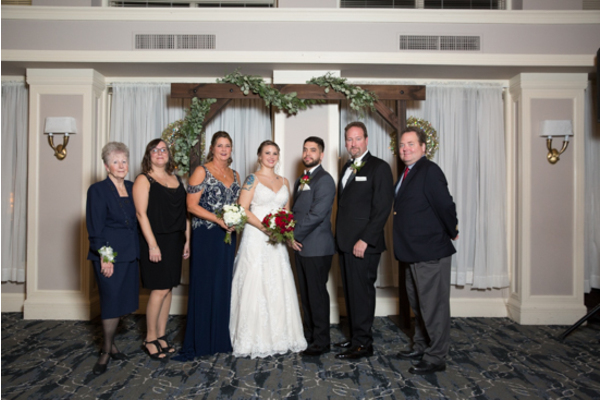 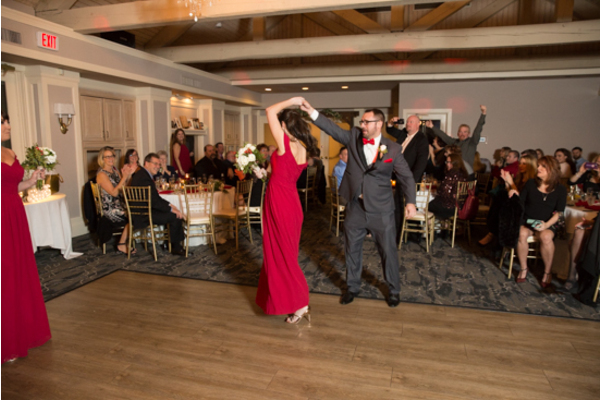 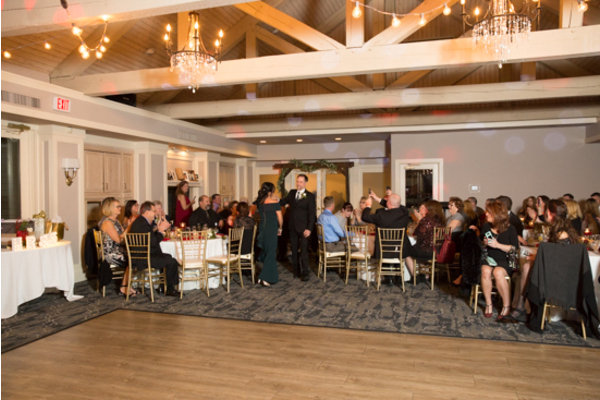 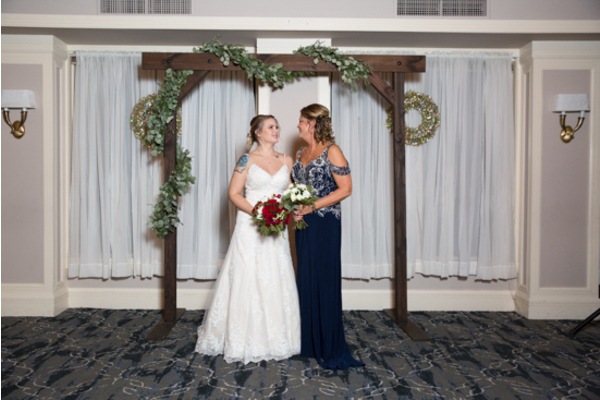 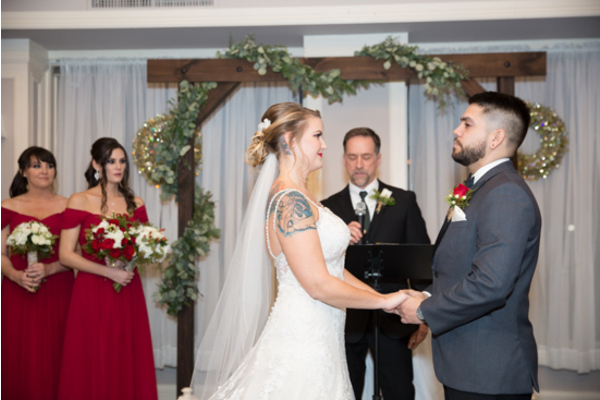 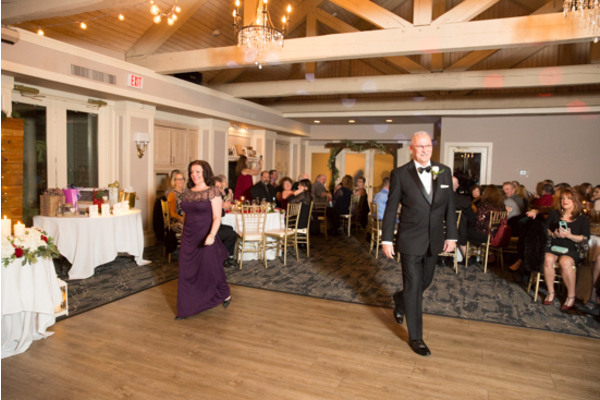 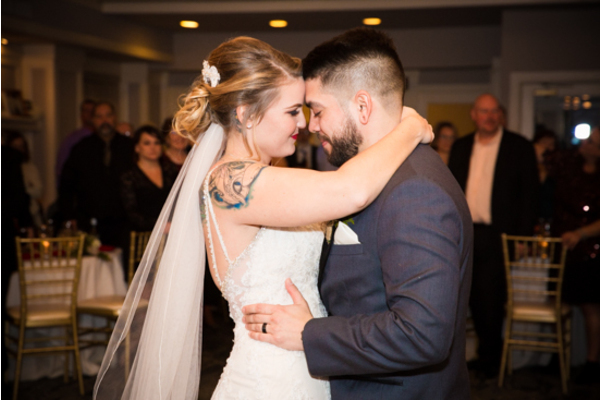 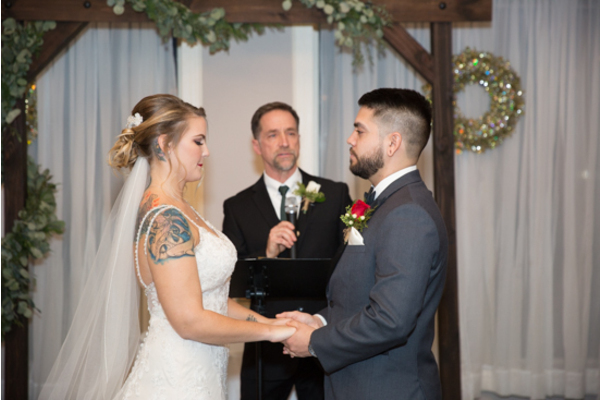 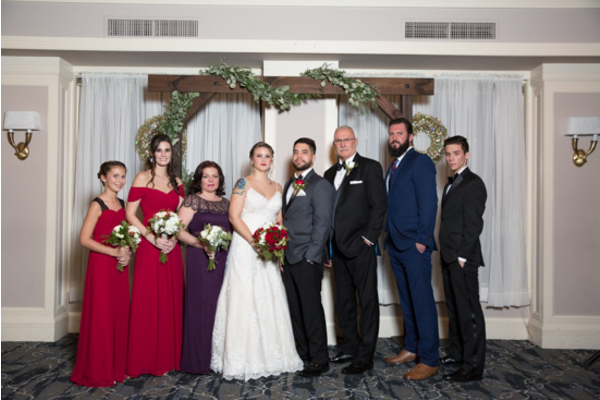 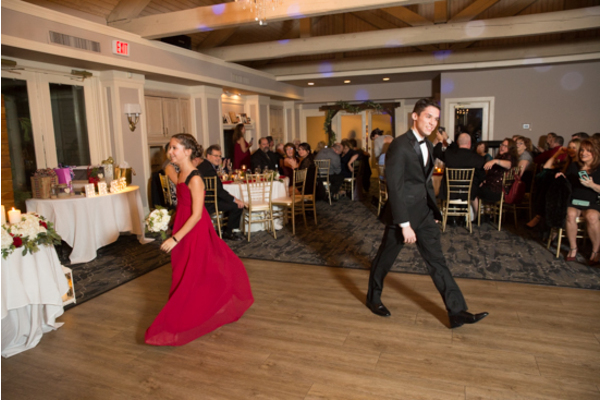 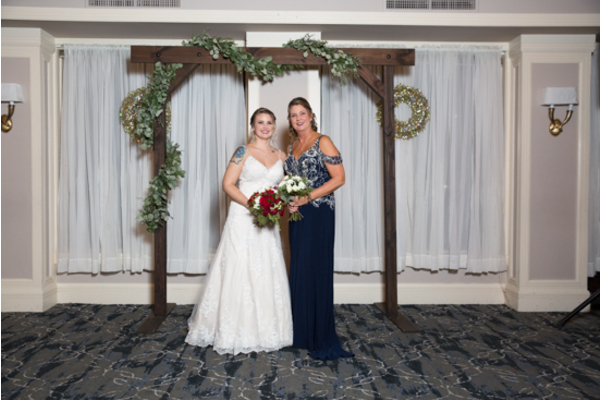 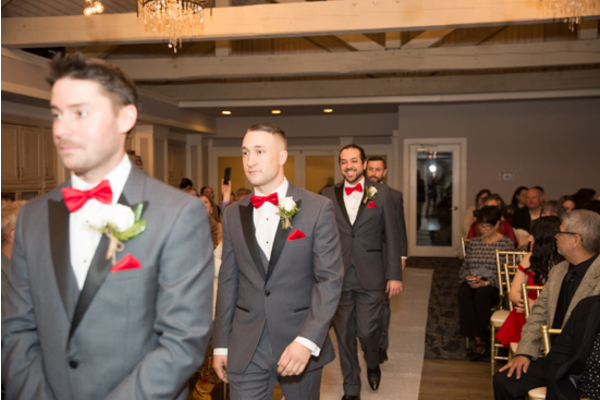 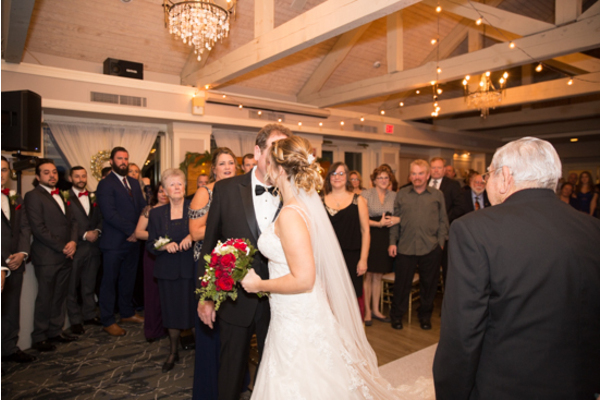 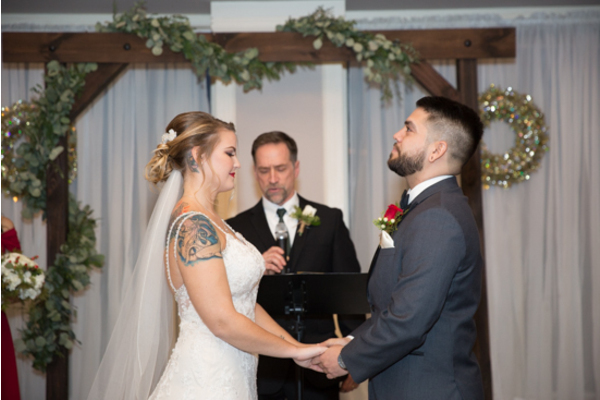 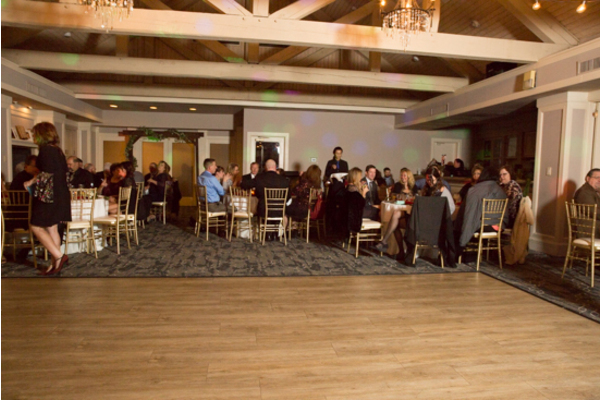 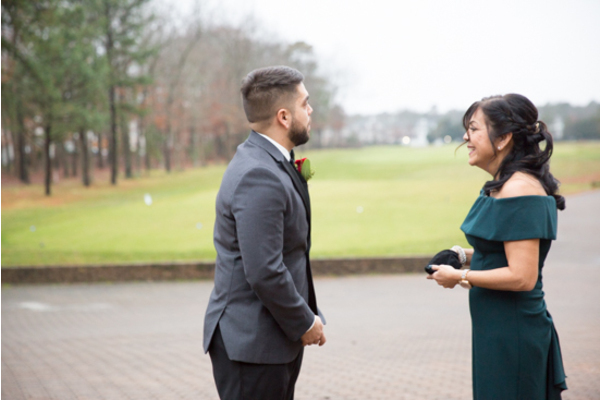 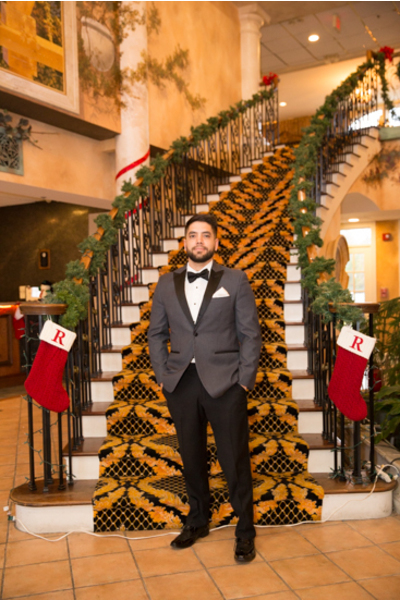 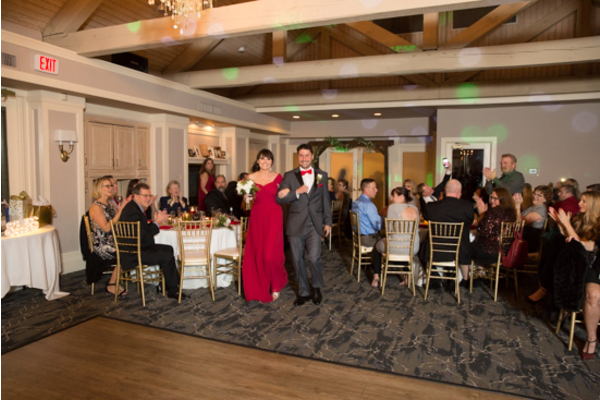 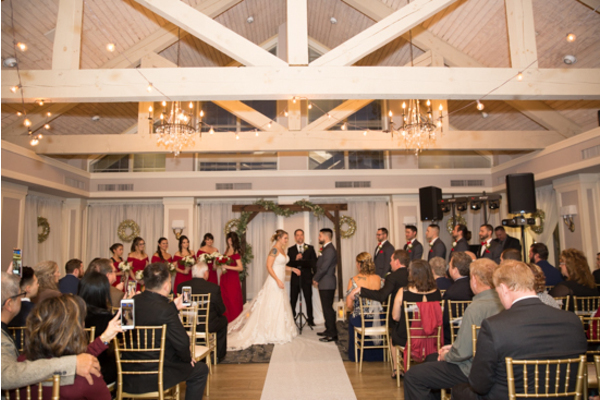 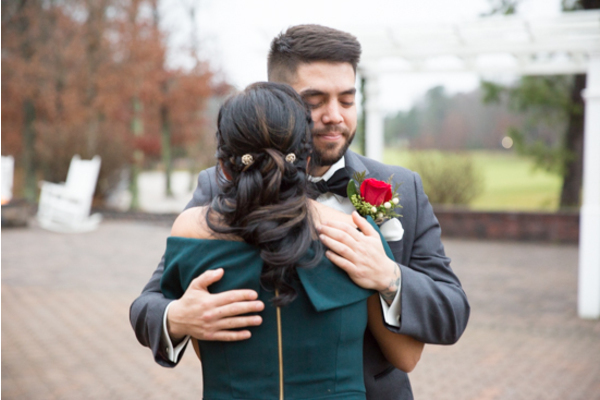 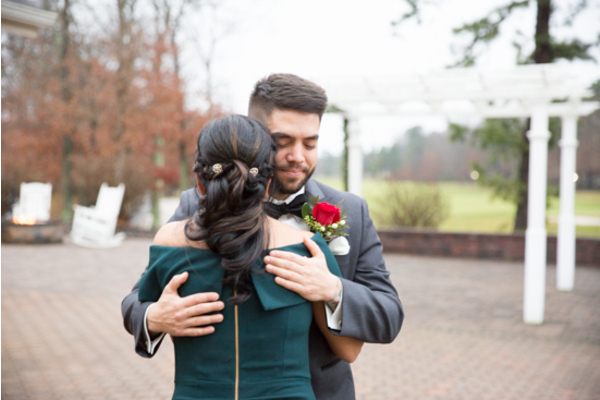 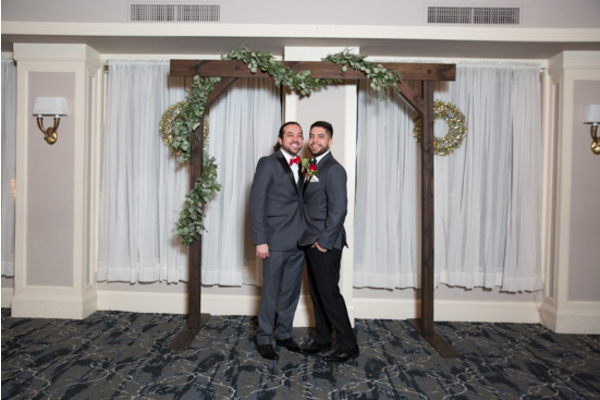 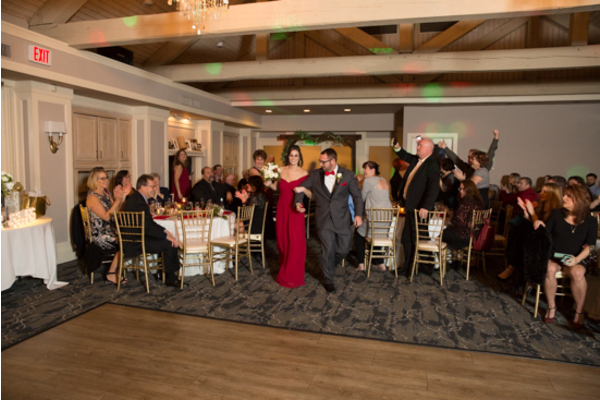 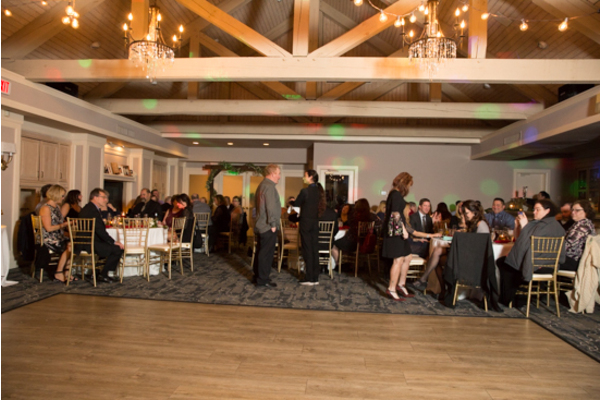 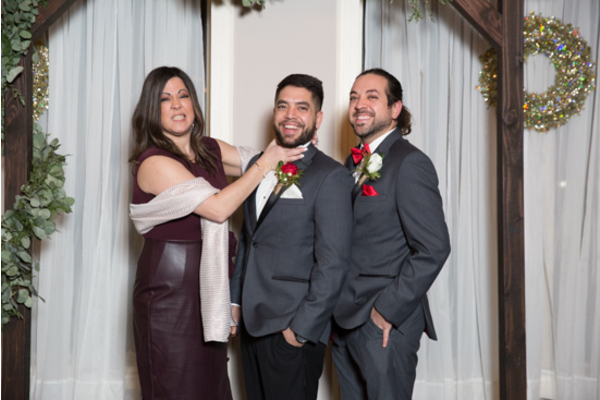 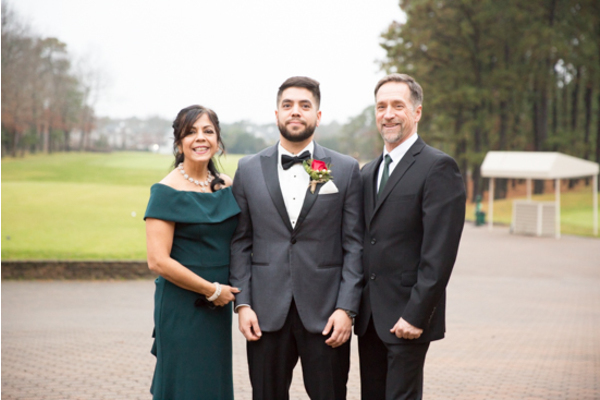 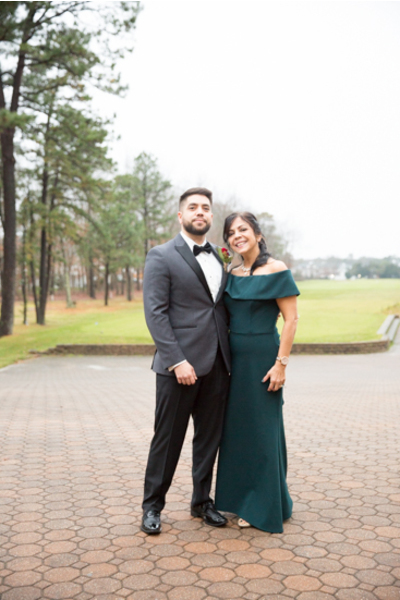 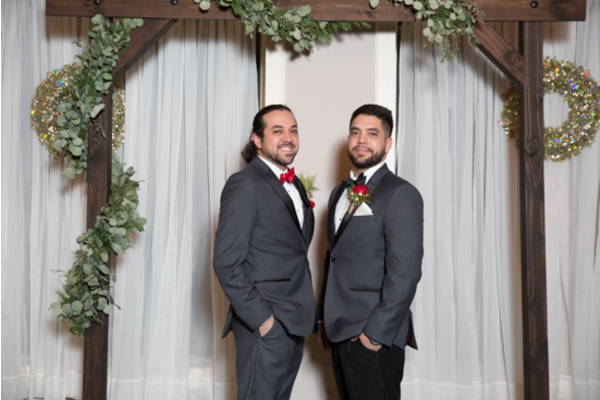 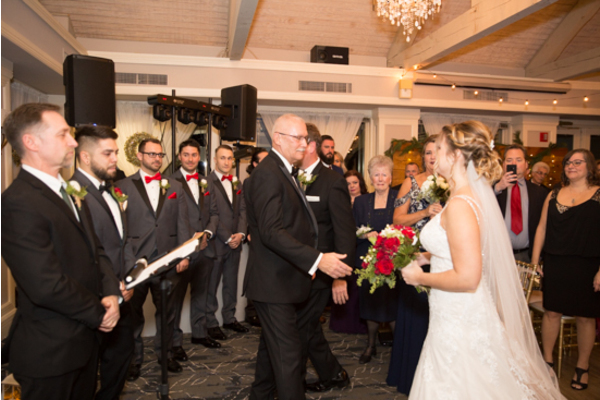 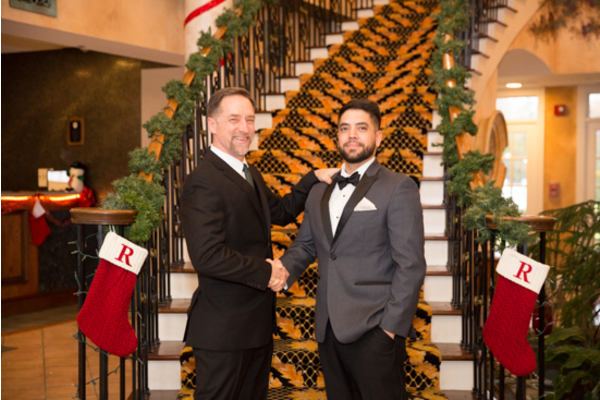 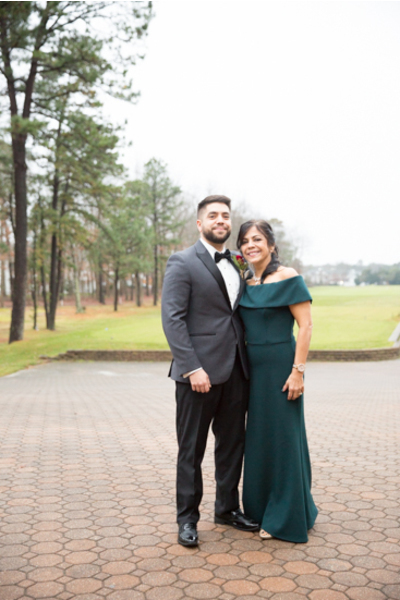 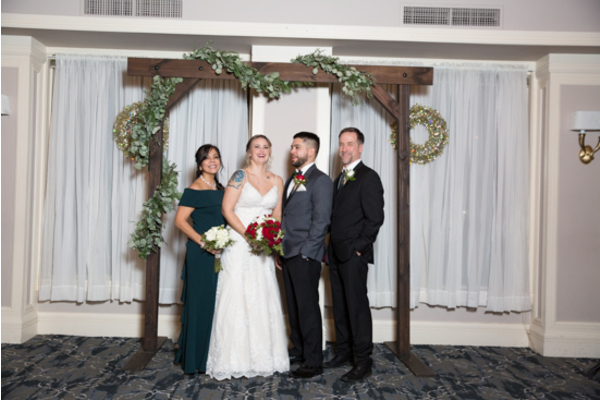 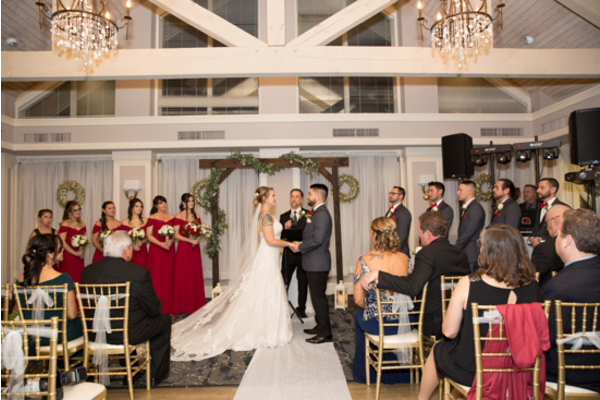 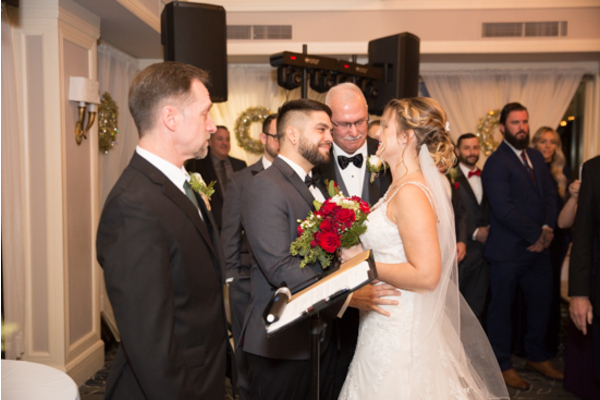 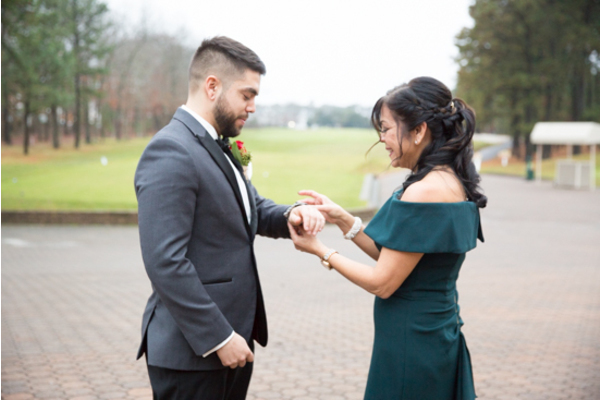 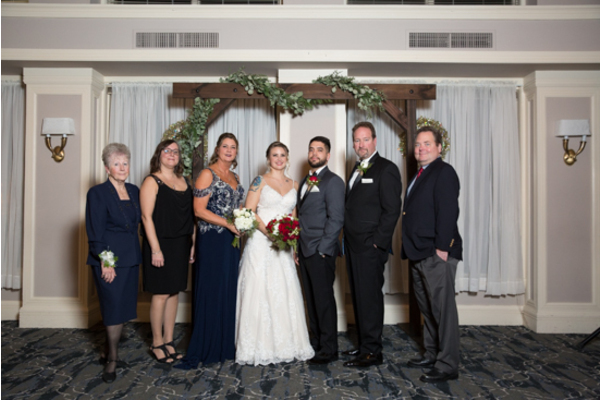 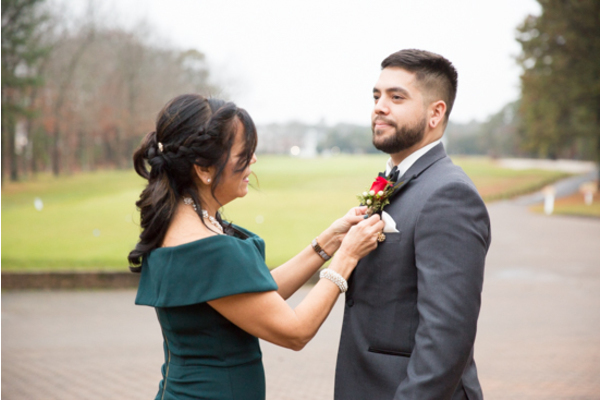 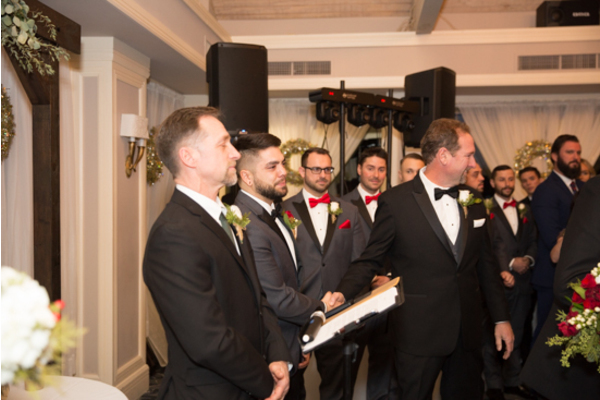 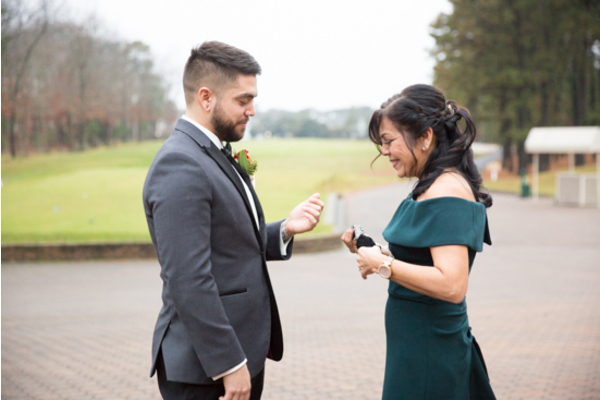 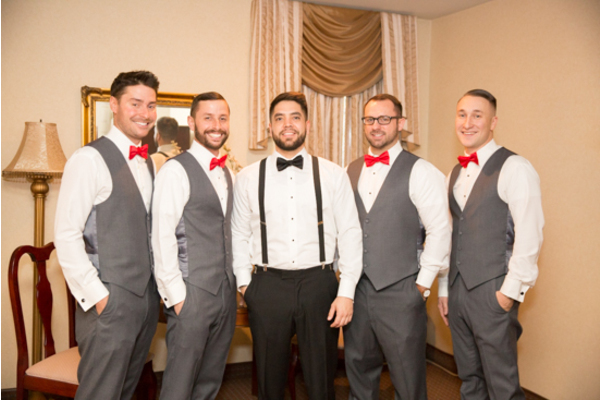 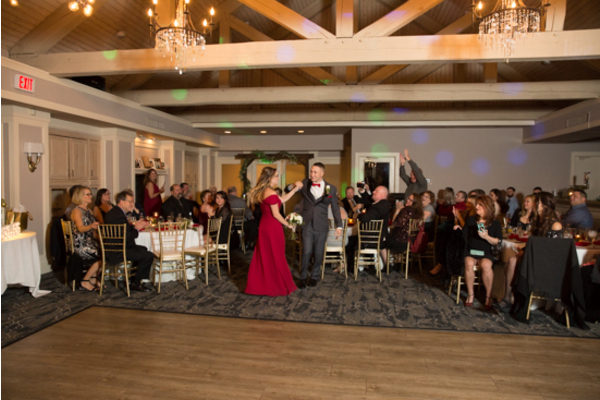 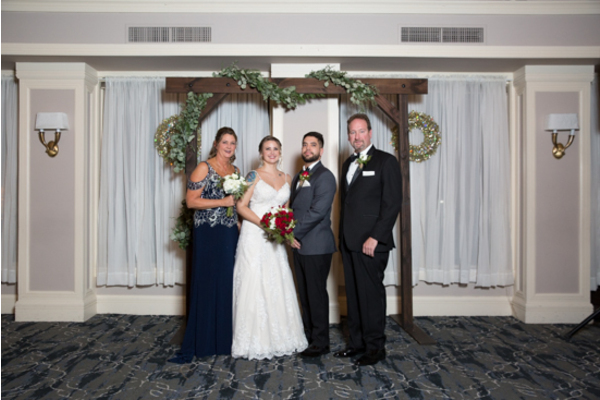 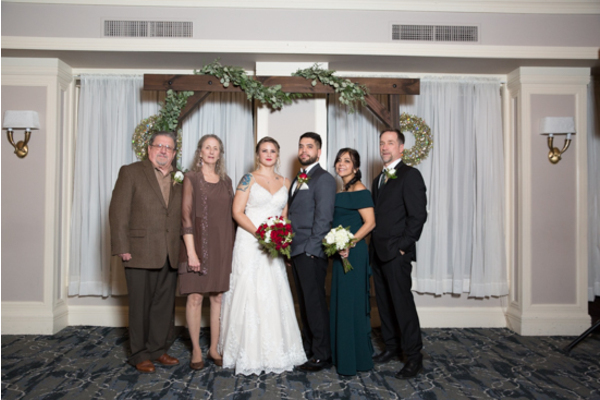 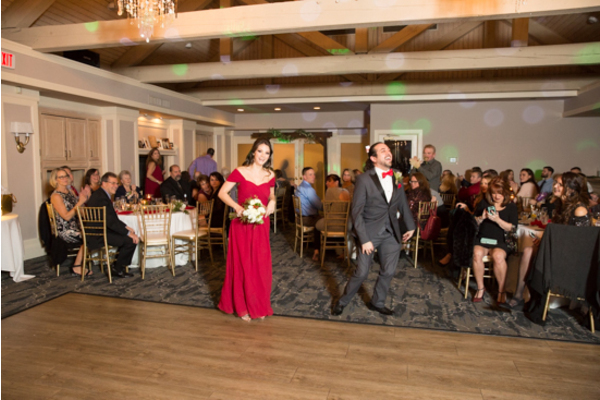 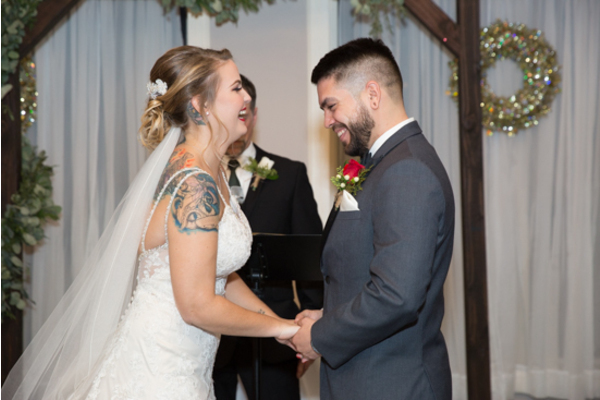 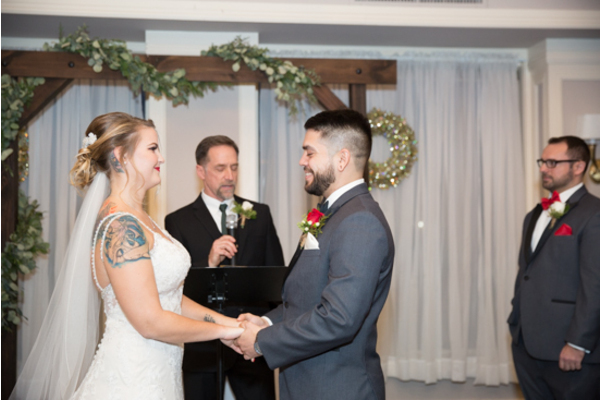 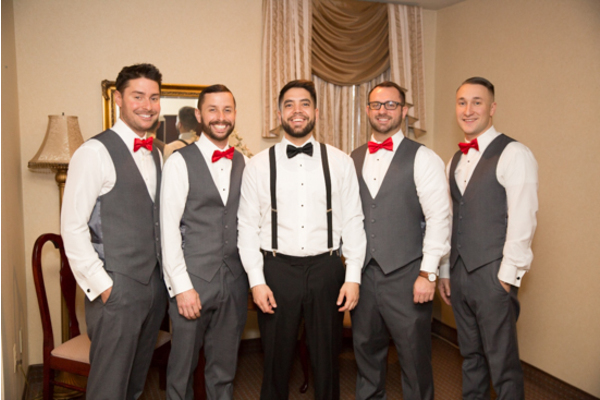 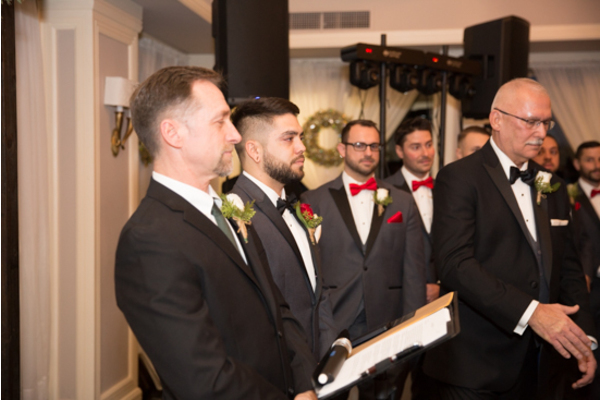 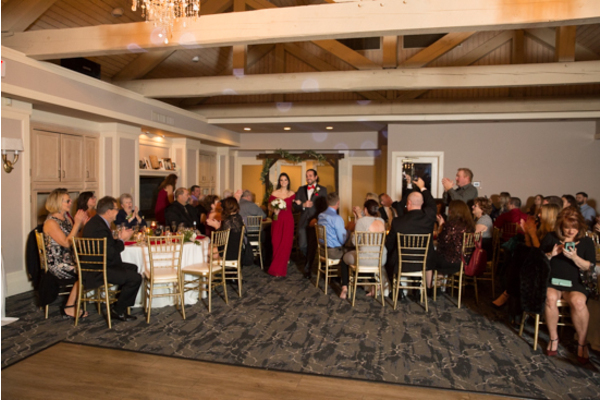 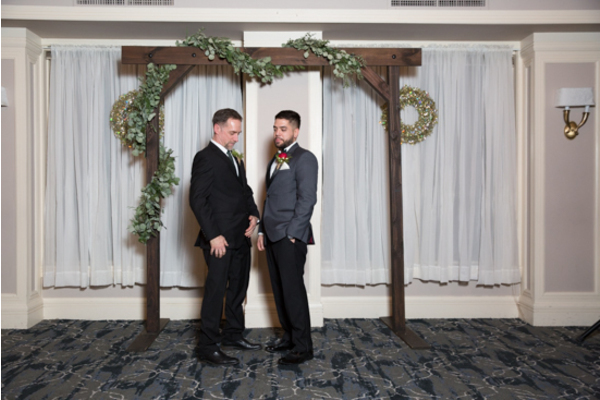 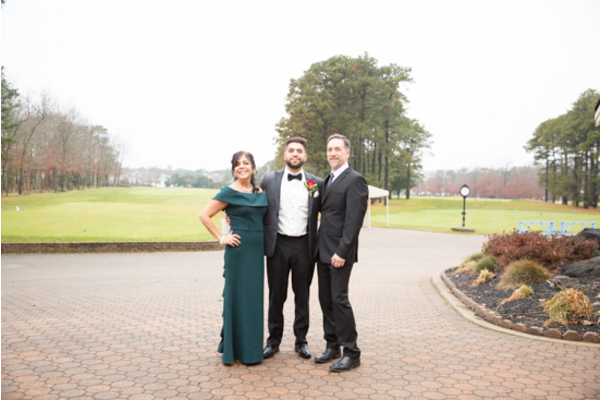 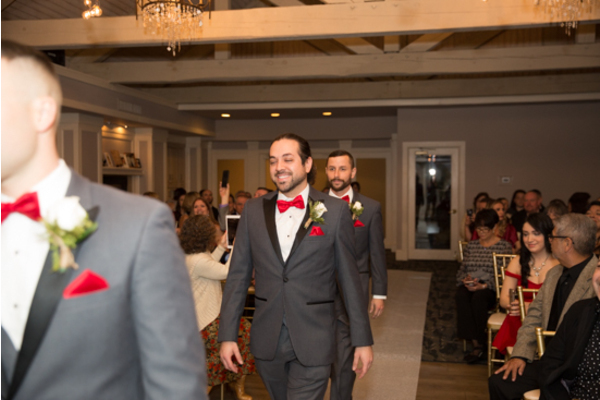 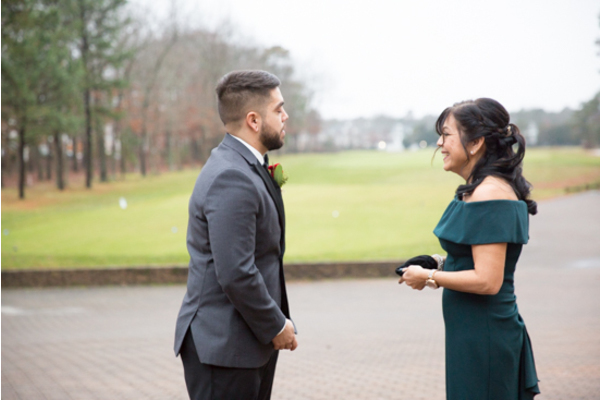 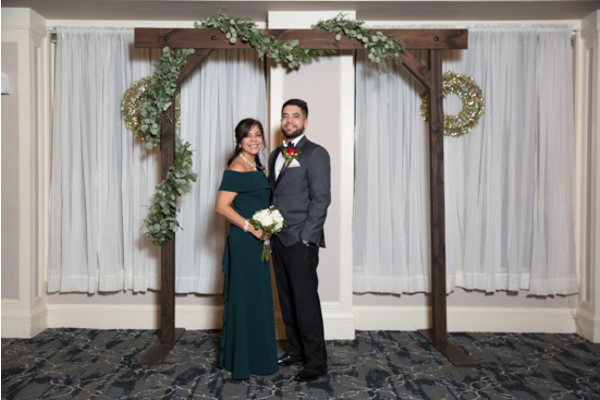 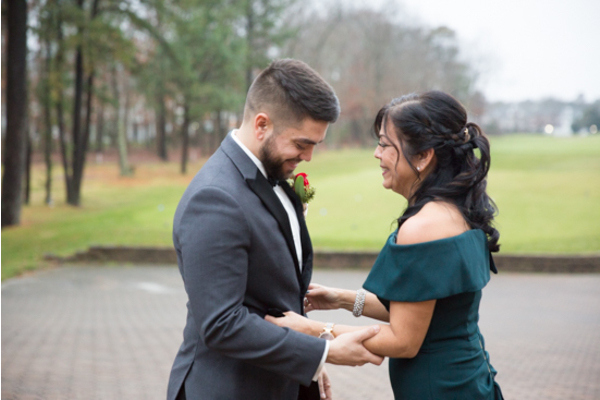 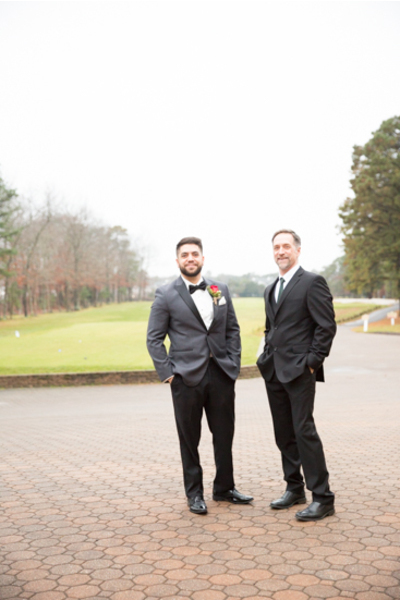 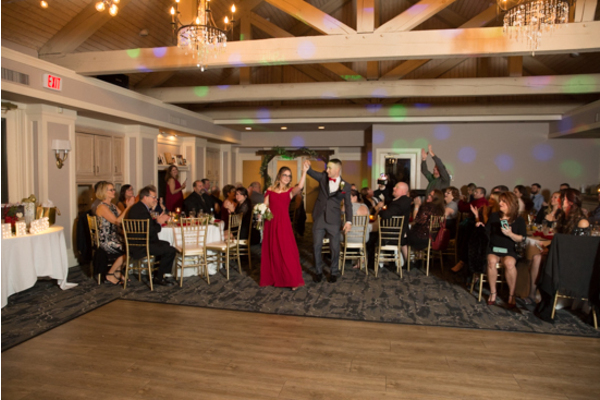 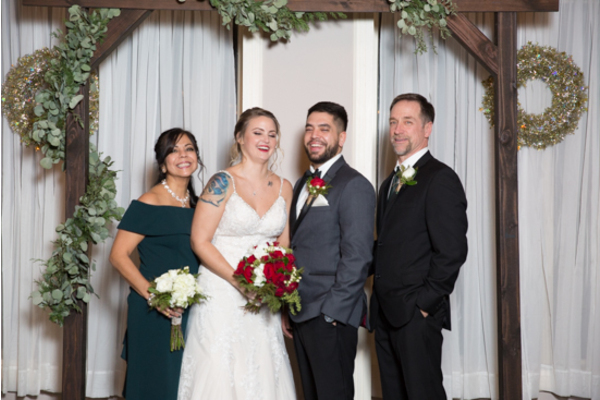 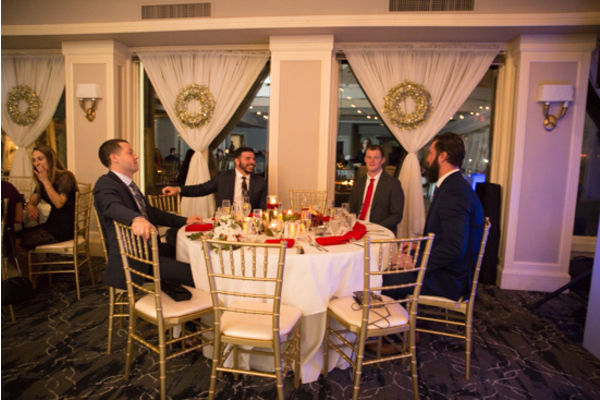 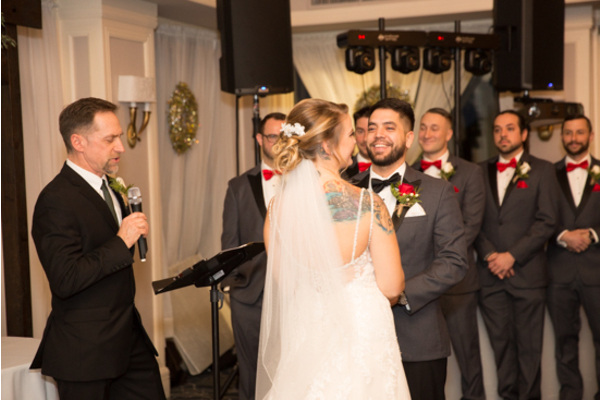 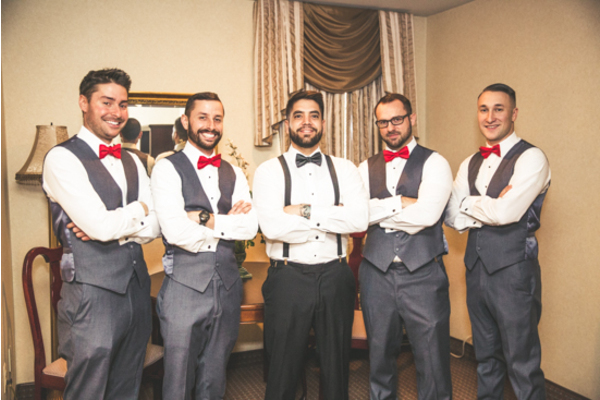 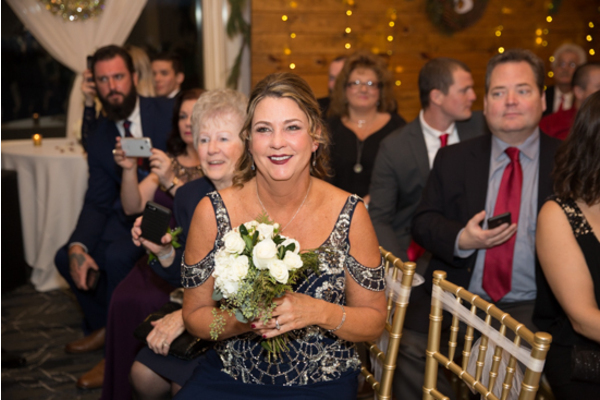 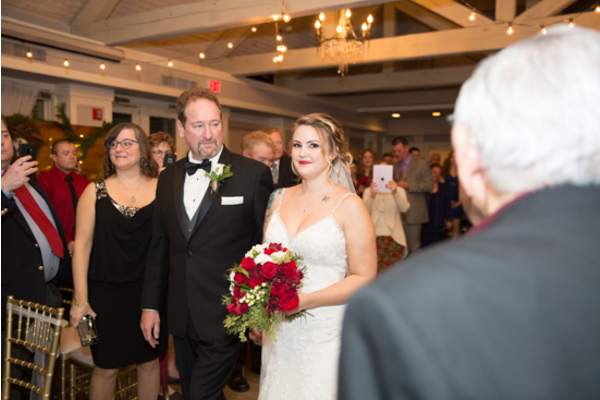 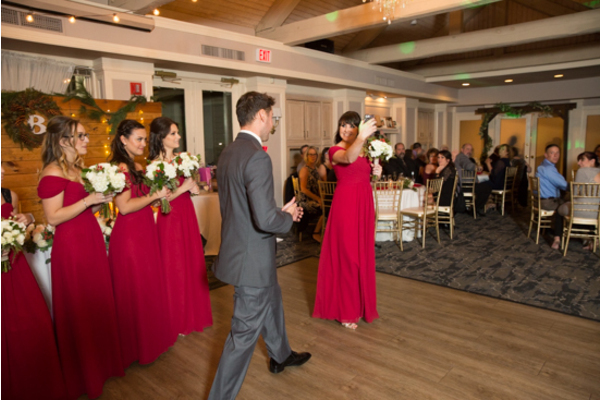 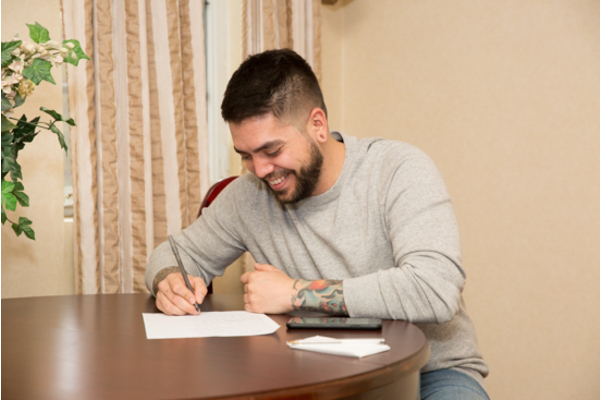 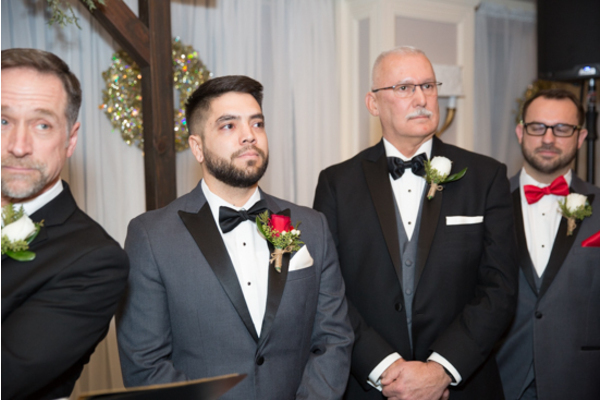 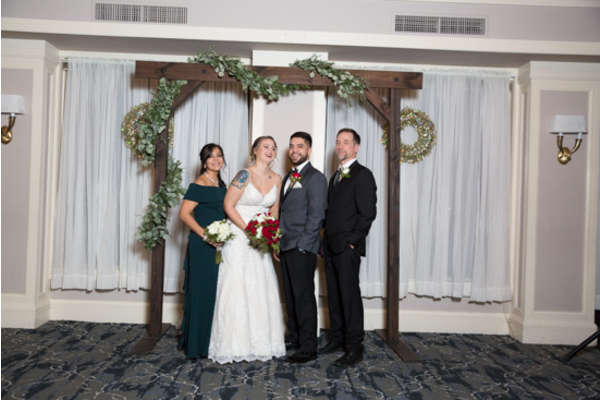 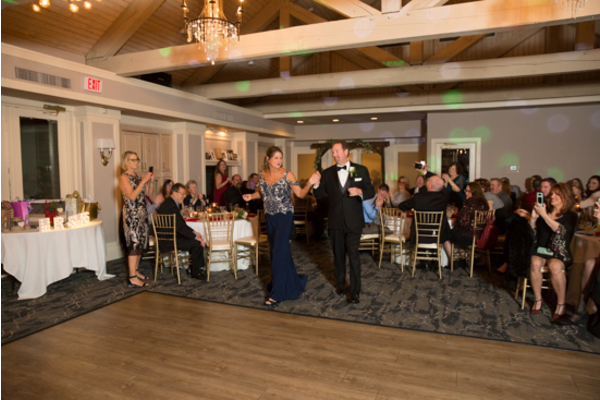 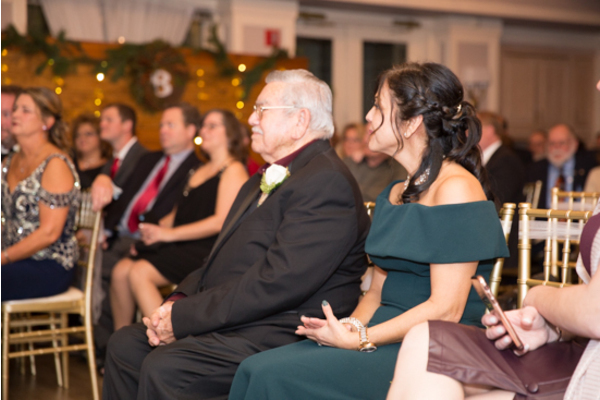 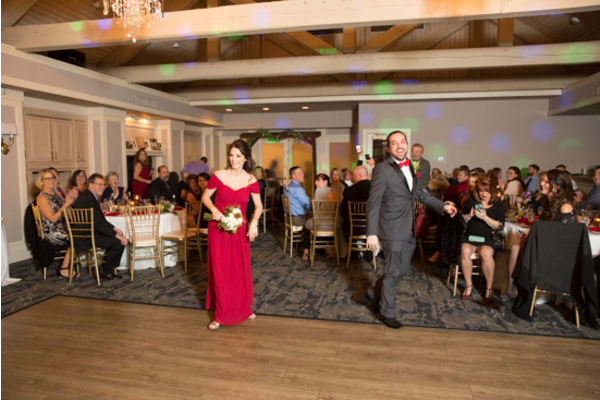 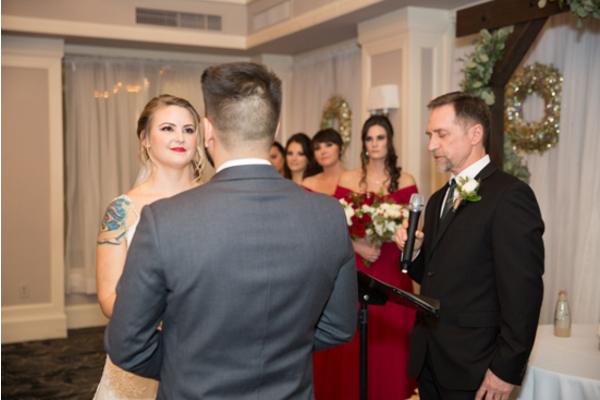 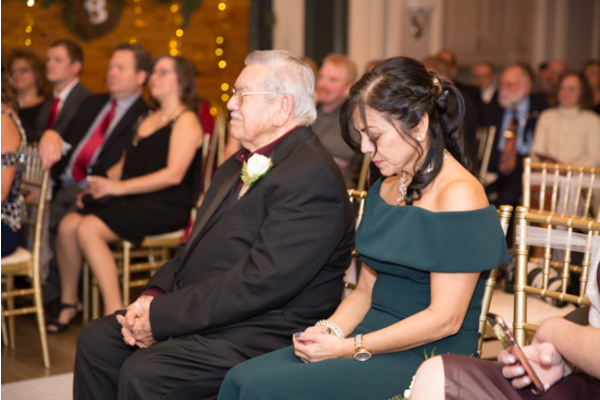 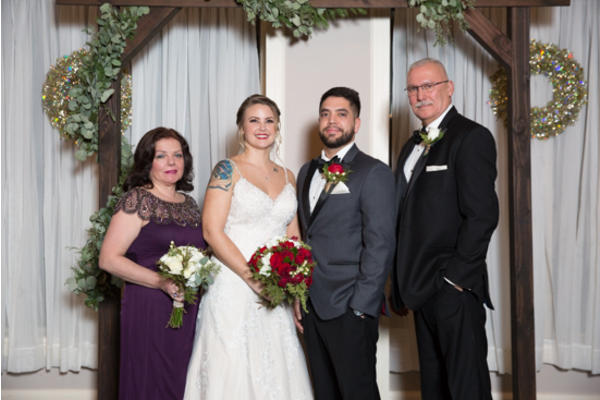 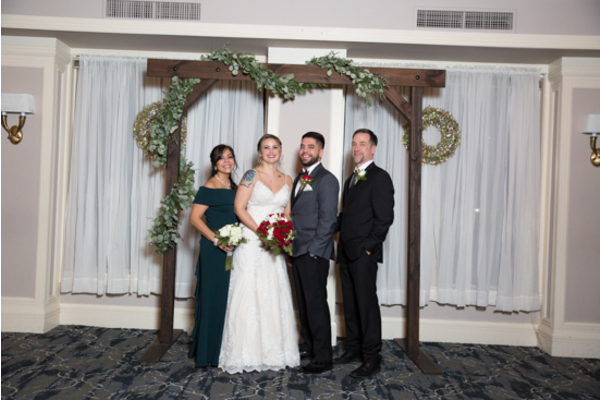 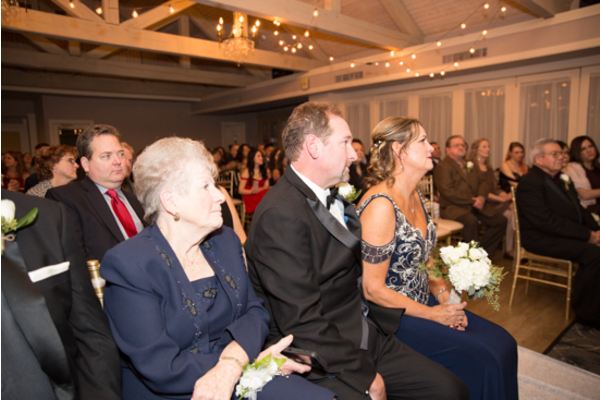 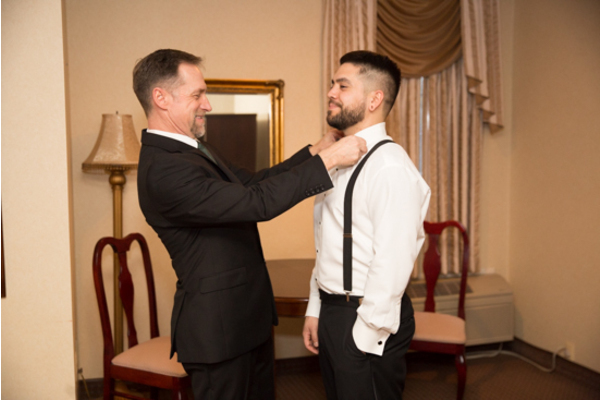 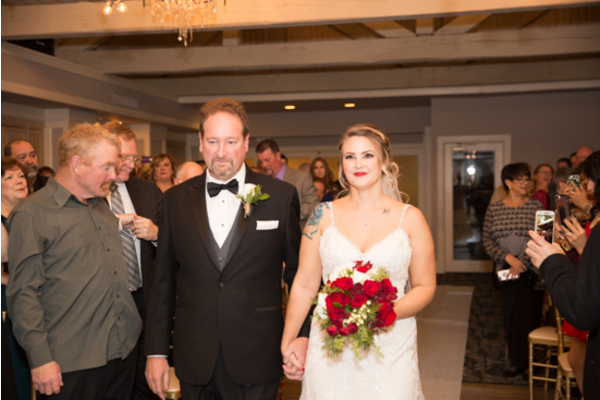 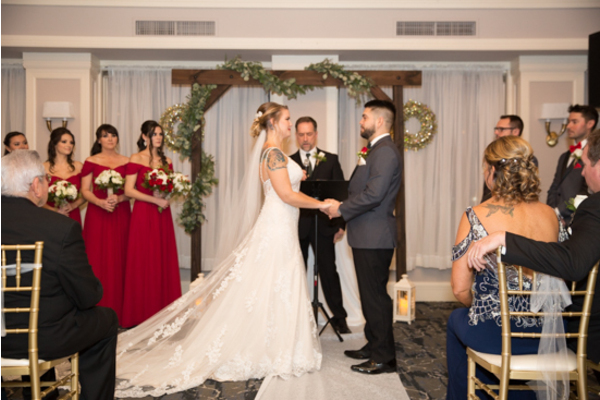 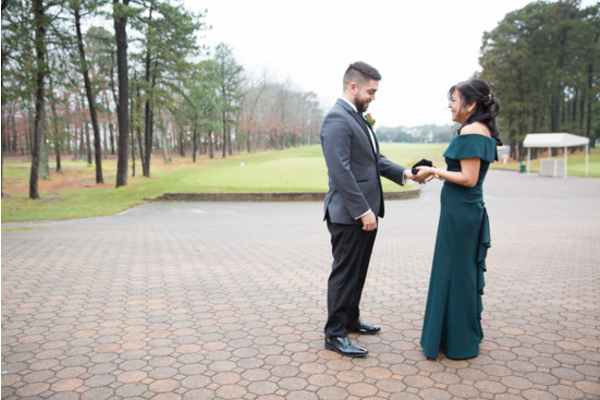 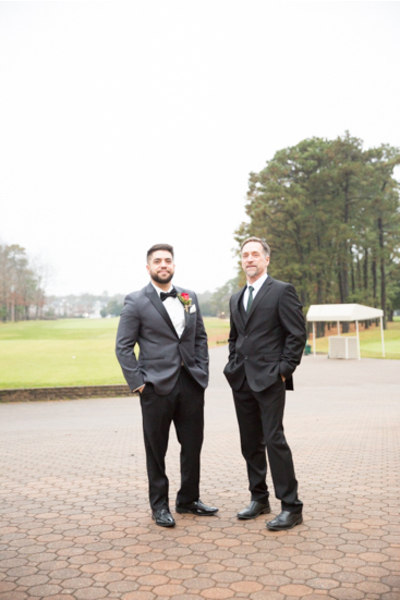 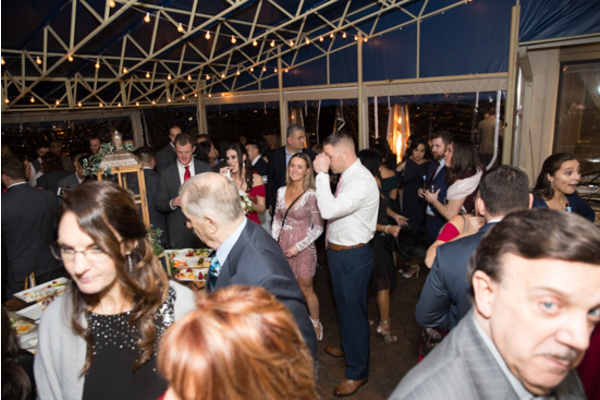 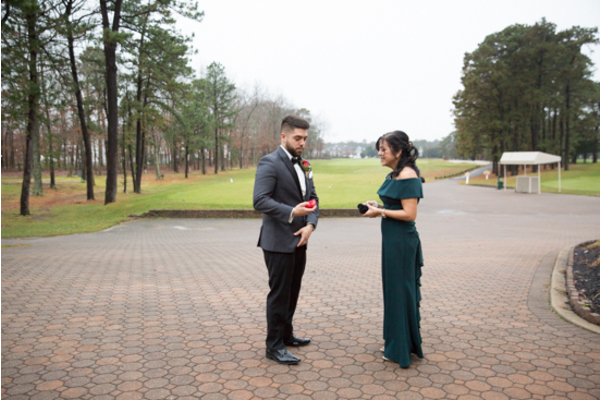 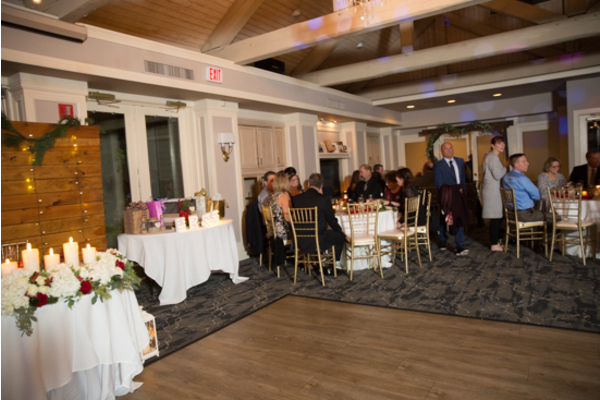 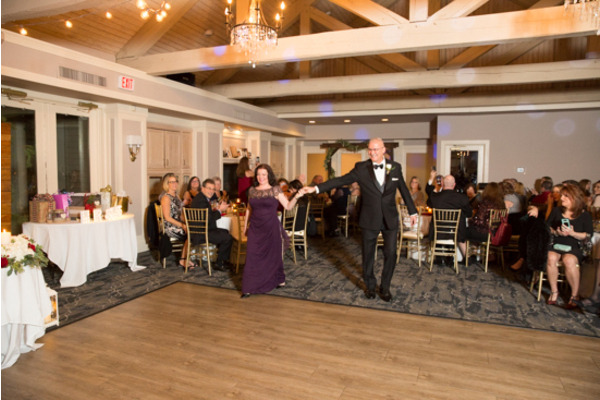 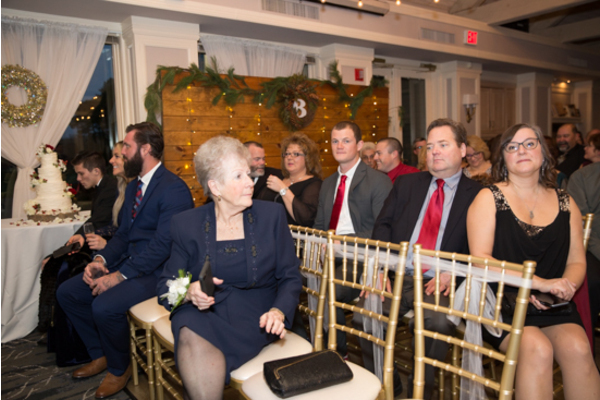 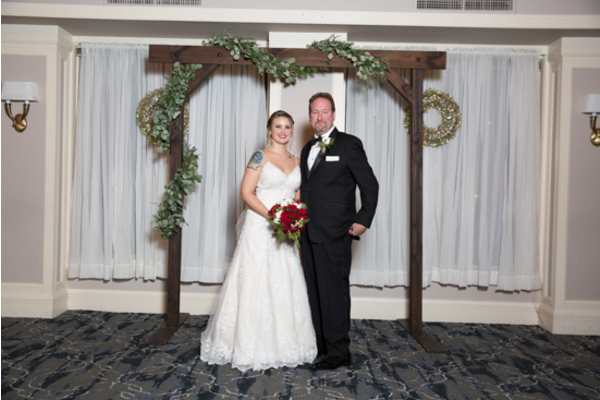 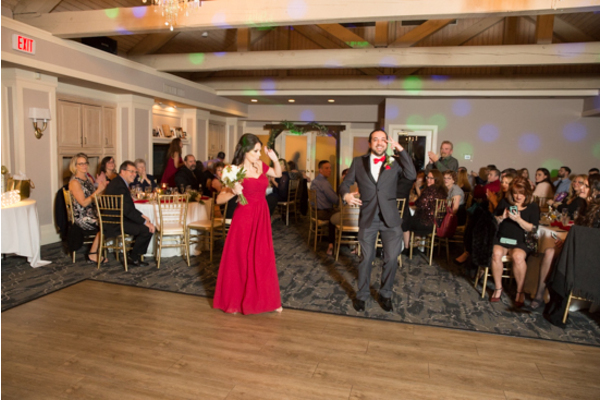 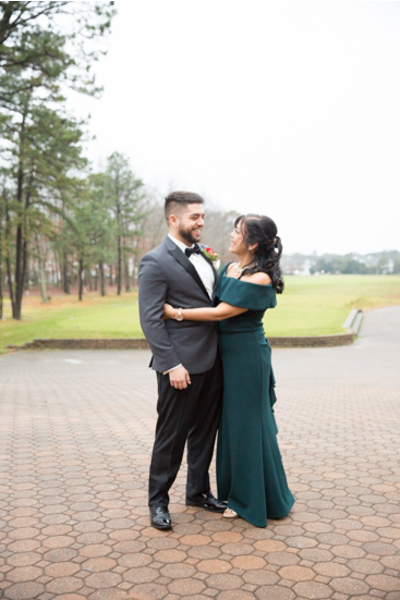 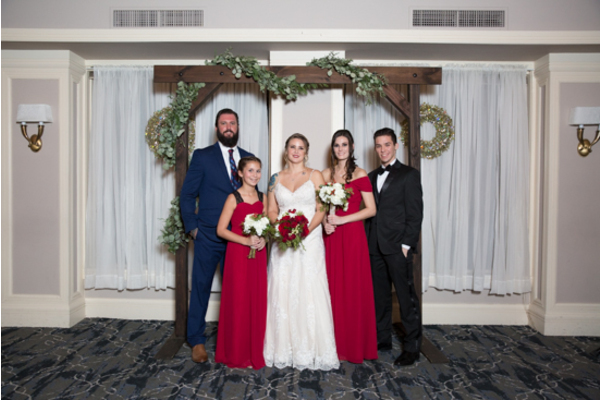 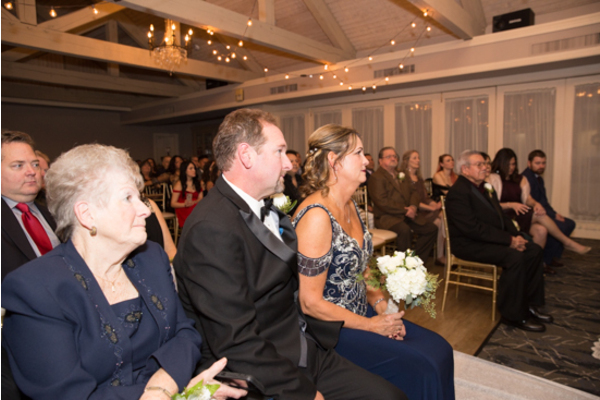 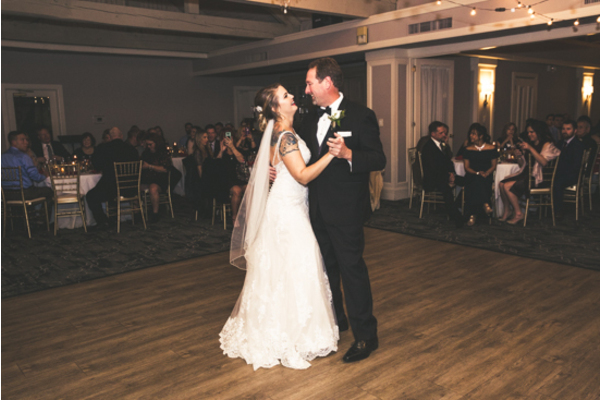 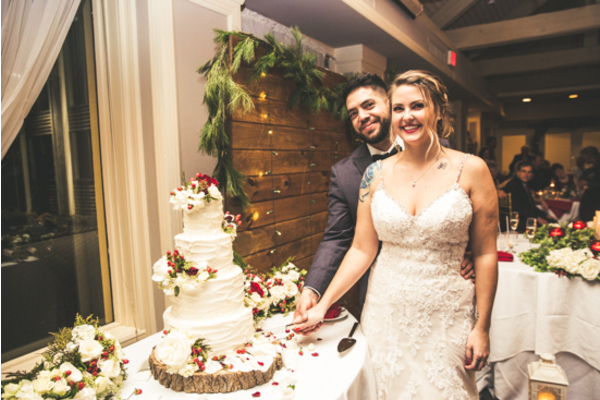 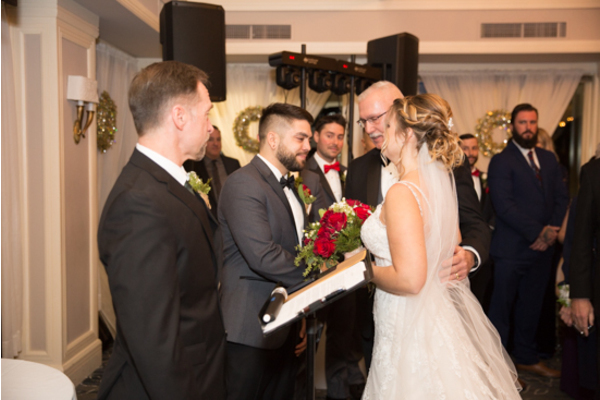 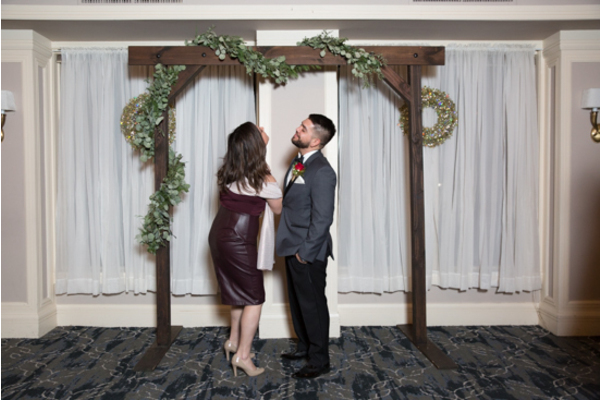 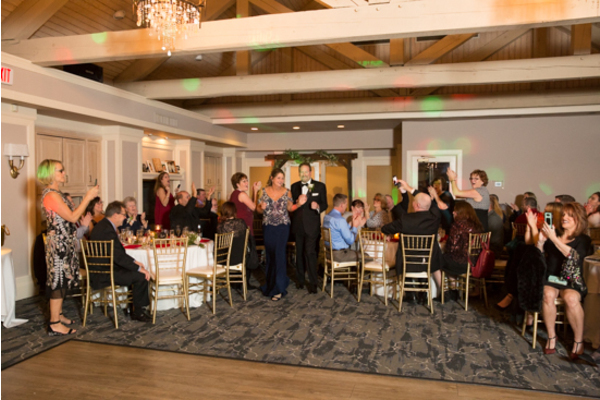 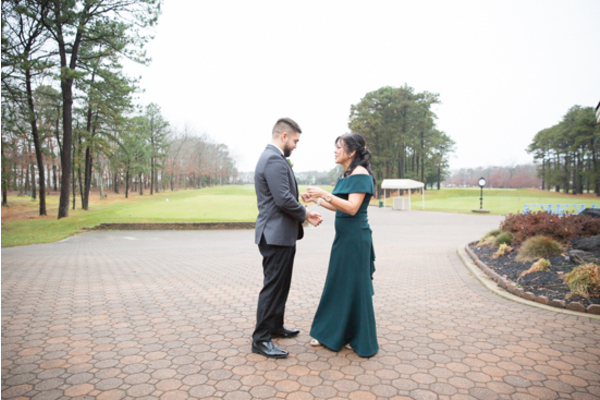 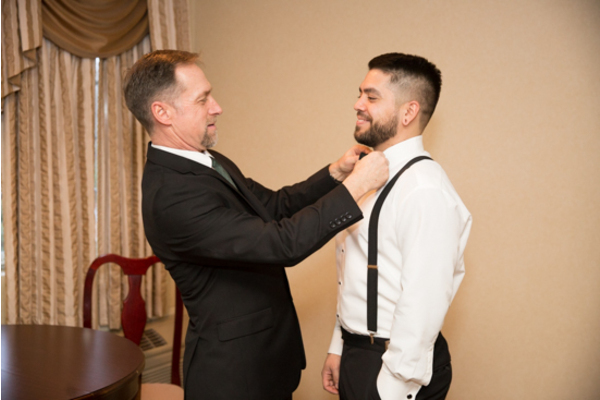 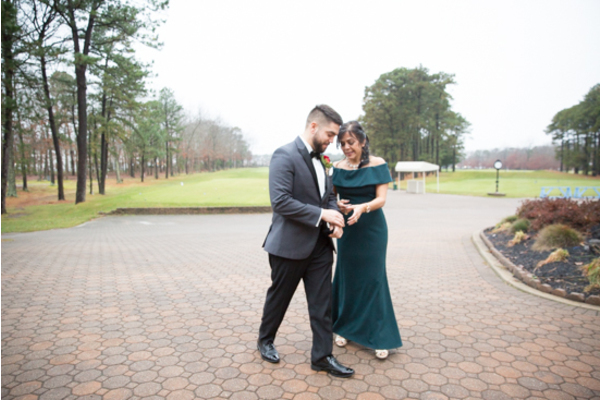 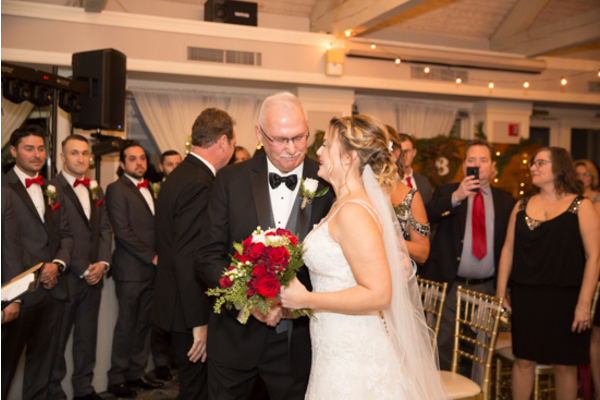 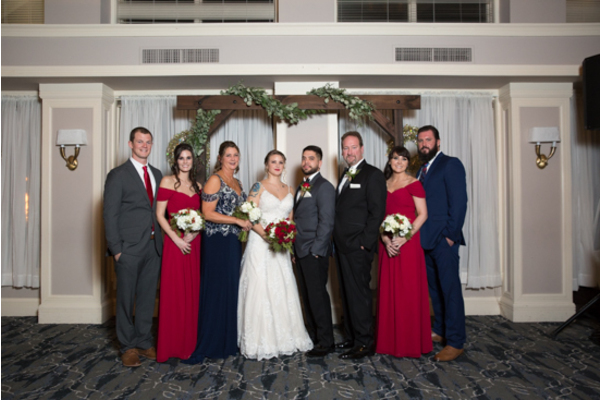 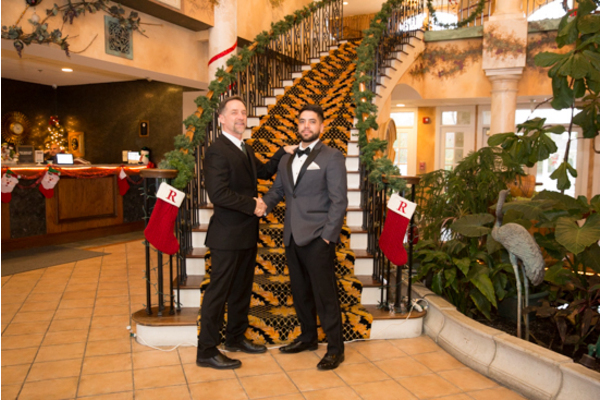 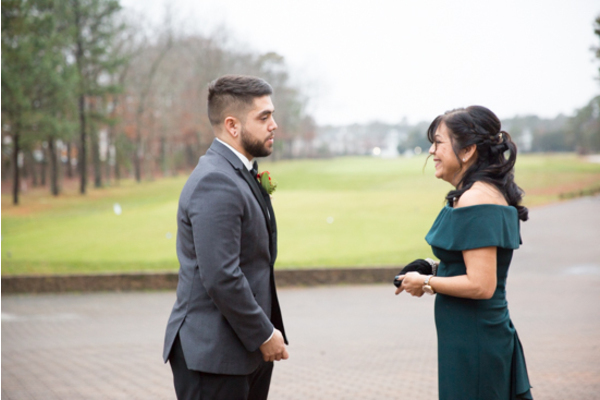 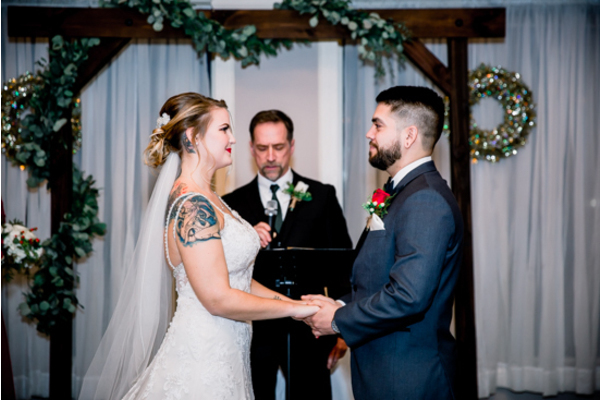 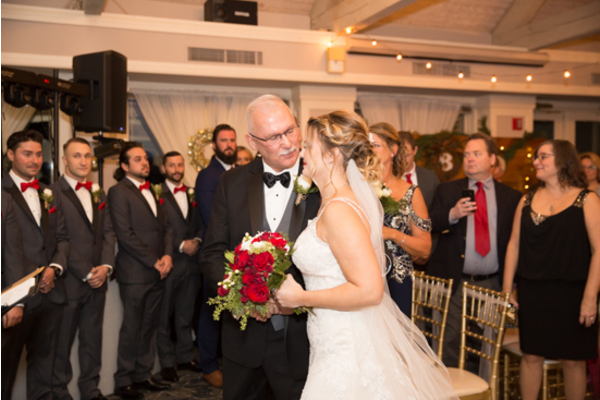 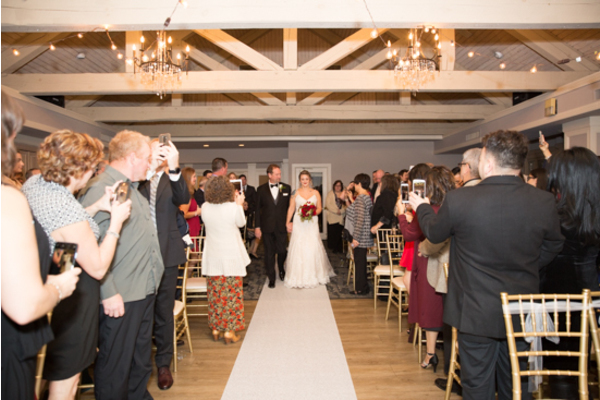 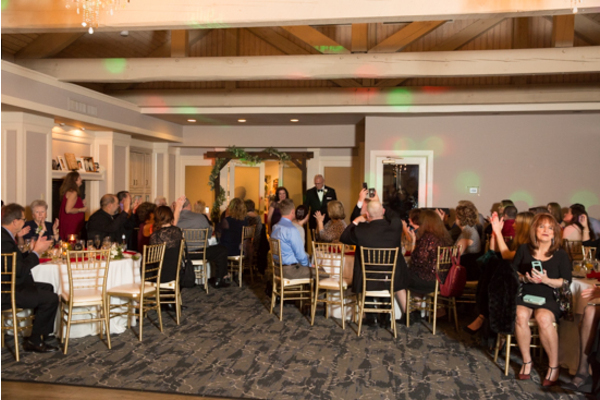 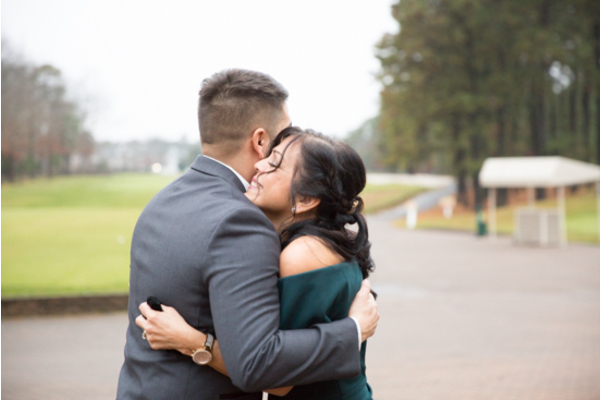 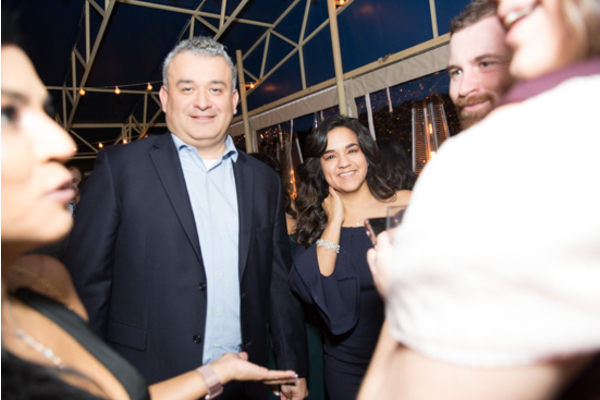 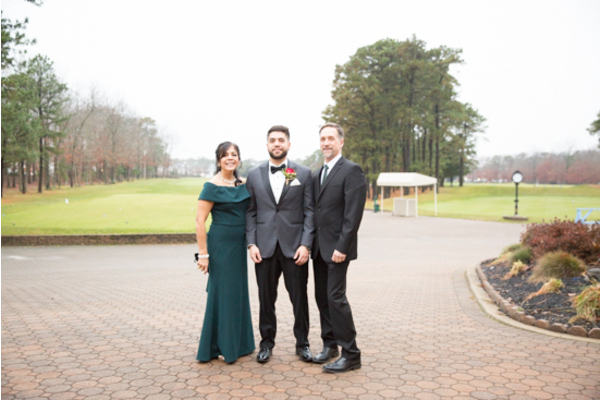 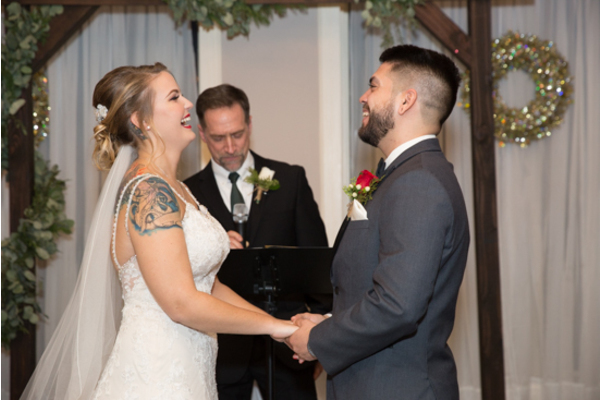 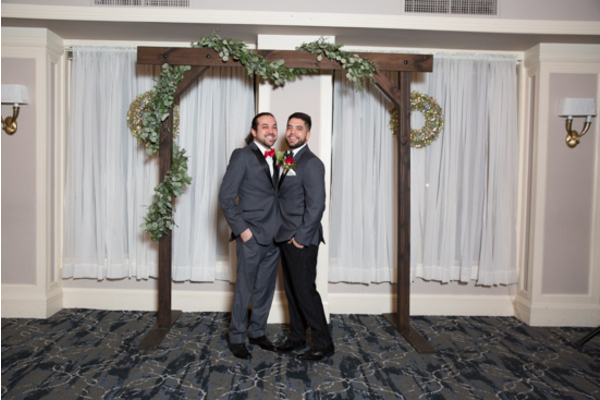 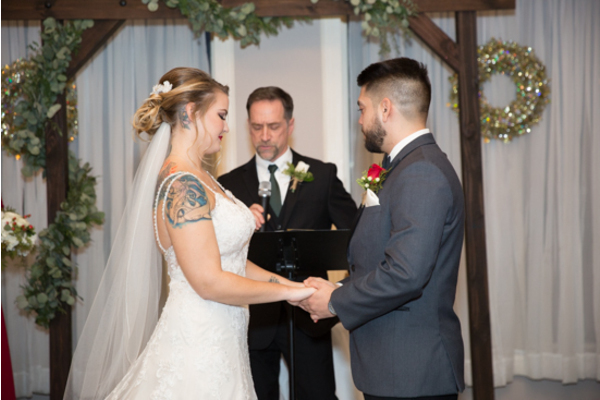 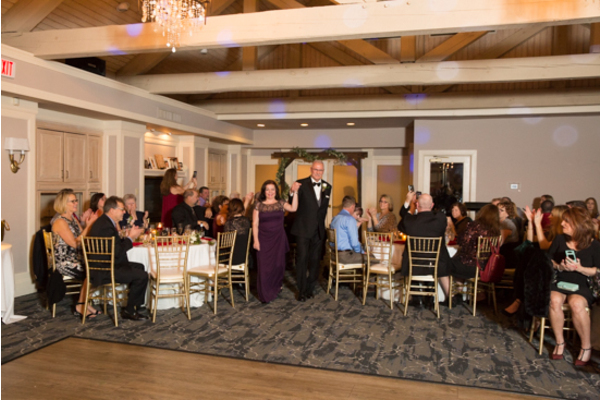 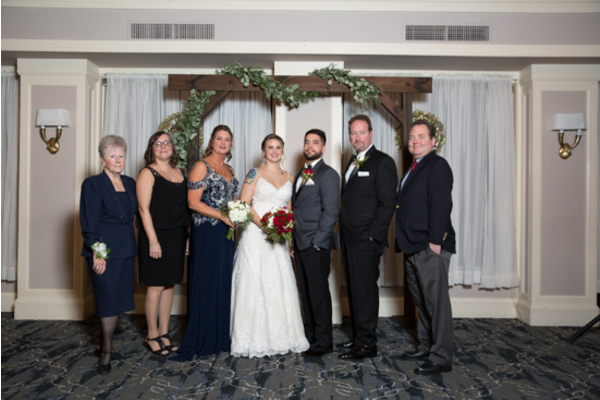 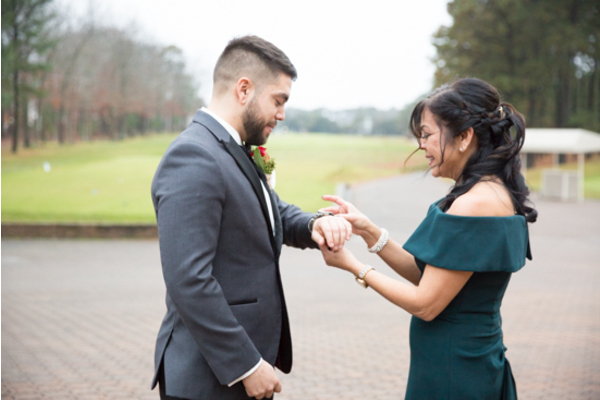 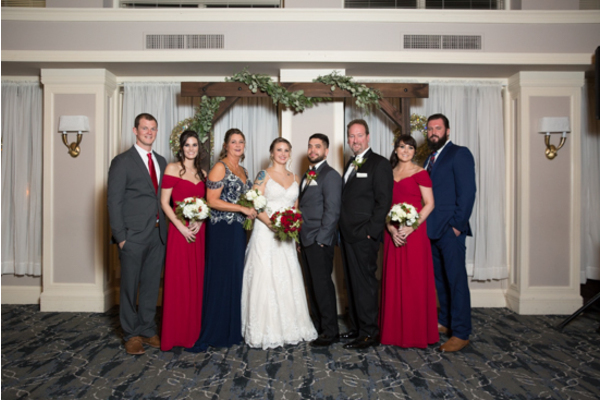 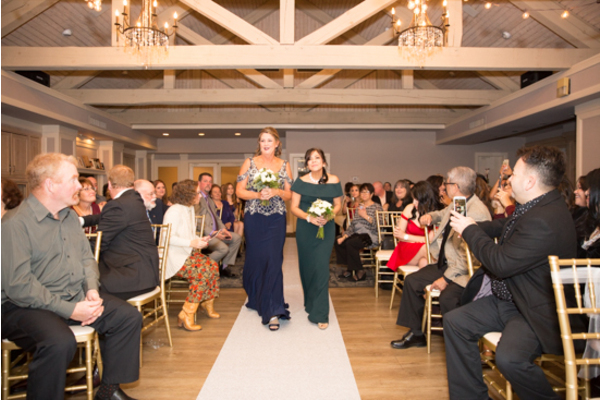 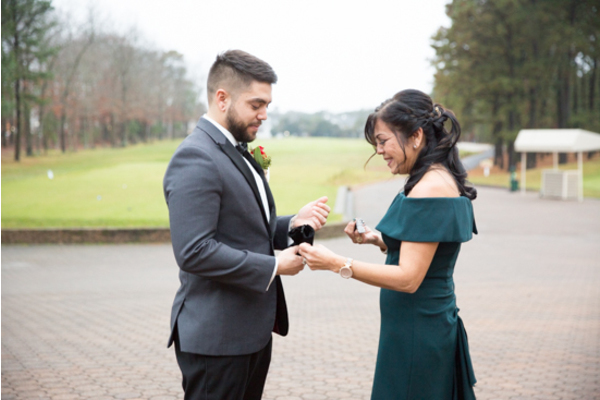 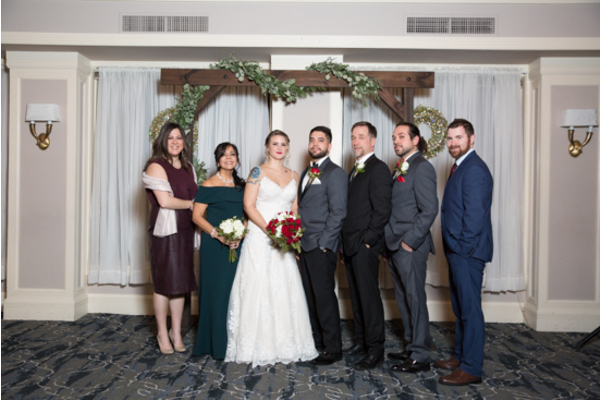 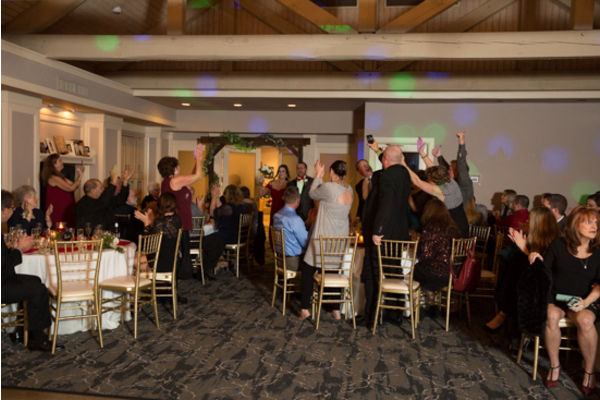 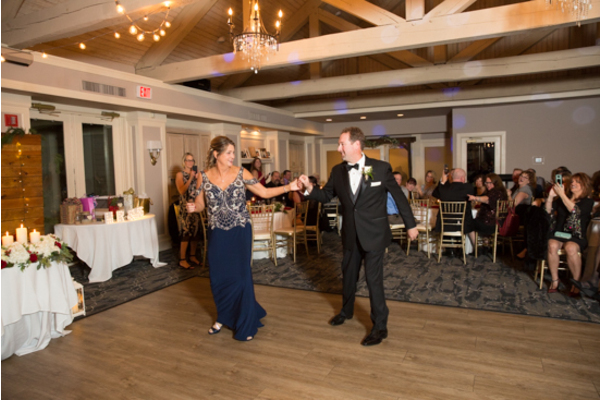 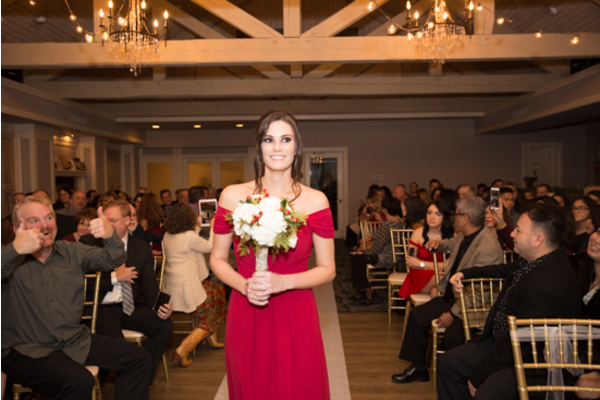 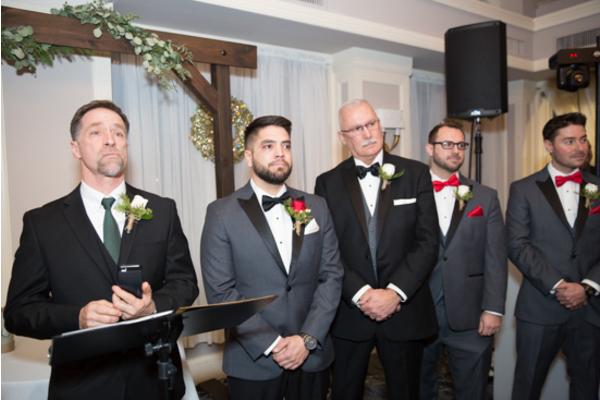 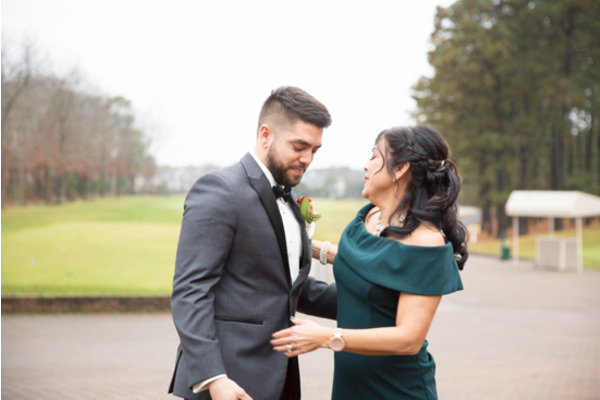 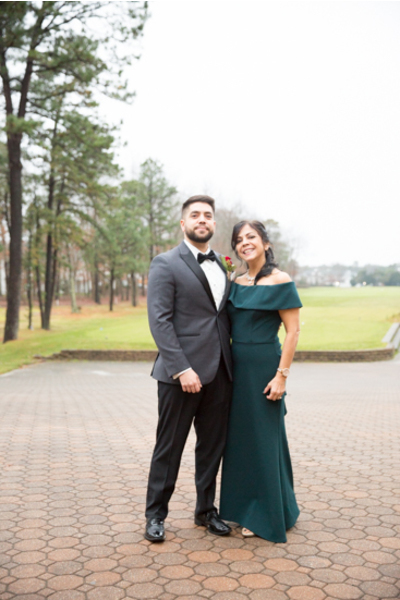 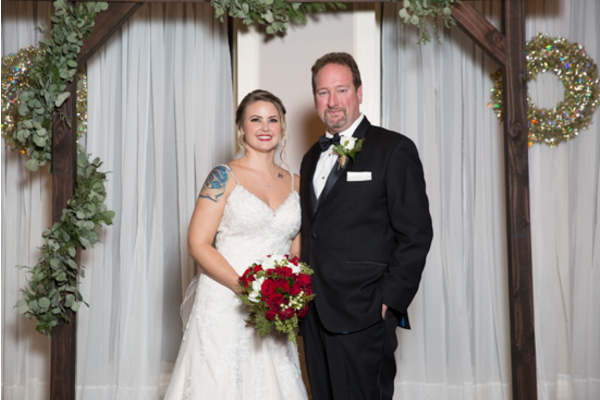 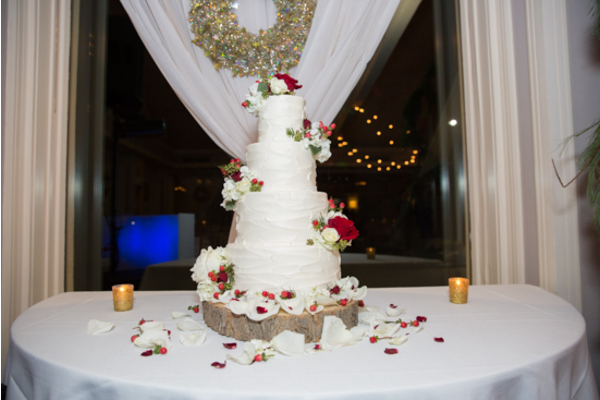 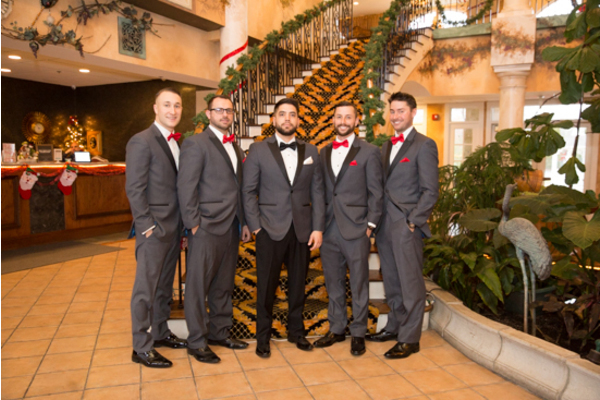 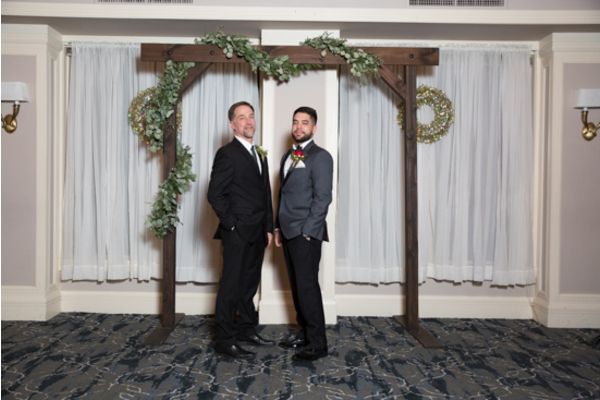 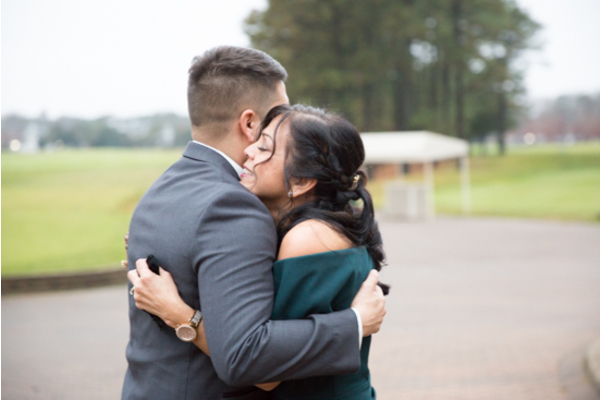 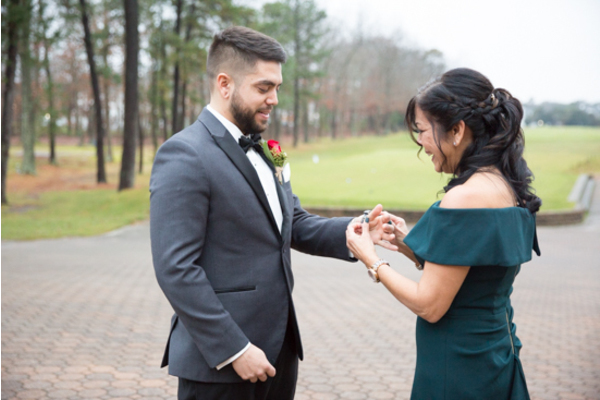 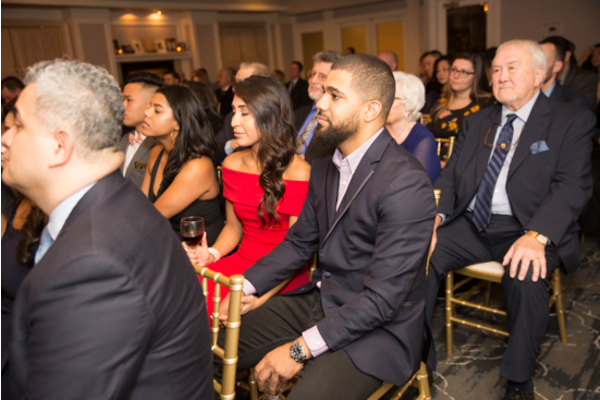 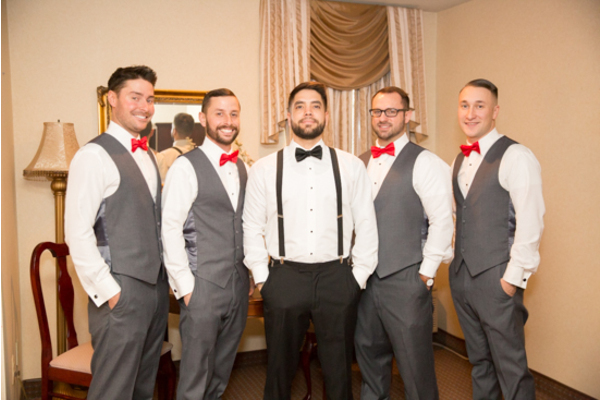 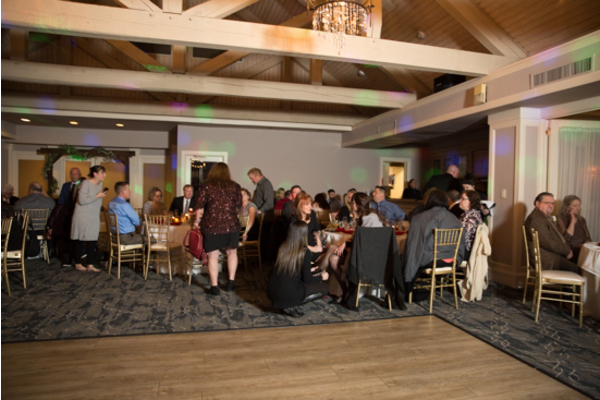 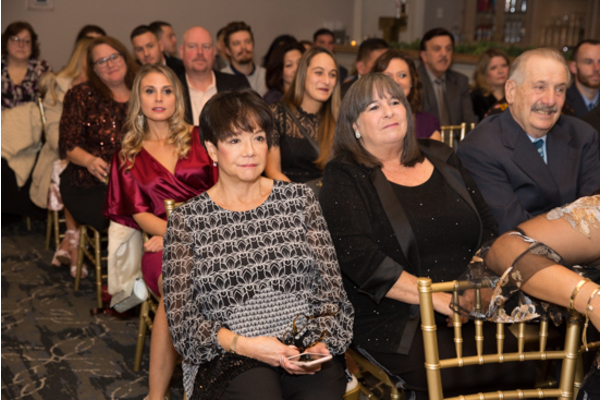 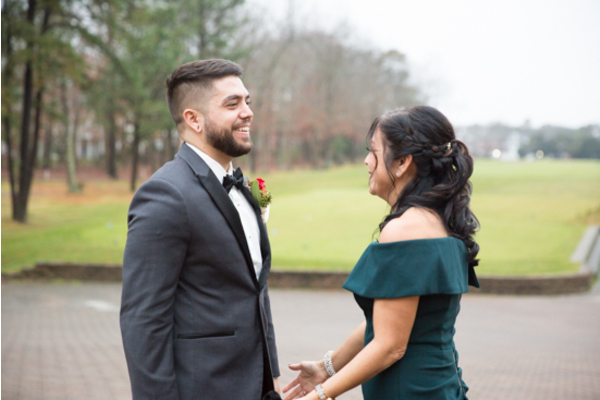 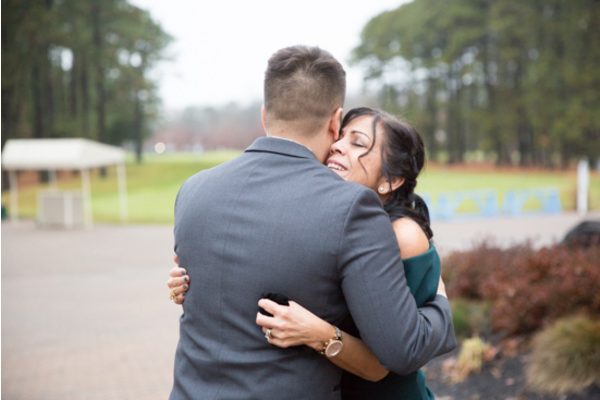 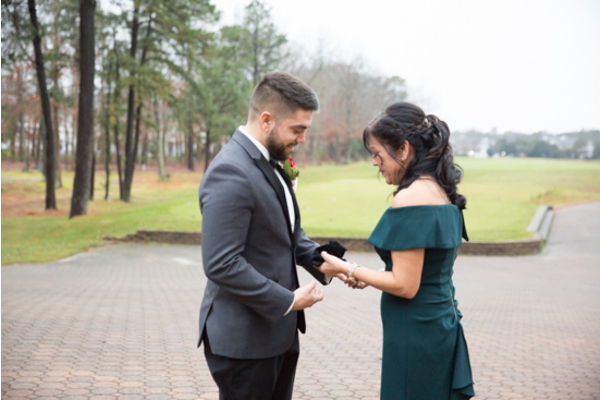 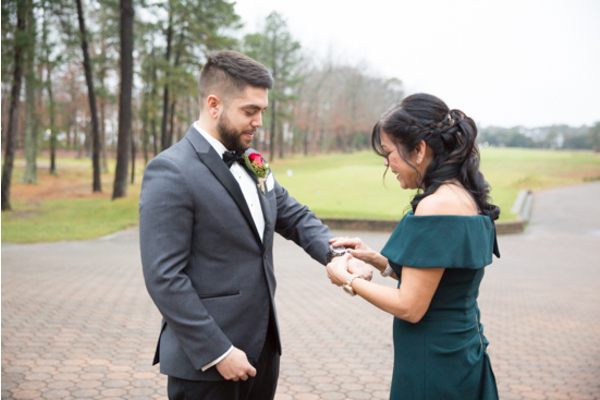 On December 15th, 2018, these newlyweds held their celebration at Blue Heron Pines Golf Club in Egg Harbor City, NJ. 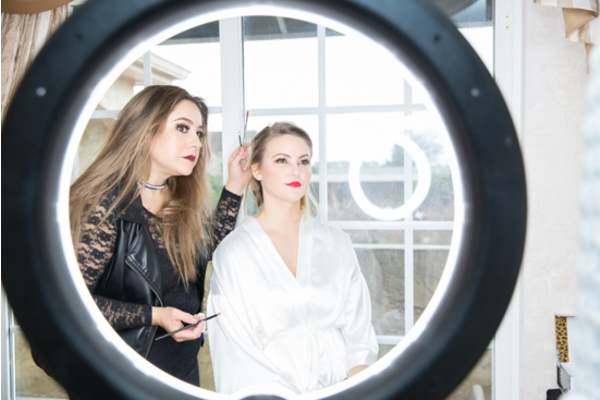 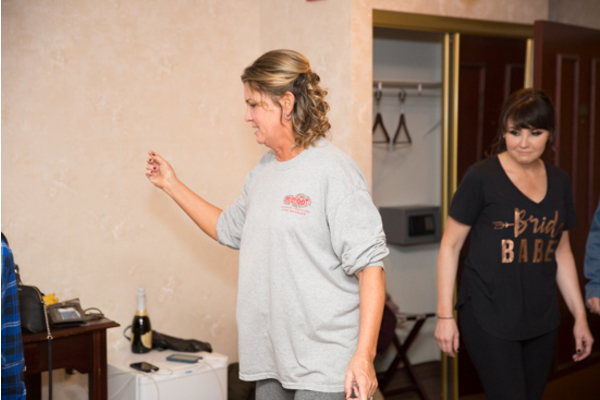 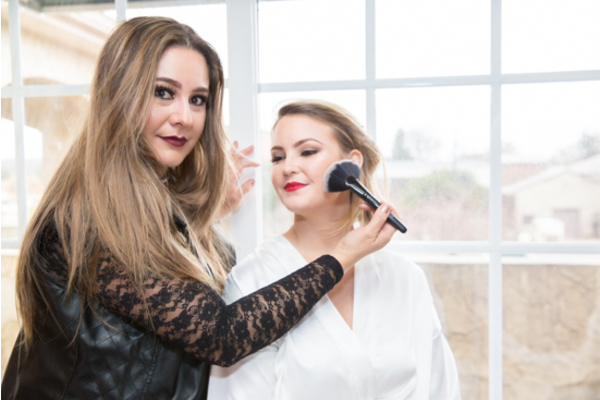 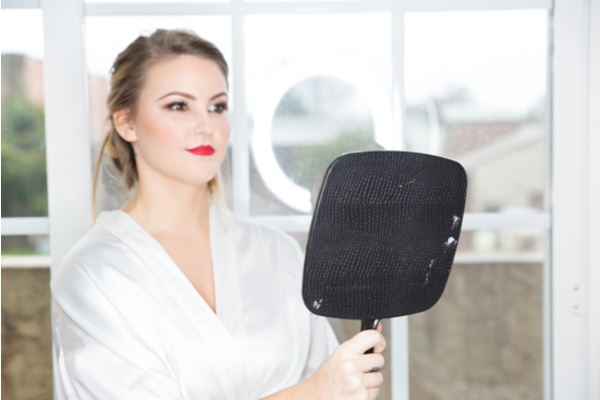 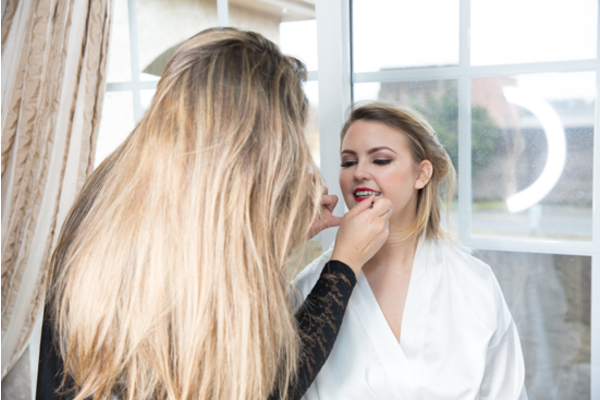 First, Samantha had a busy morning getting ready alongside her bridesmaids. 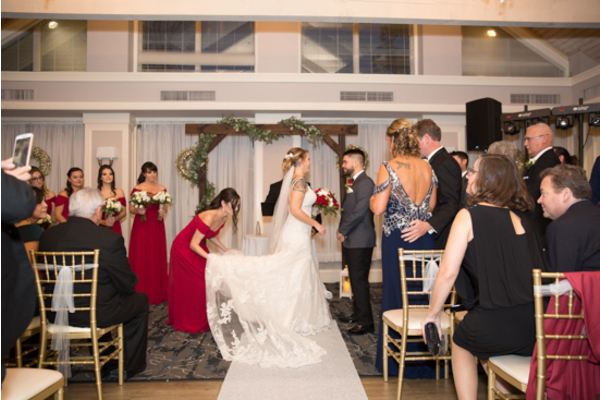 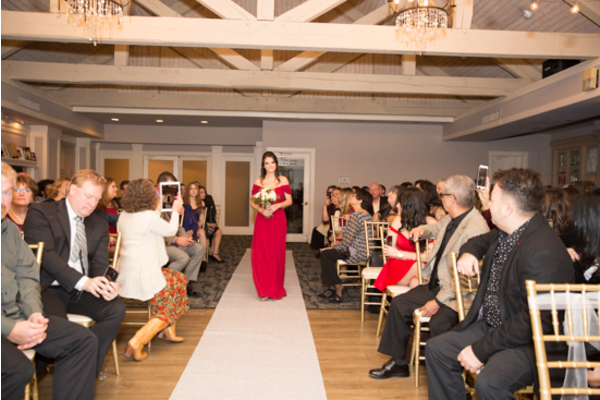 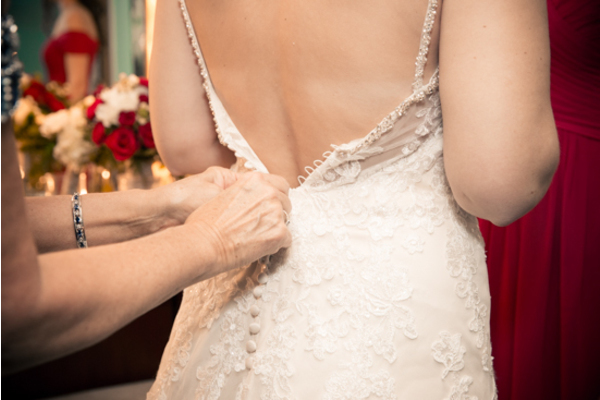 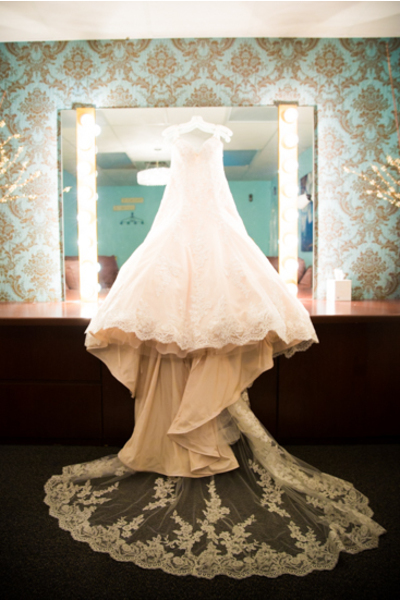 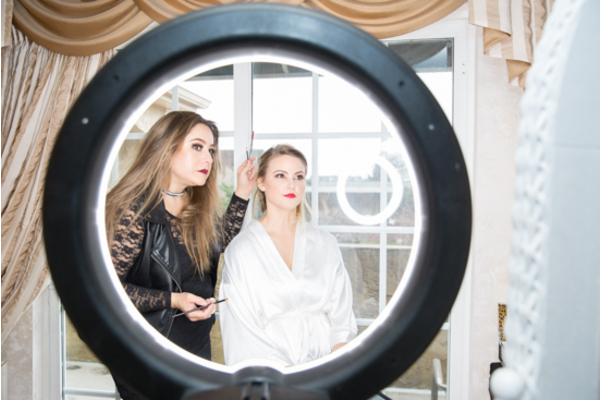 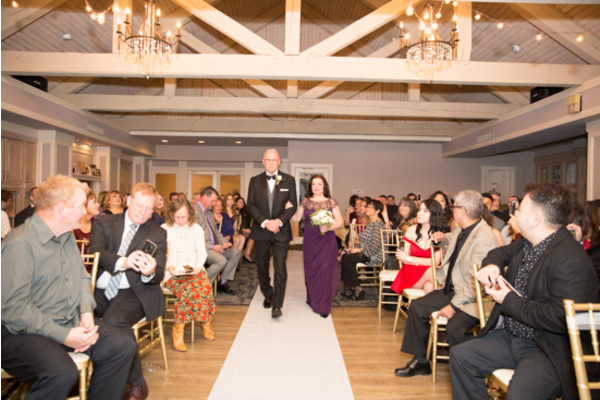 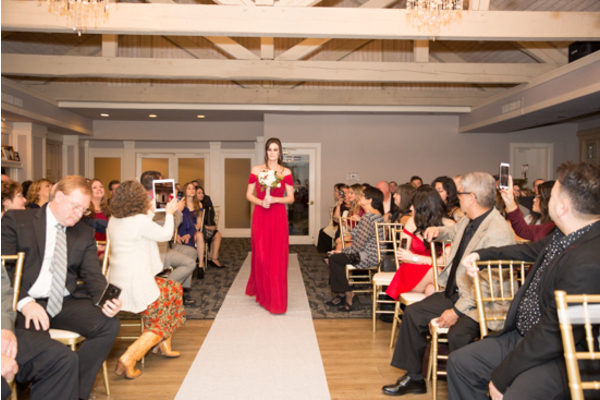 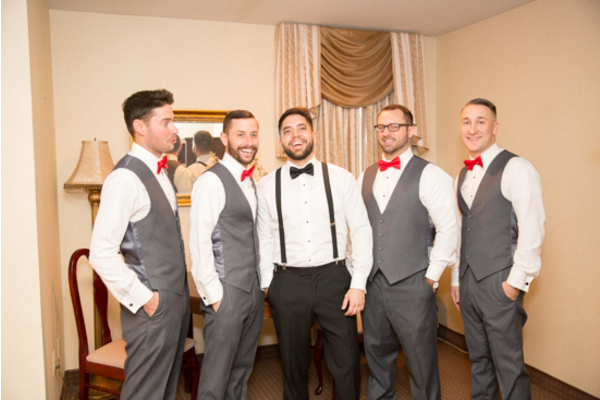 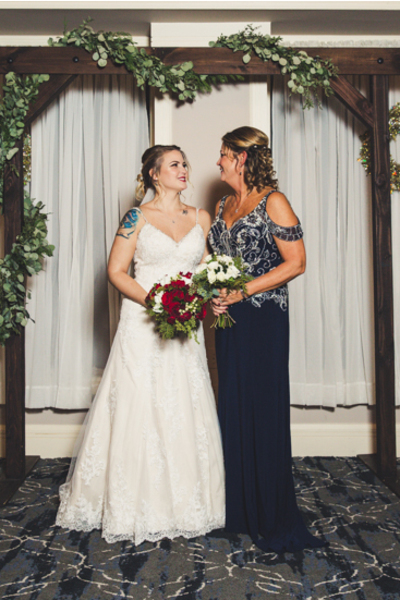 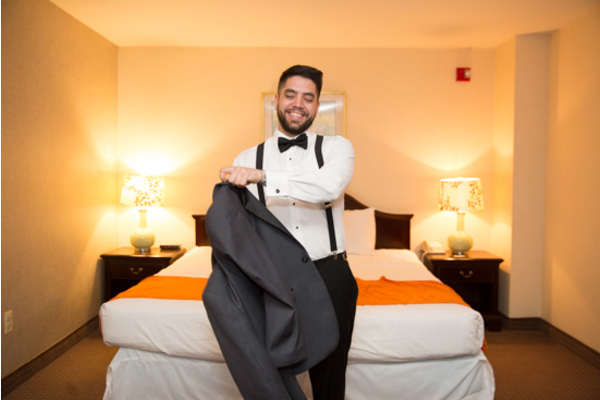 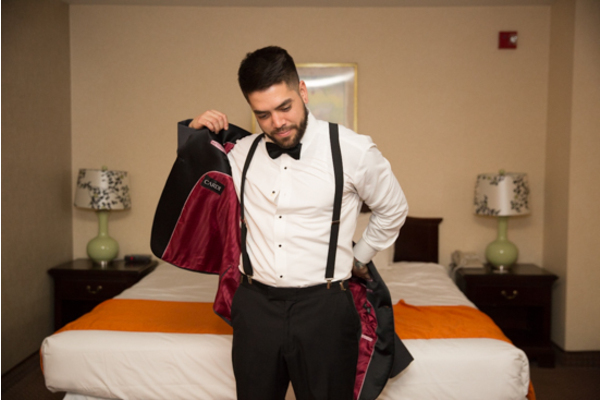 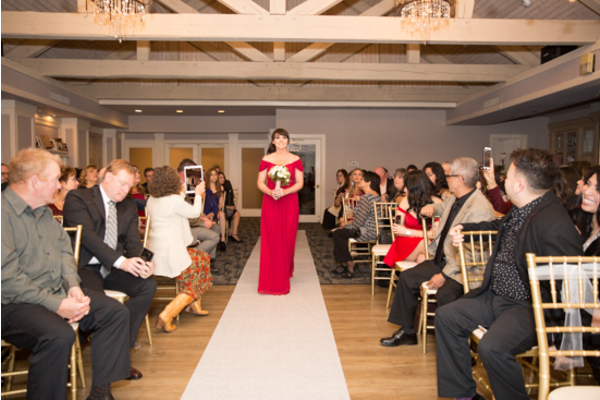 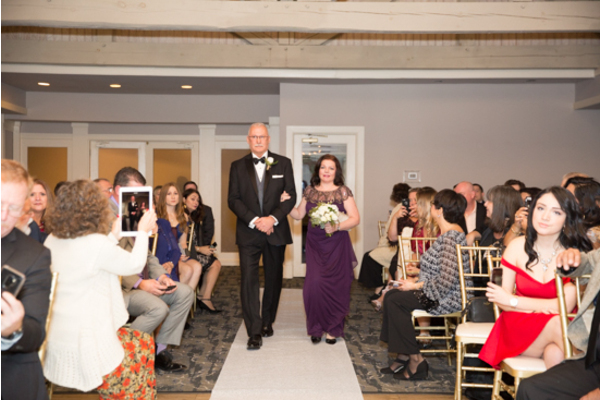 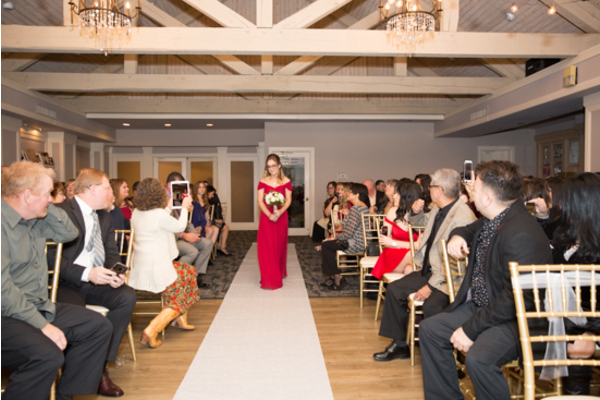 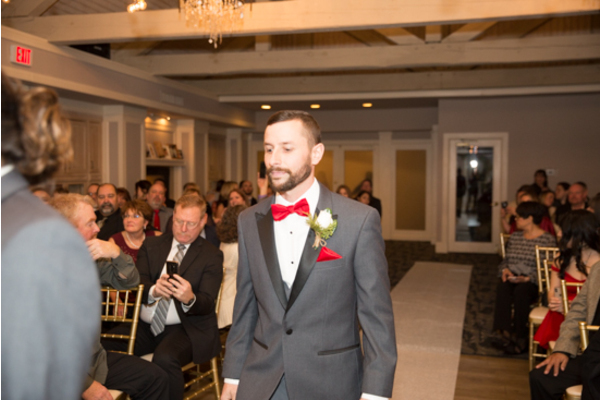 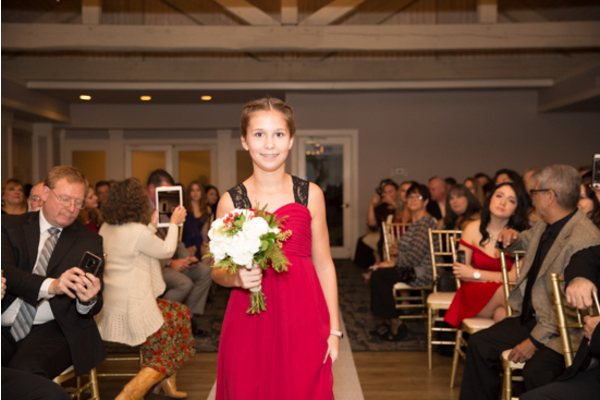 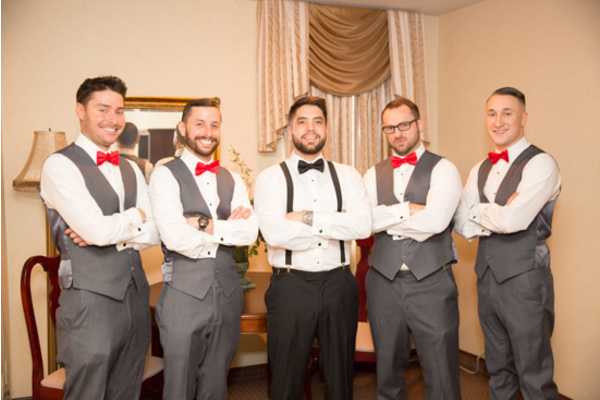 Our NJ Wedding Photographer was there as Samantha slipped on her gown and veil. 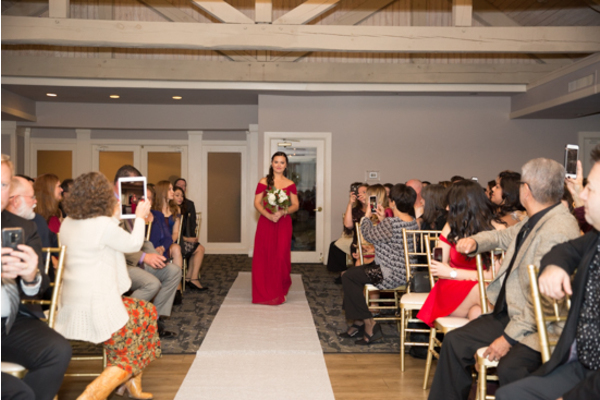 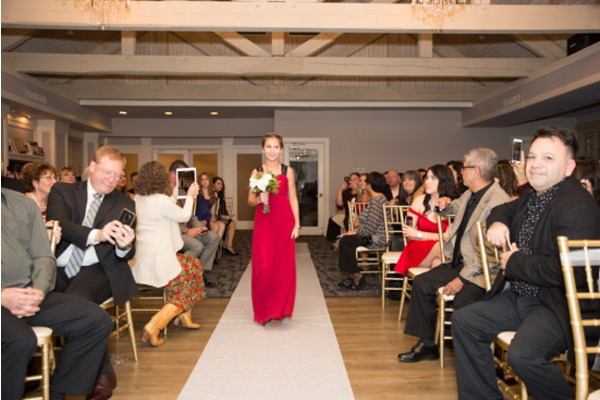 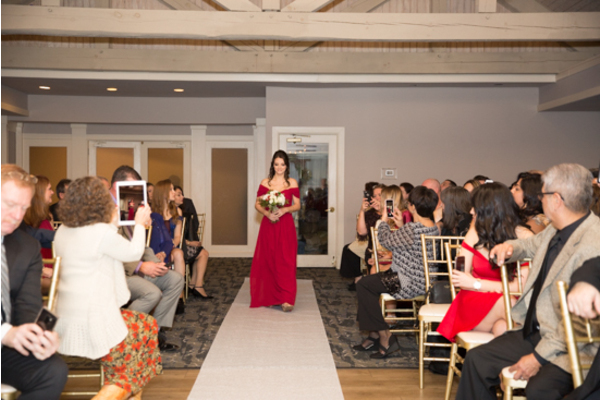 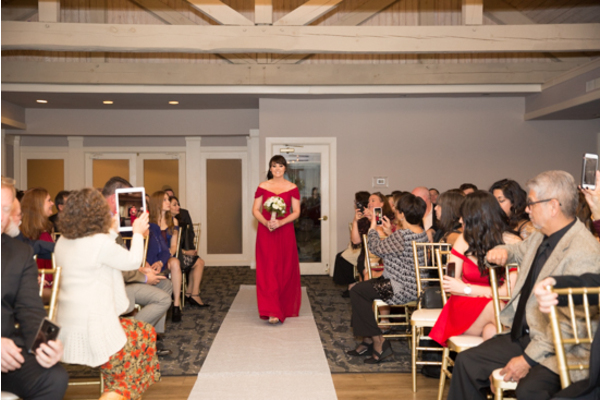 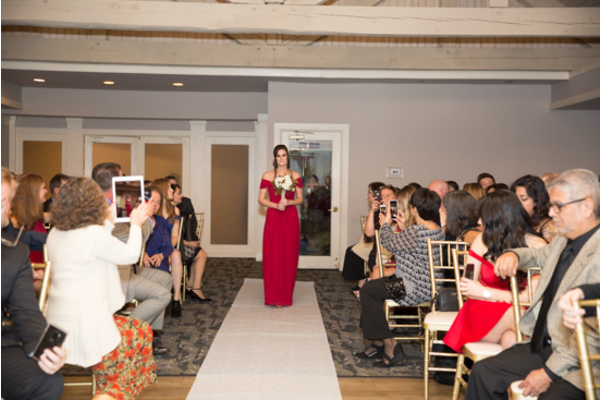 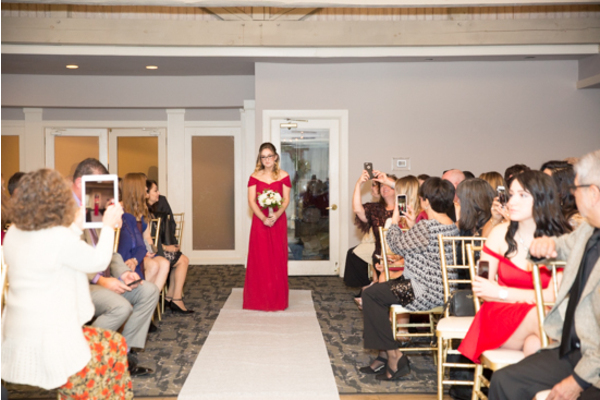 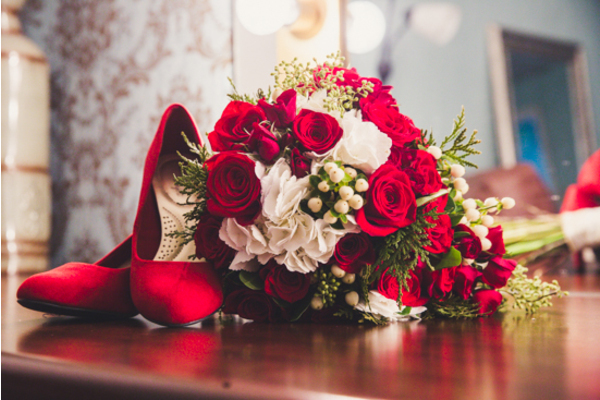 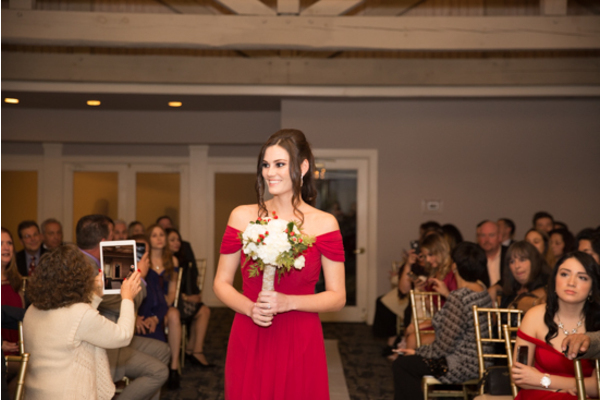 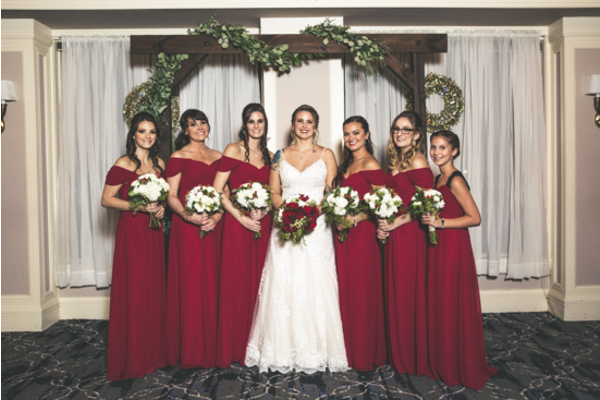 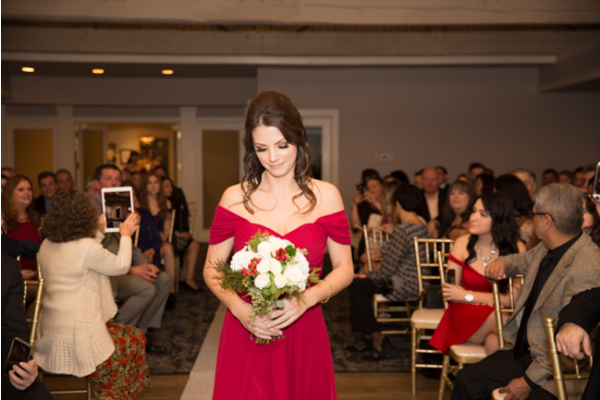 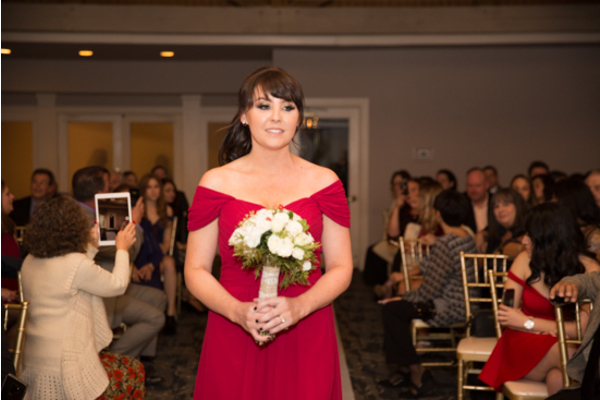 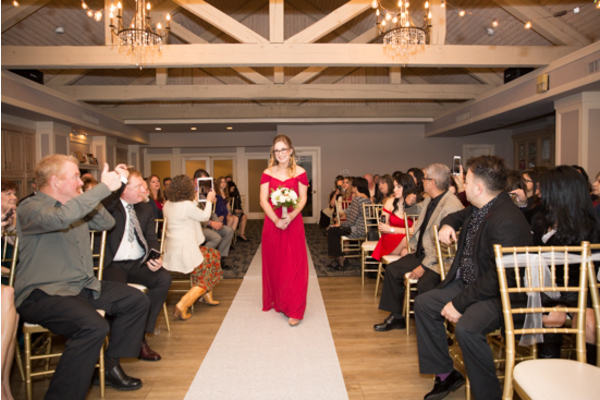 In addition, each bridesmaid wore a red dress to match Samantha’s shoes. 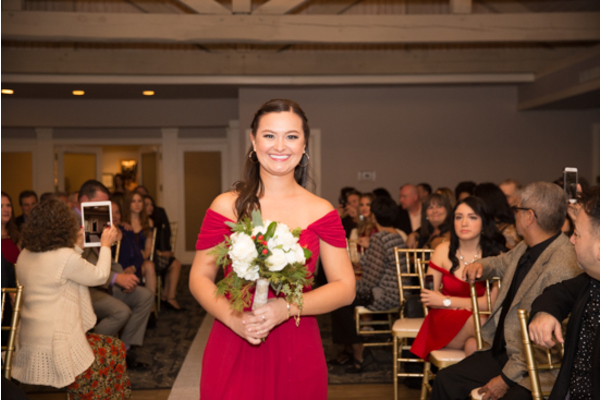 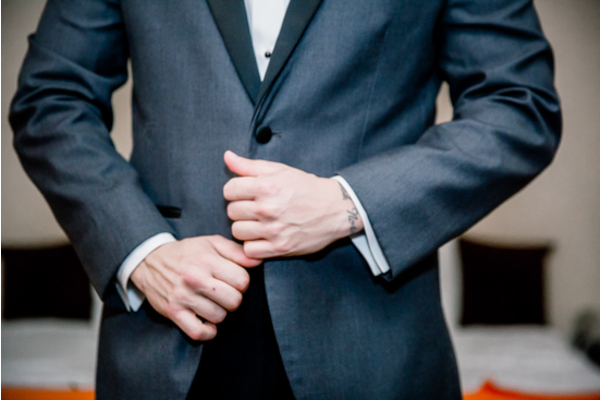 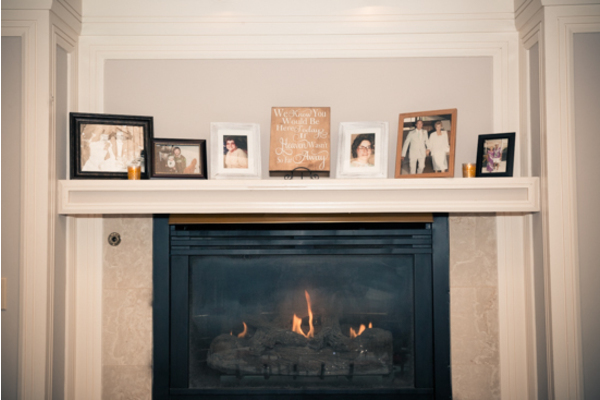 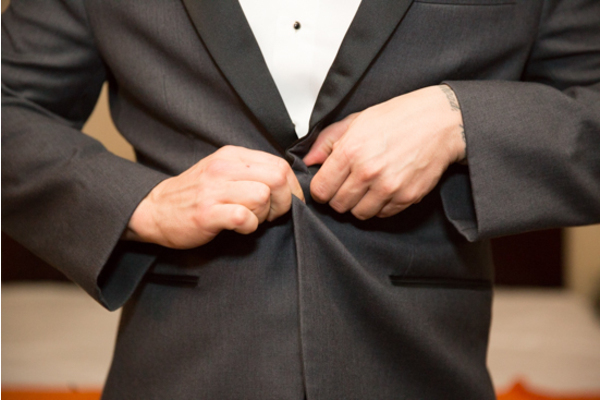 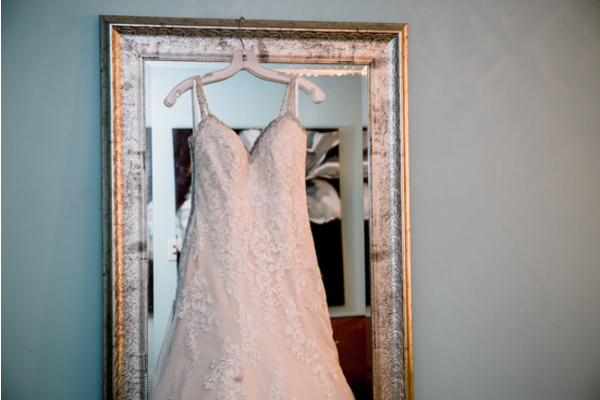 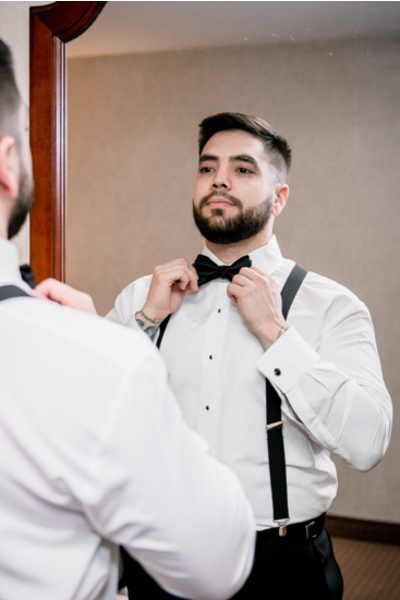 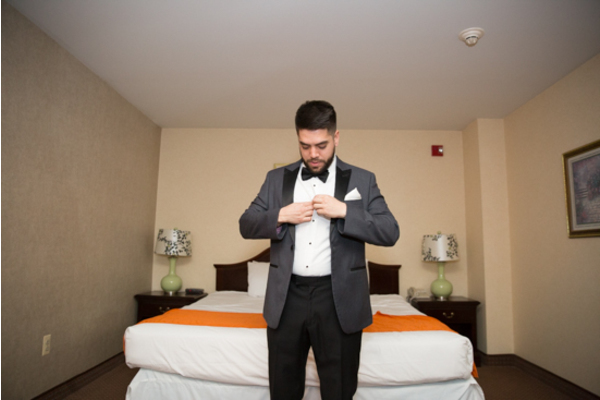 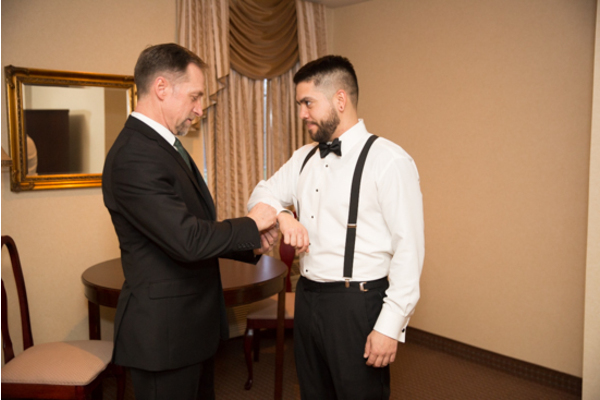 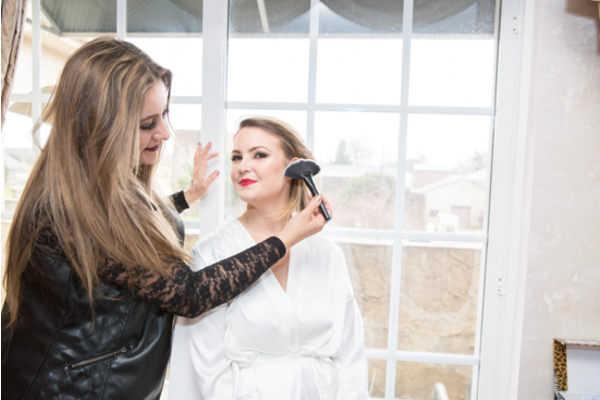 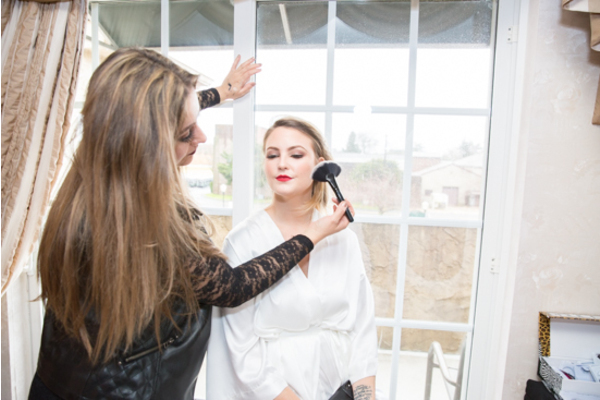 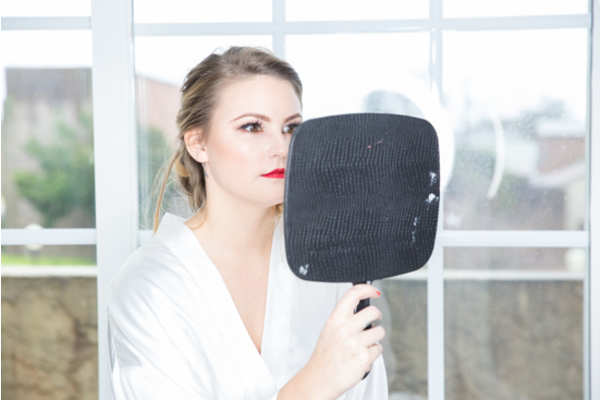 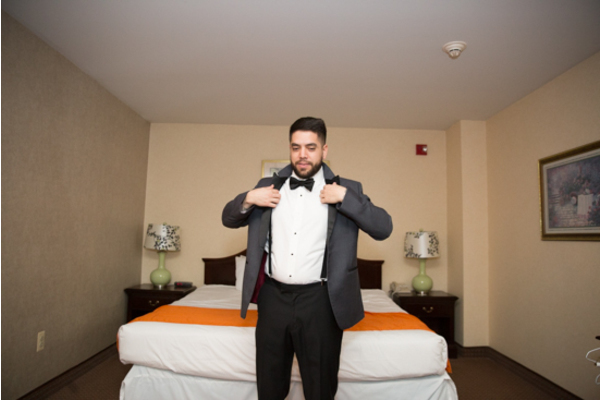 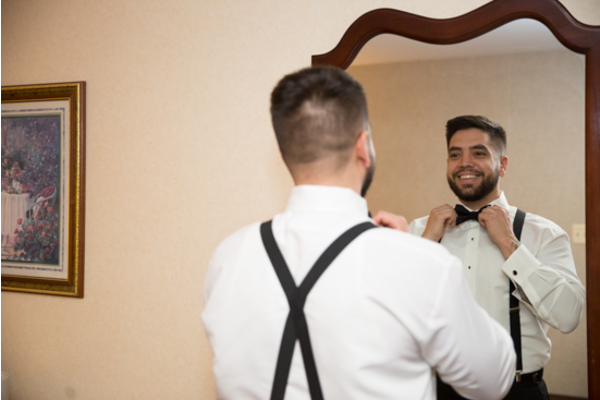 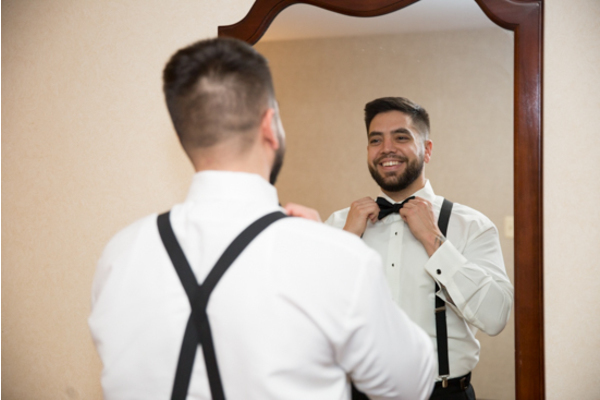 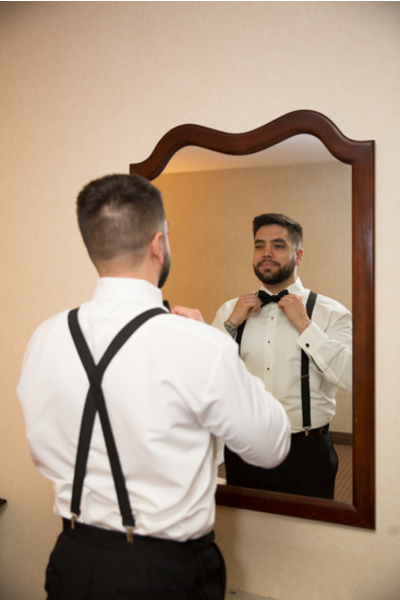 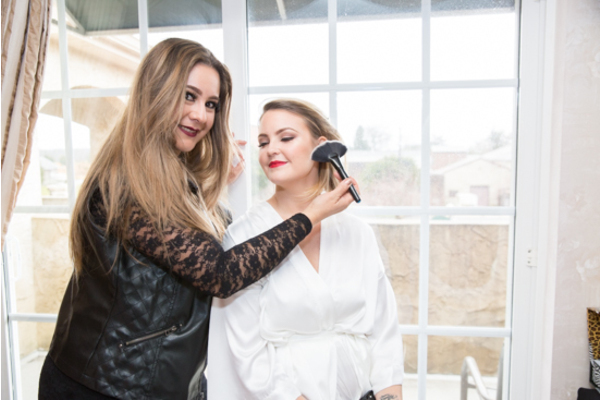 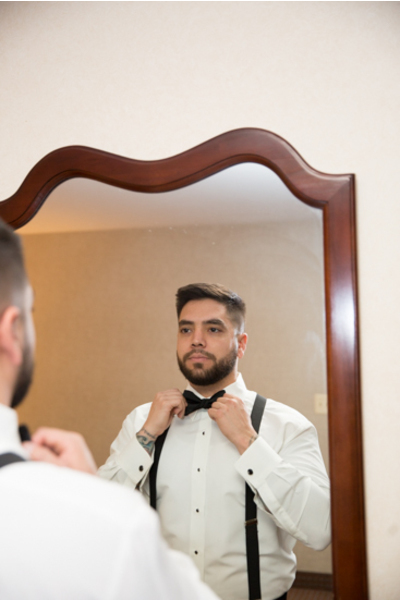 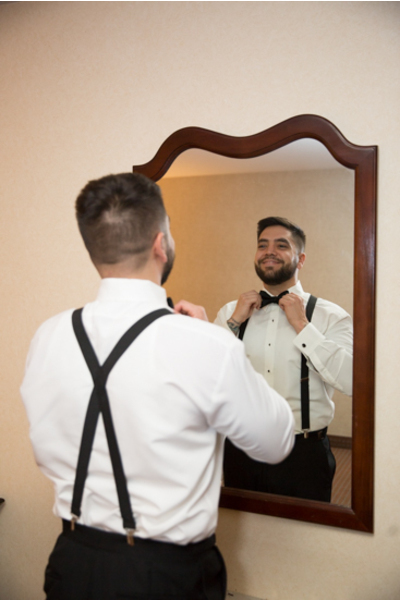 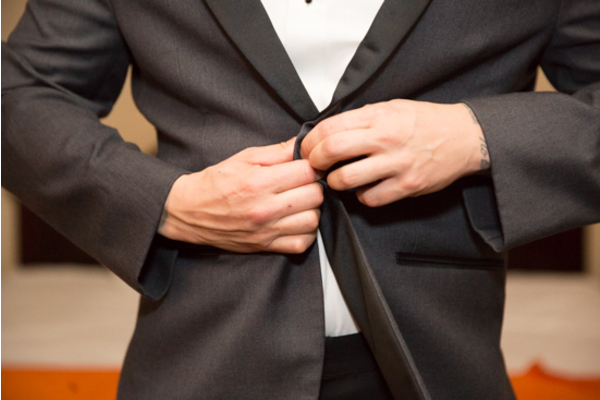 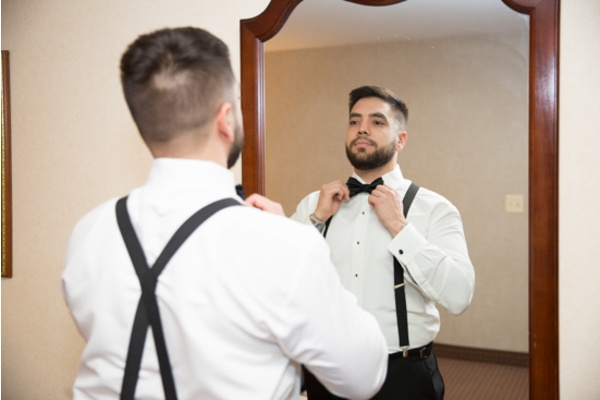 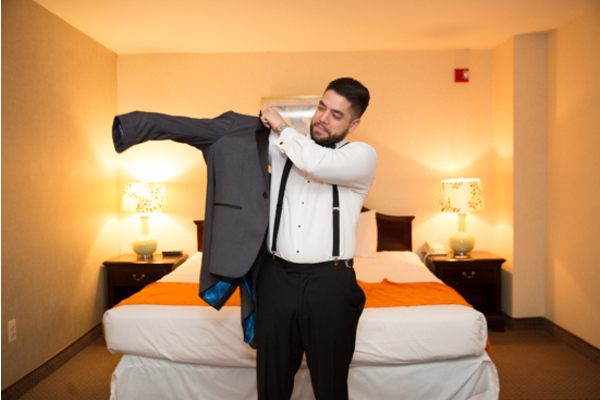 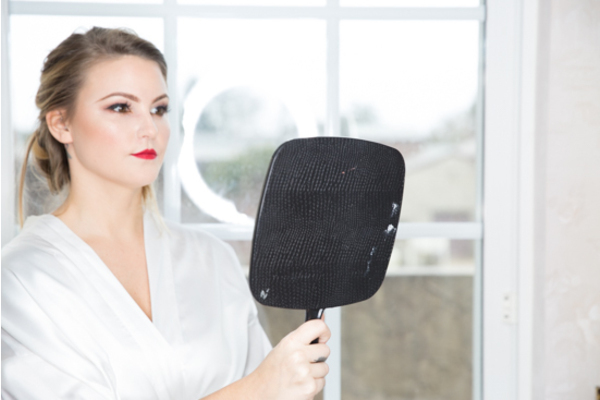 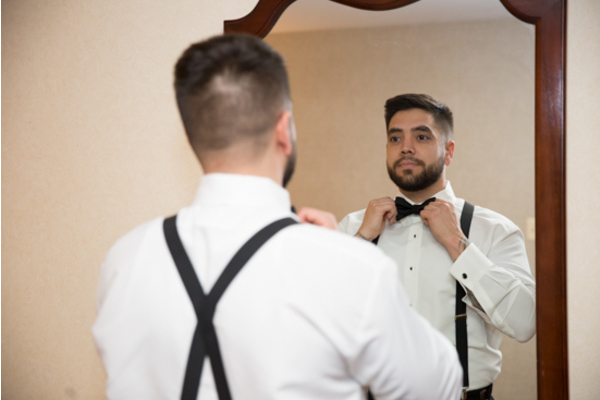 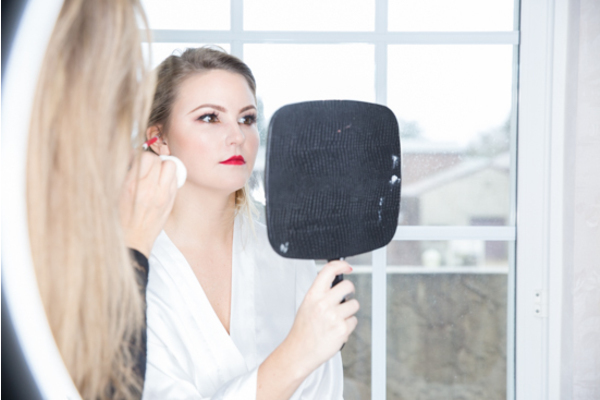 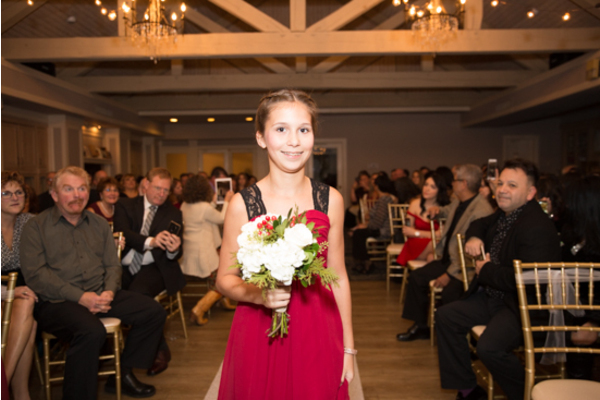 After a few portraits with our NJ Wedding Photographer, Samantha was ceremony ready. 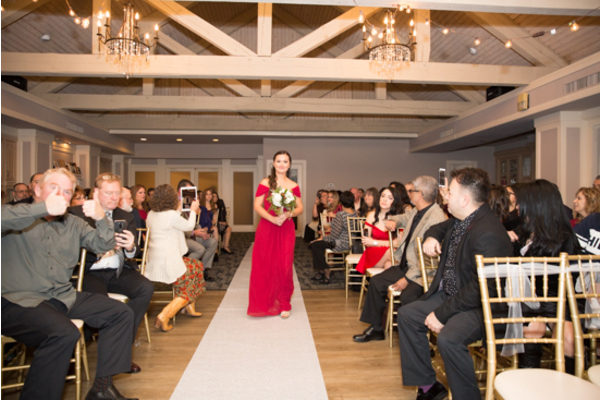 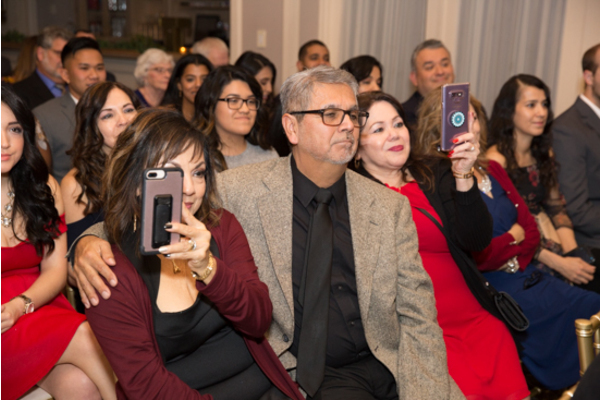 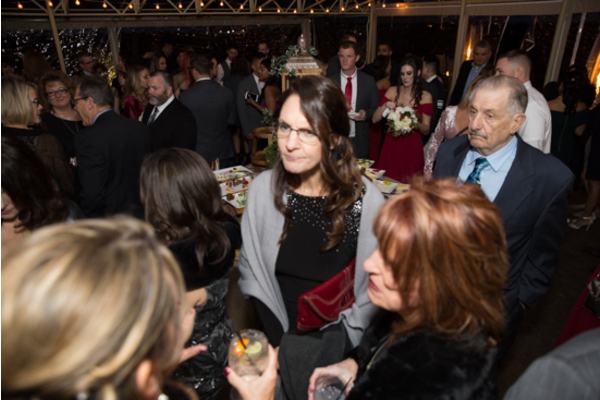 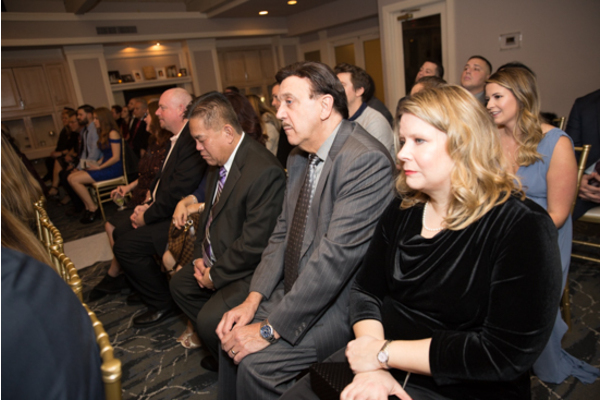 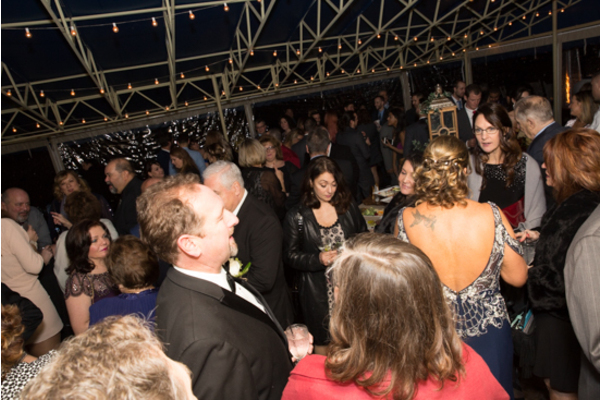 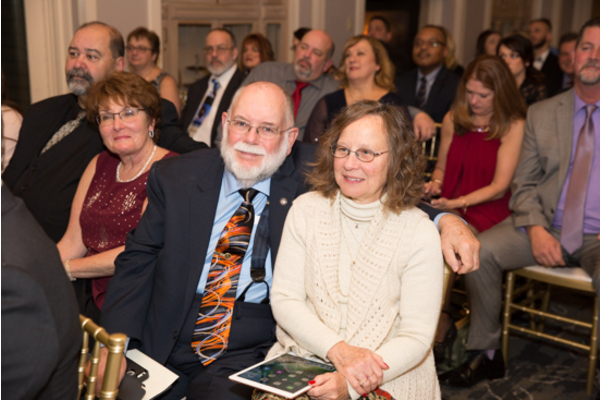 Love and excitement filled the room as guests awaited Samantha’s arrival. 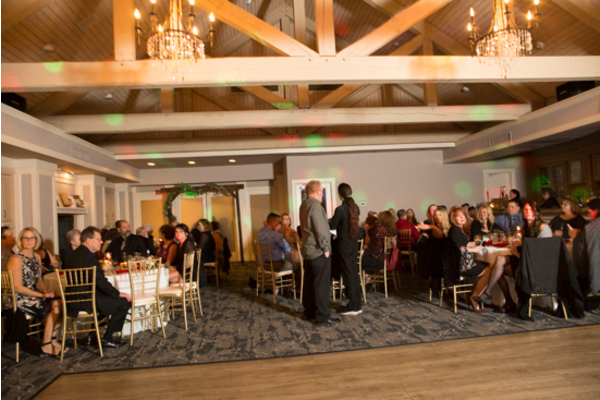 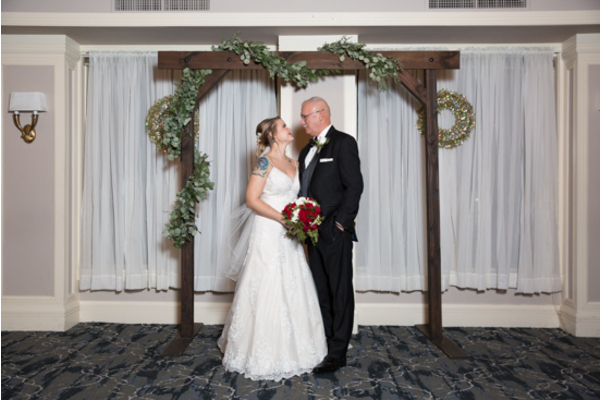 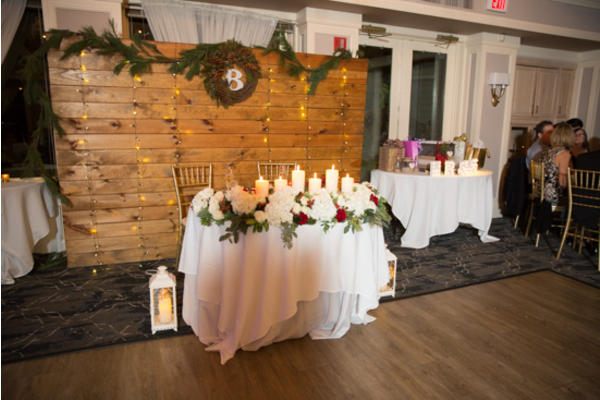 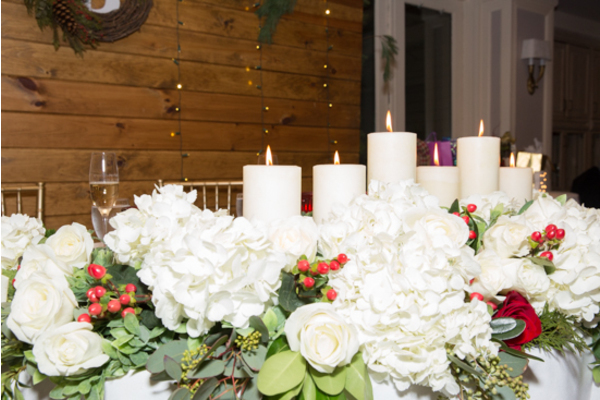 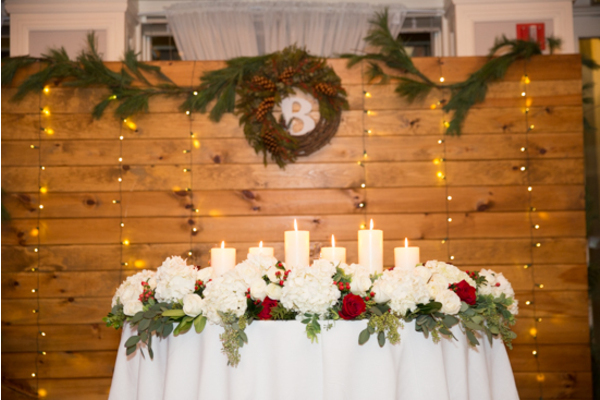 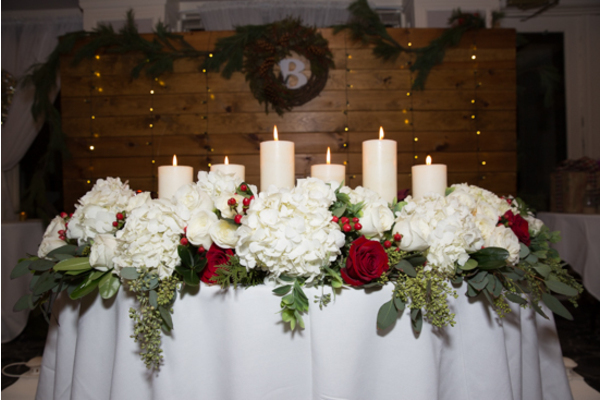 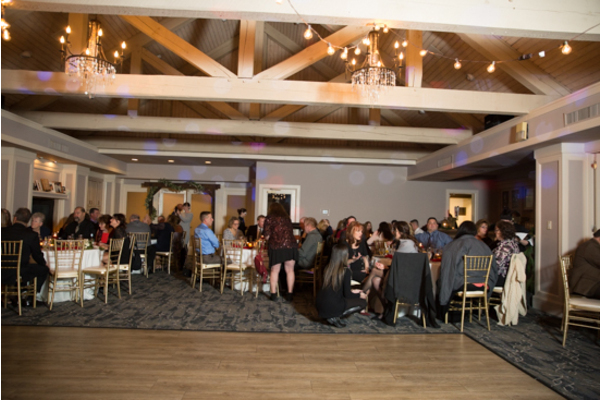 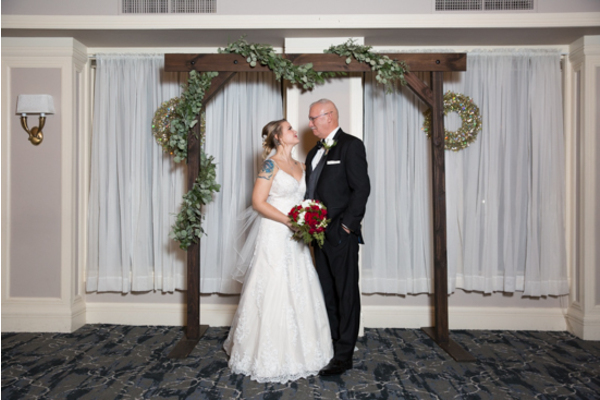 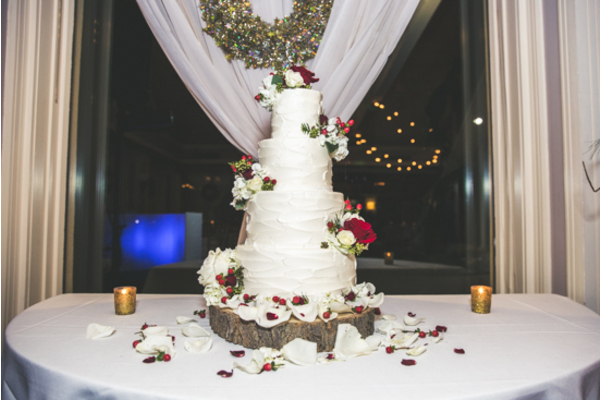 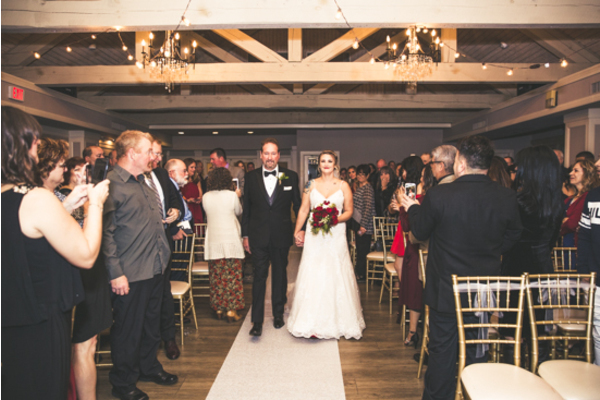 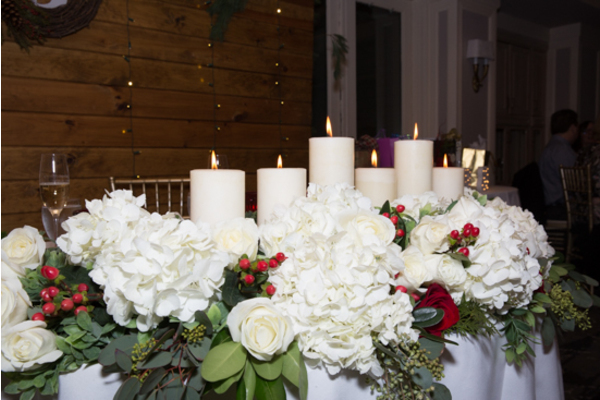 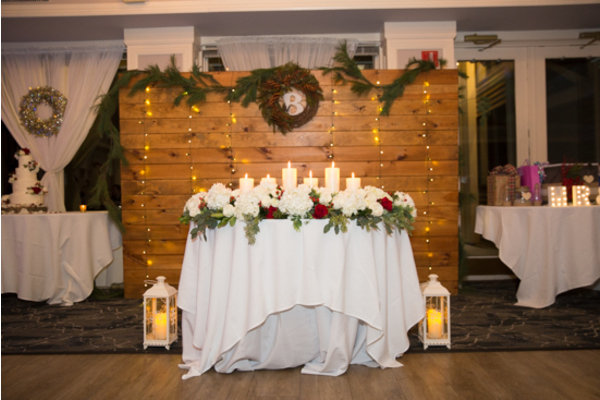 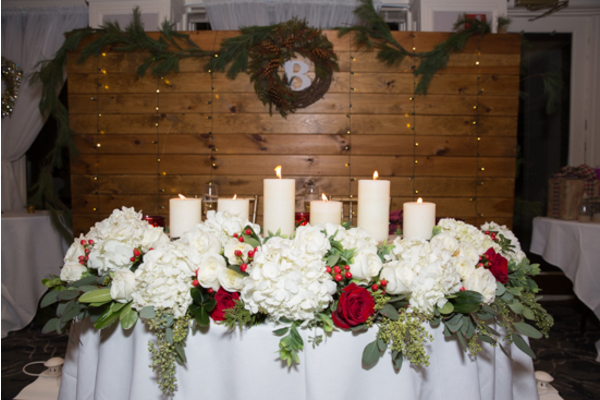 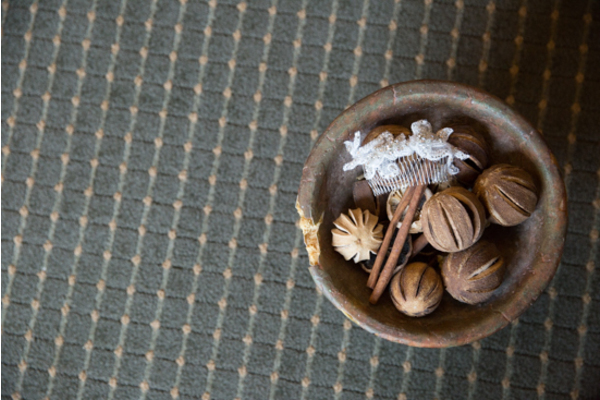 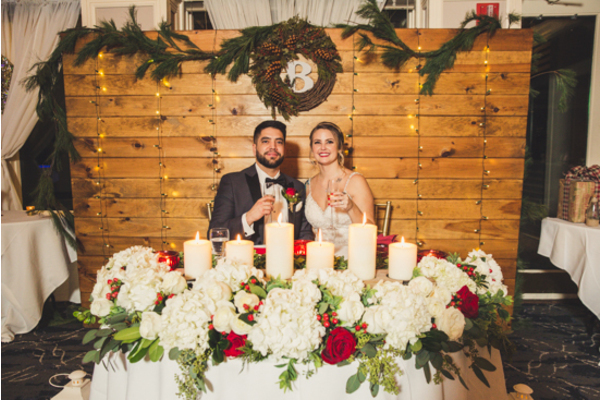 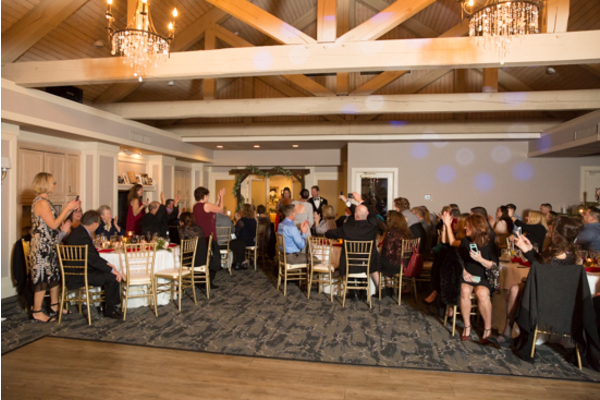 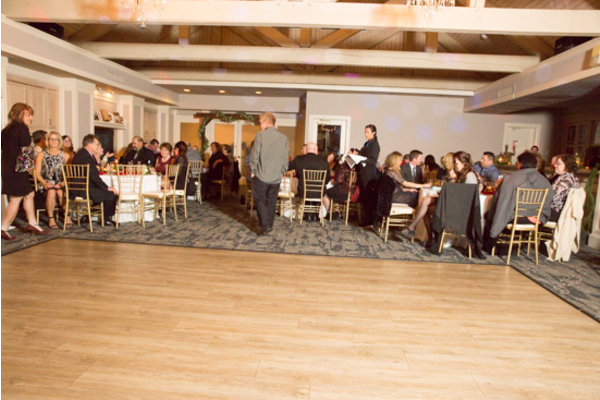 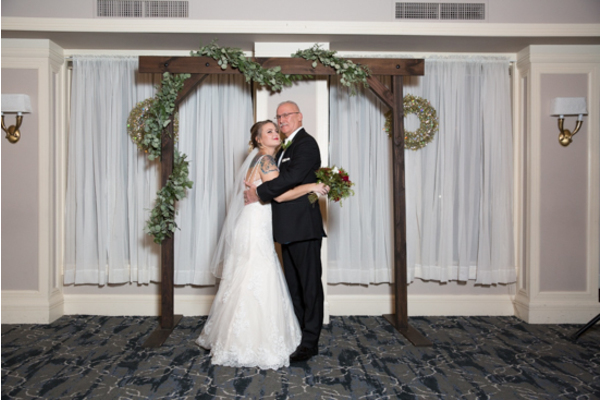 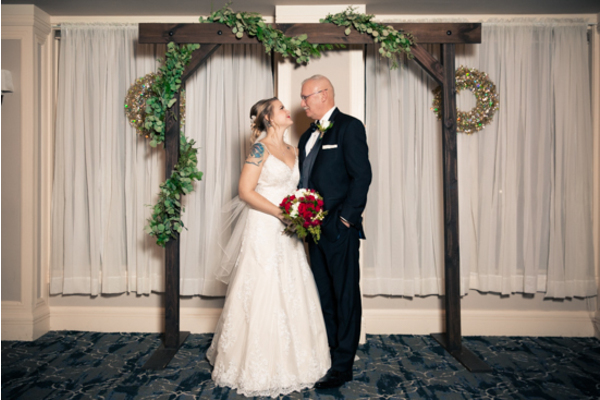 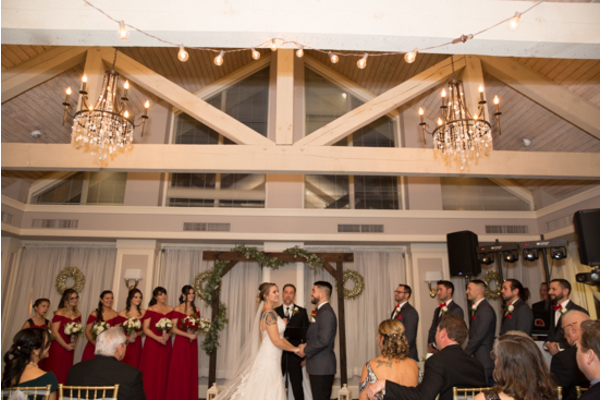 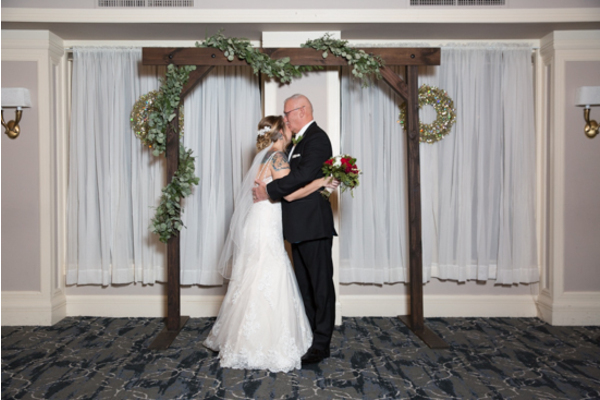 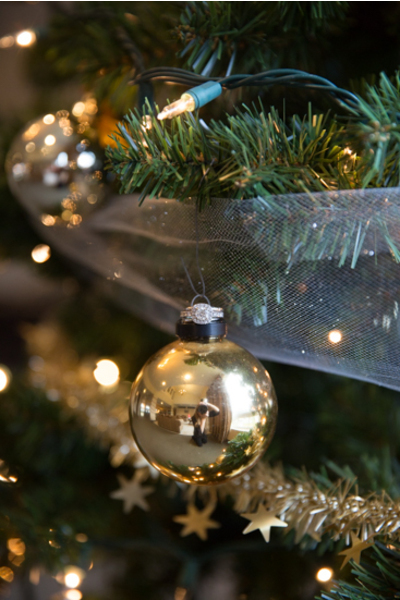 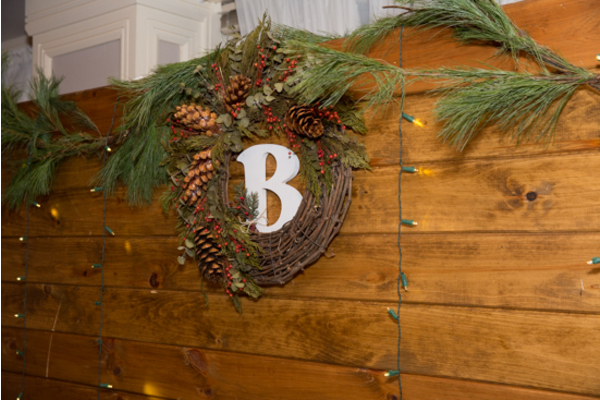 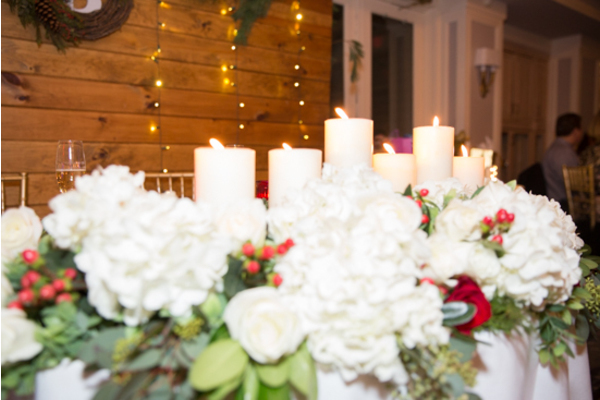 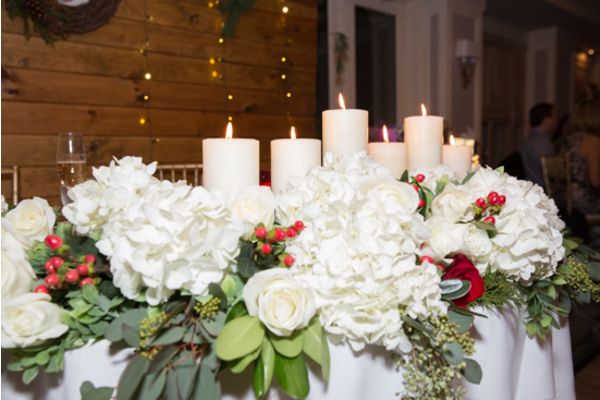 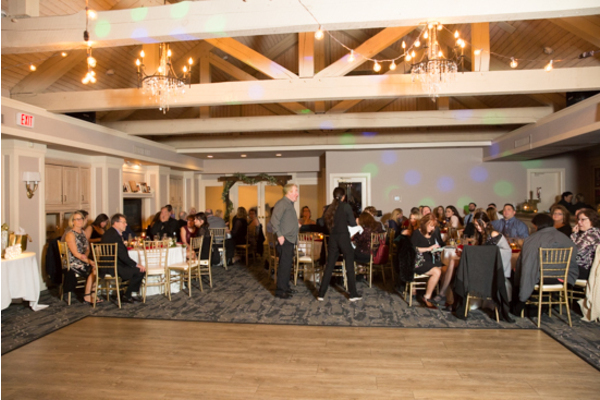 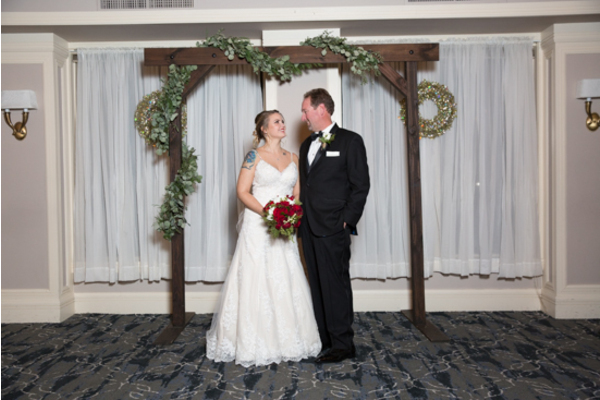 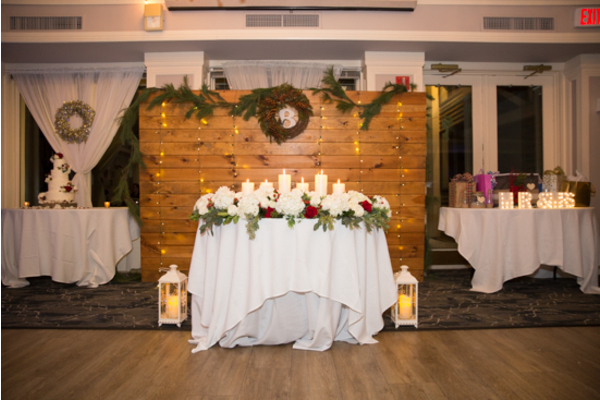 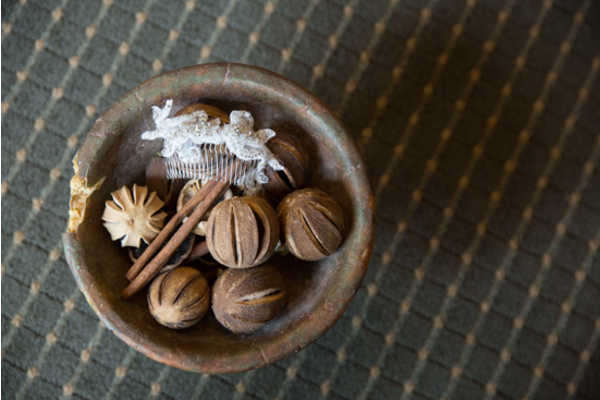 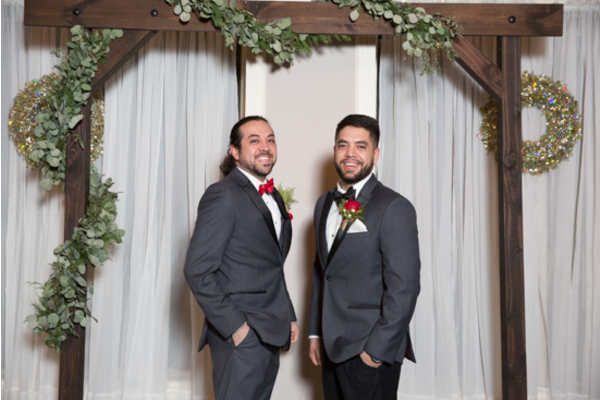 The venue’s high wooden ceilings accompanied by the decorations were perfect for this rustic winter wedding. 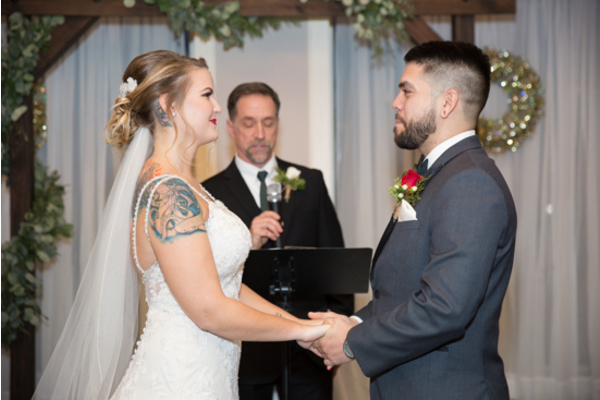 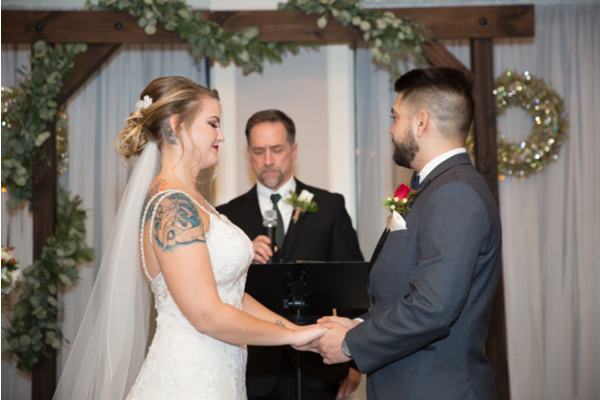 There were tears of joy in the crowd as Samantha and Jake said their vows to one another. 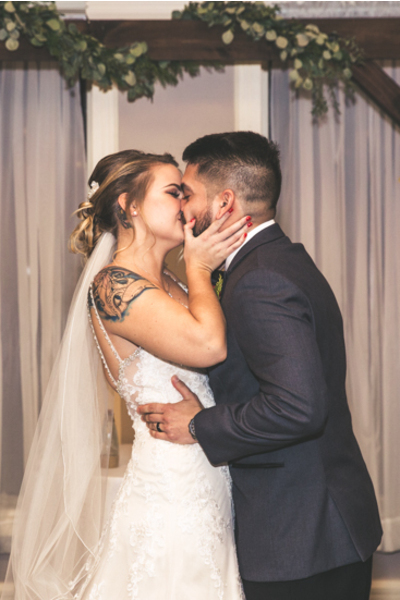 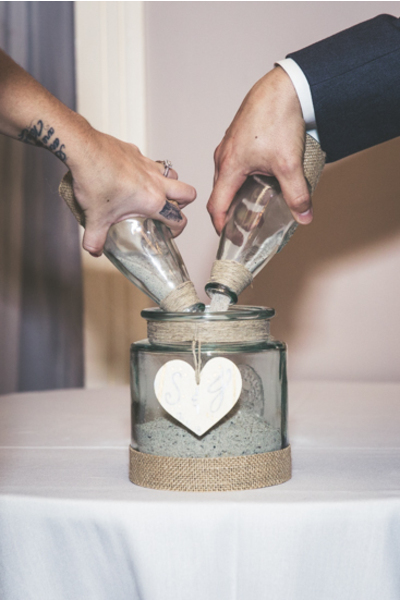 Once they kissed, the newlyweds were off to the reception! 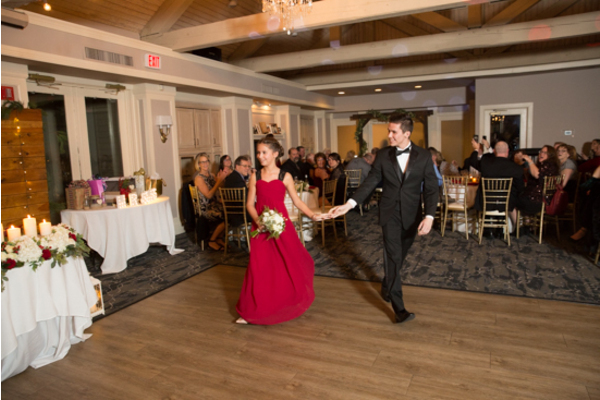 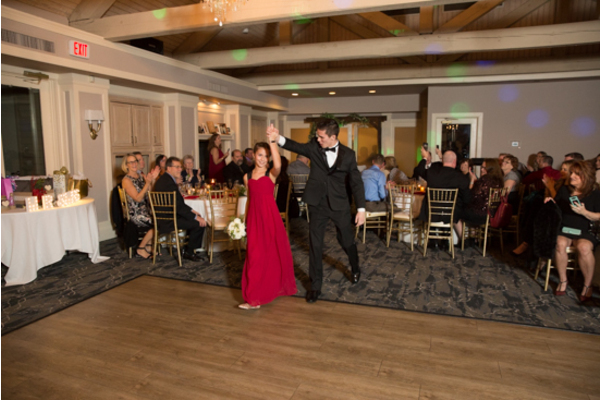 Welcomed in by enthusiastic friends and family, Samantha and Jake shared their first dance together. 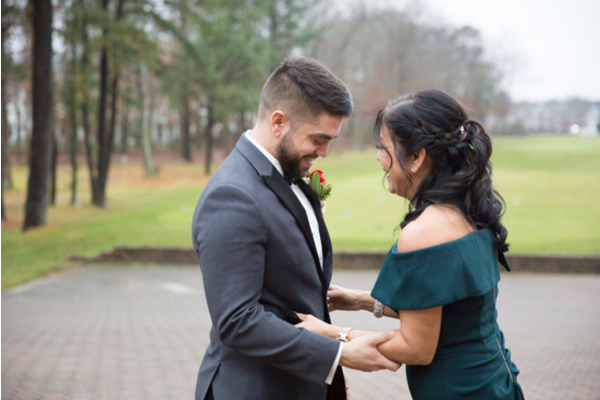 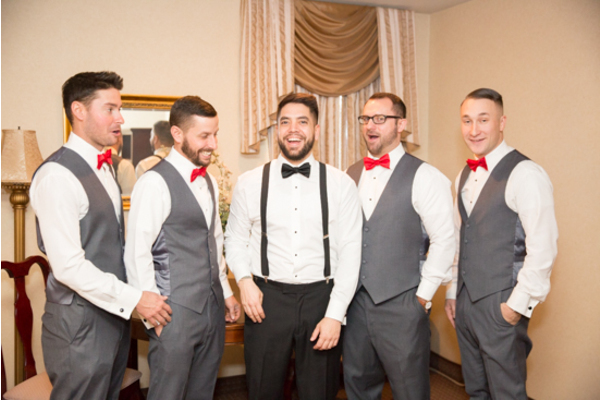 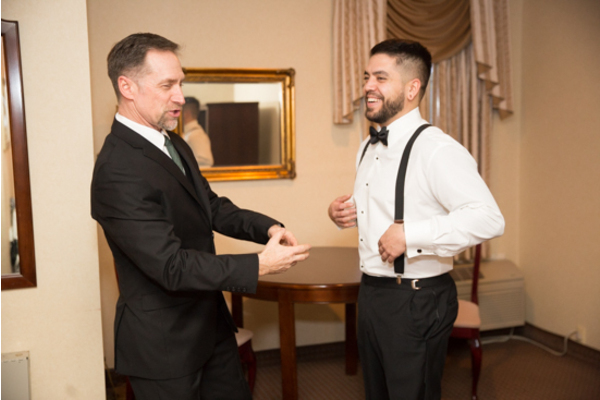 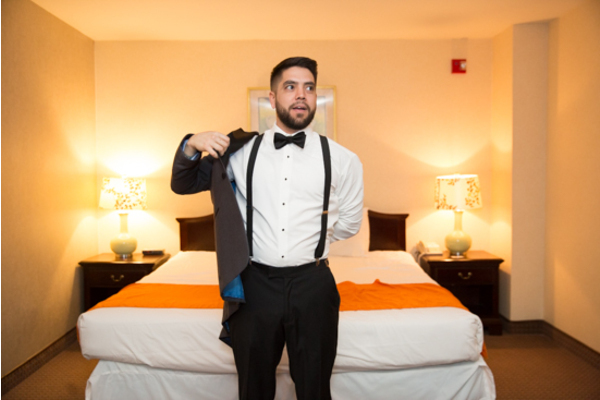 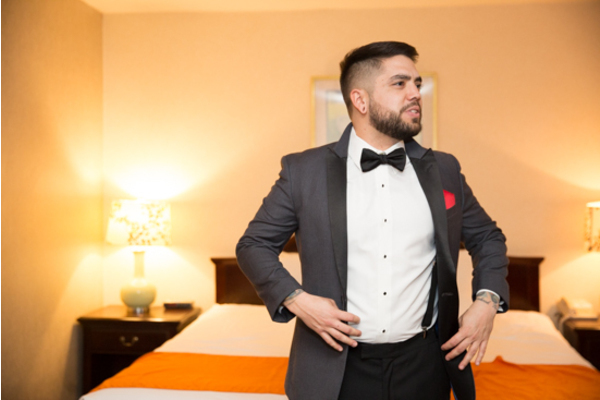 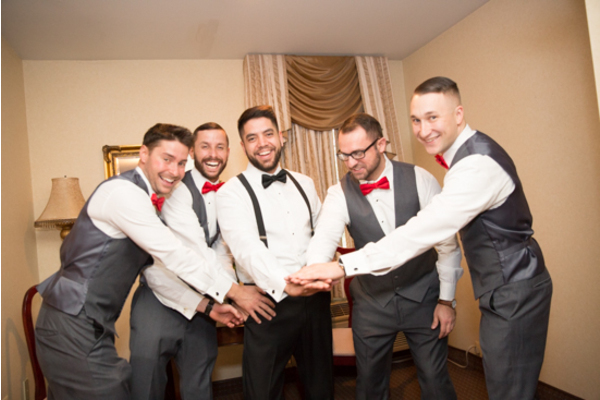 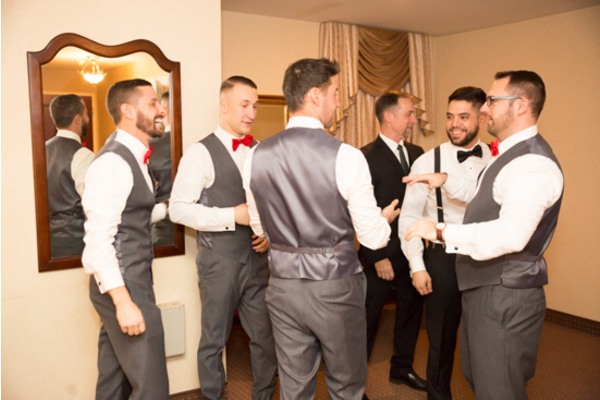 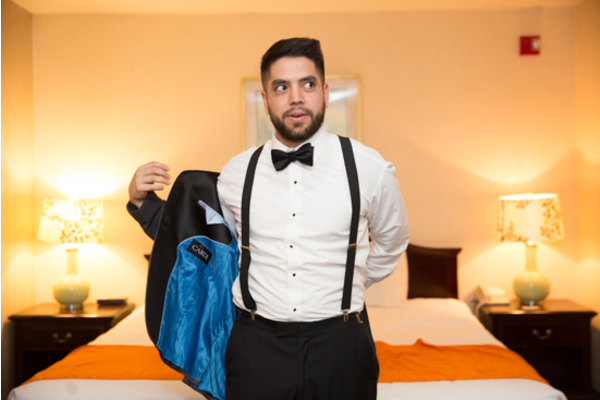 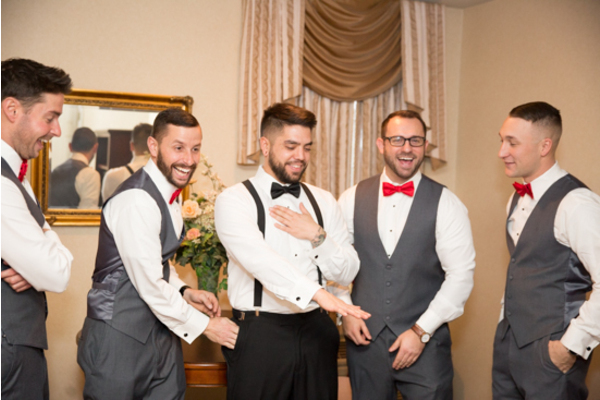 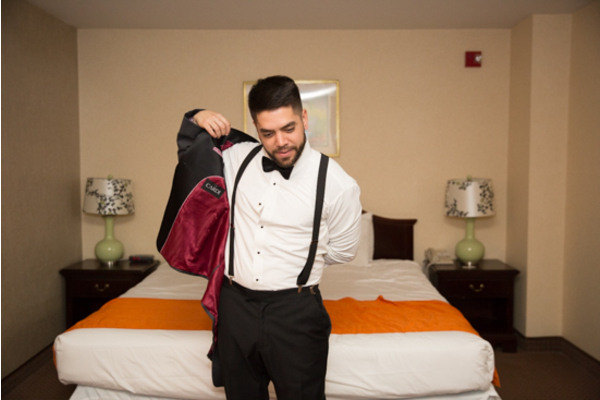 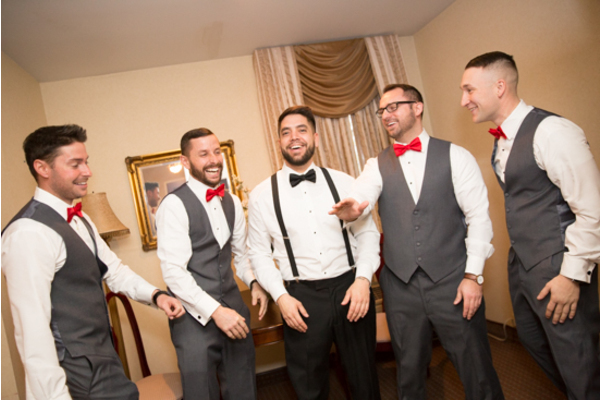 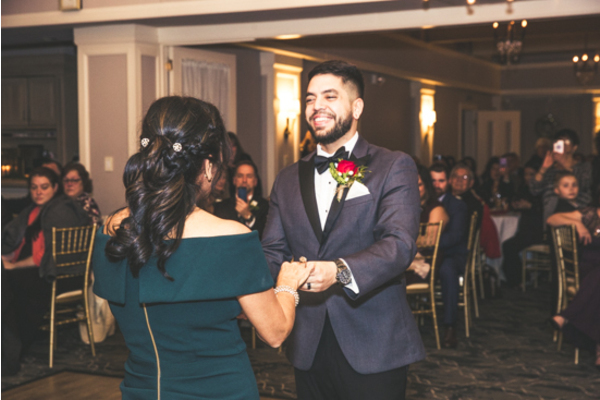 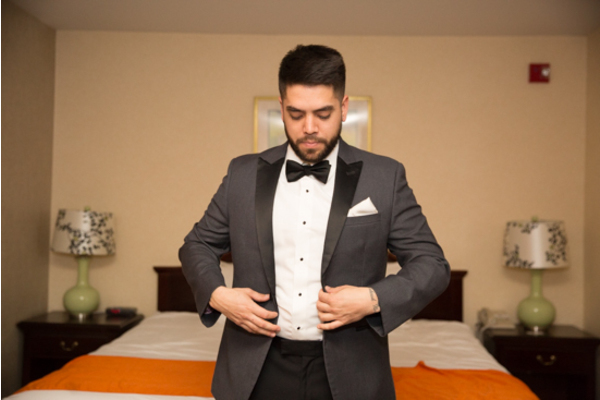 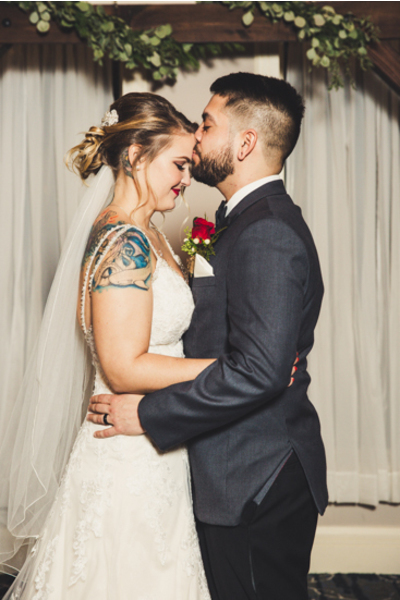 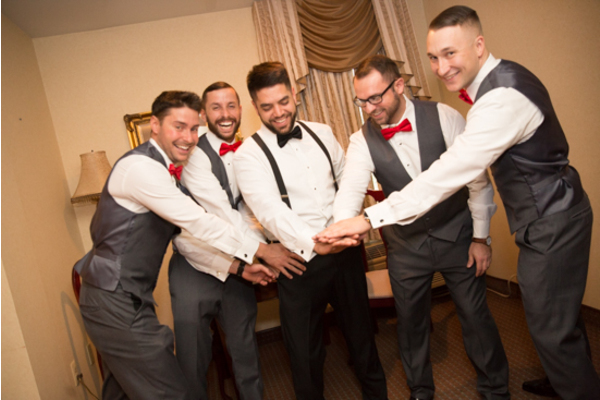 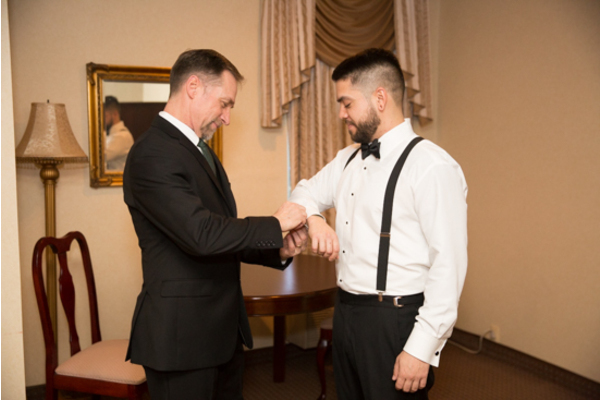 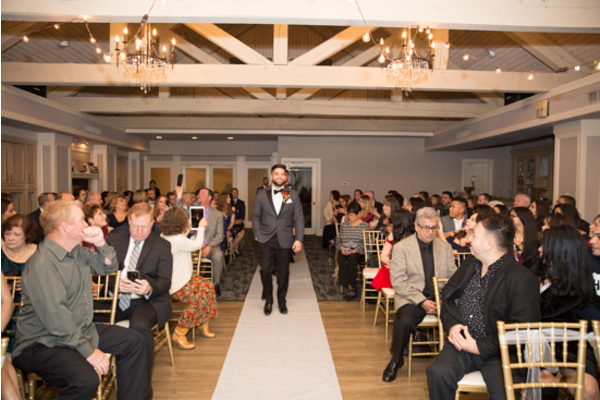 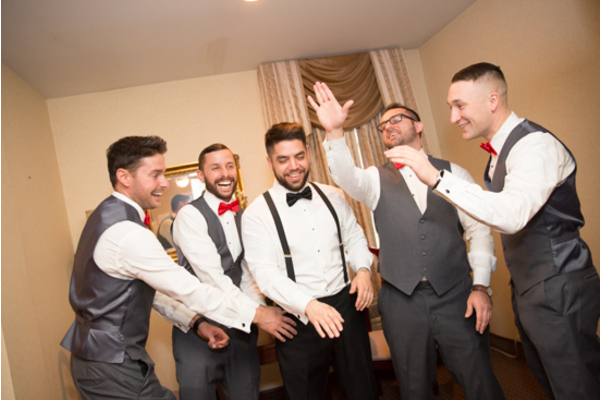 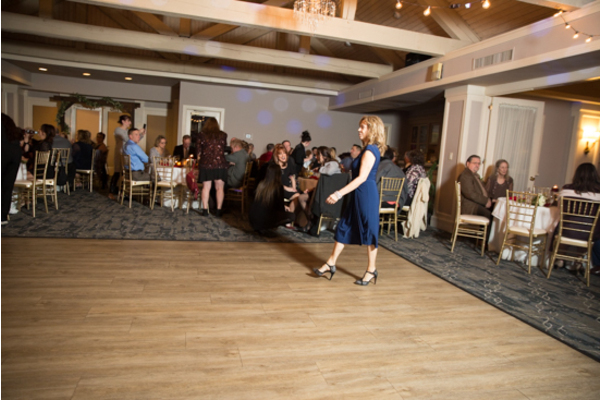 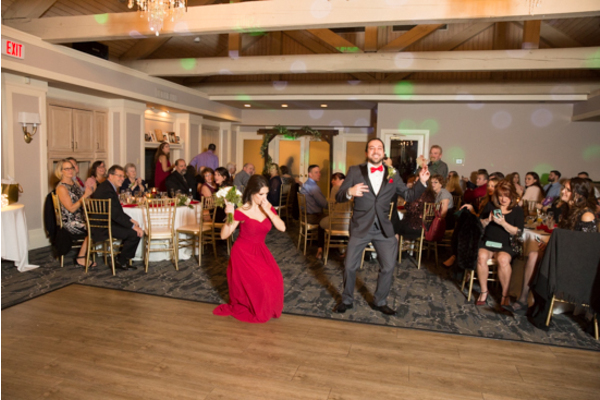 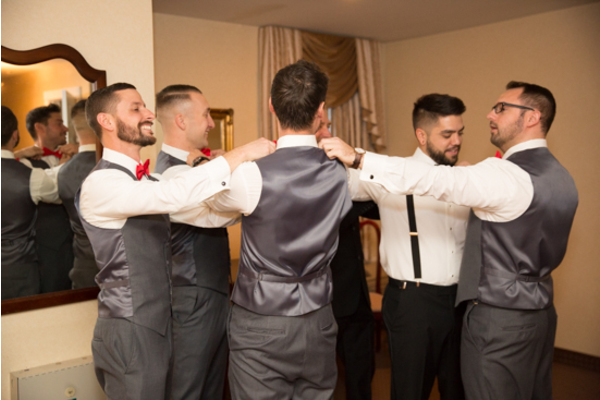 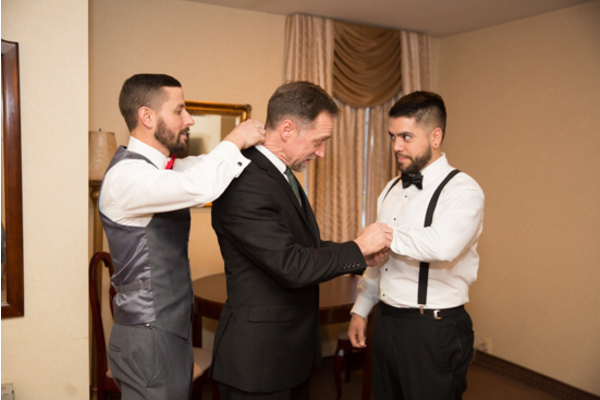 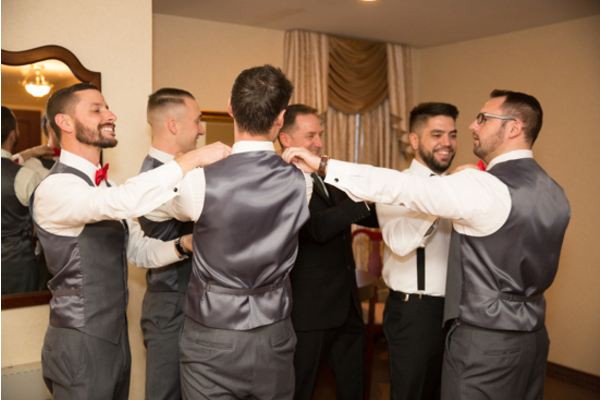 Later on, our NJ Wedding Photographer photographed dancing, cake cutting and everything in between. 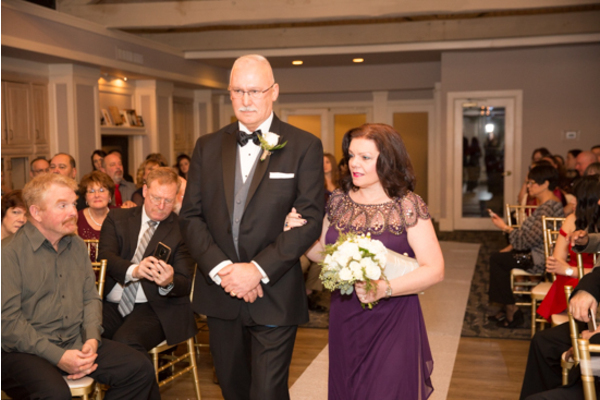 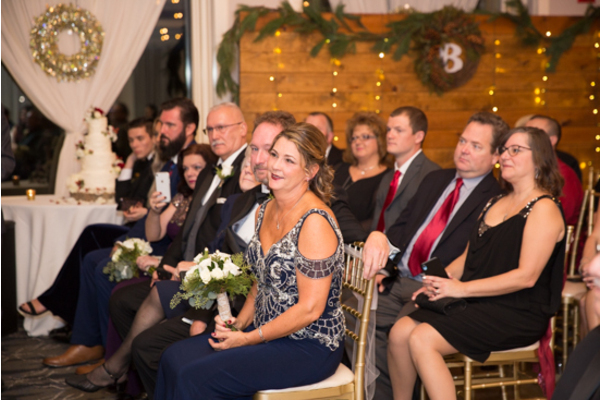 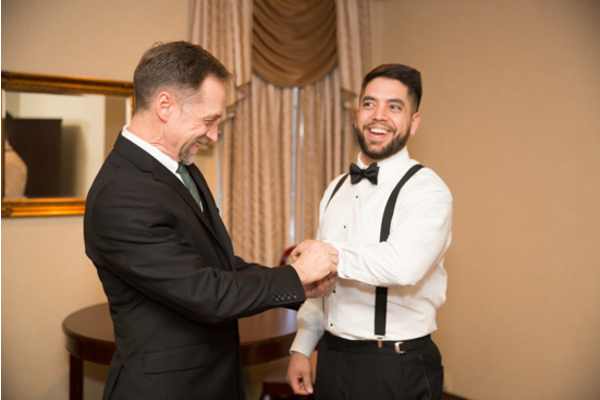 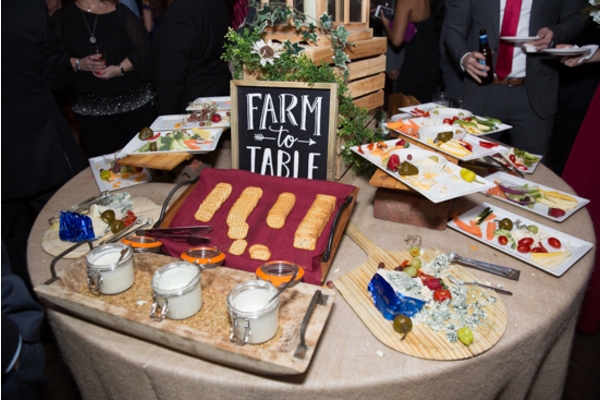 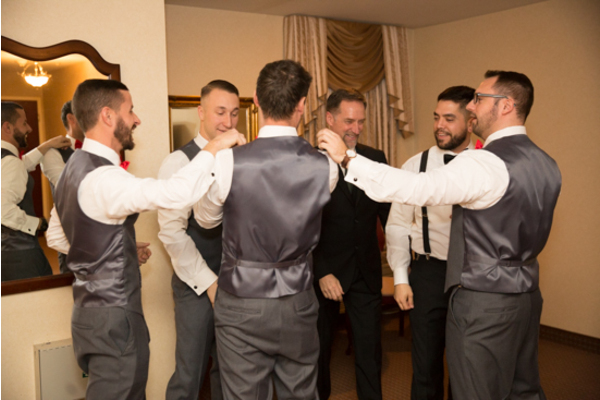 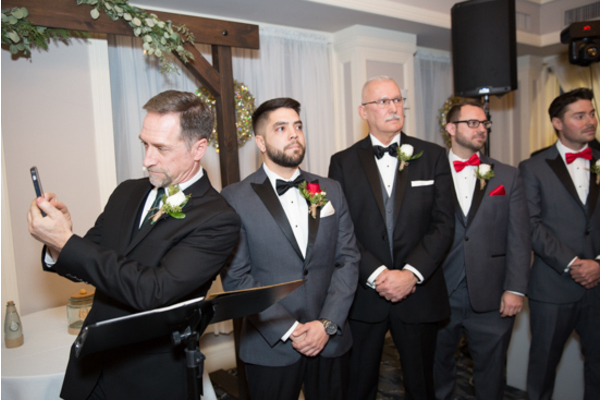 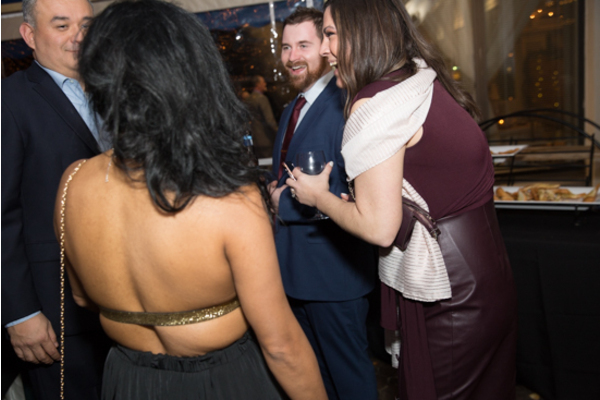 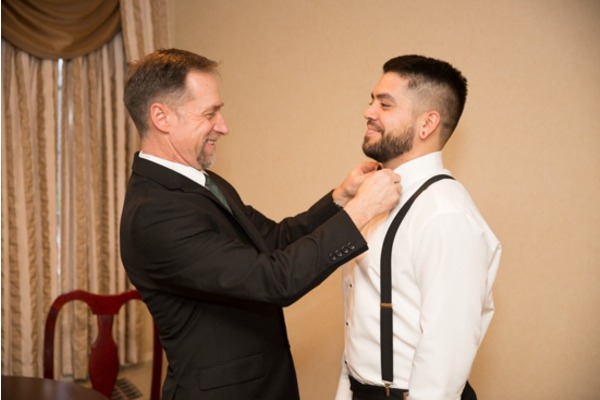 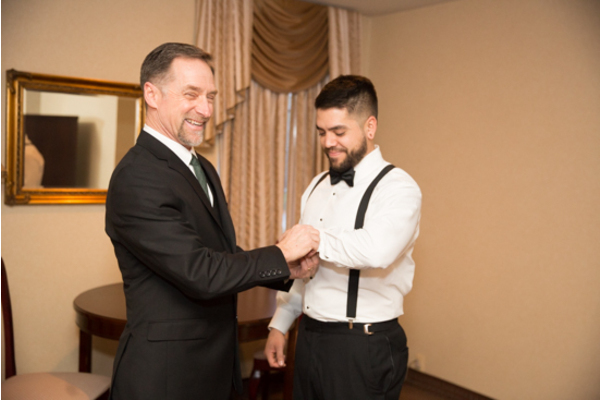 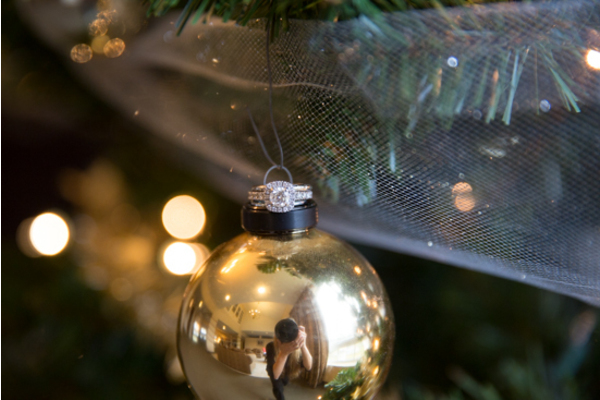 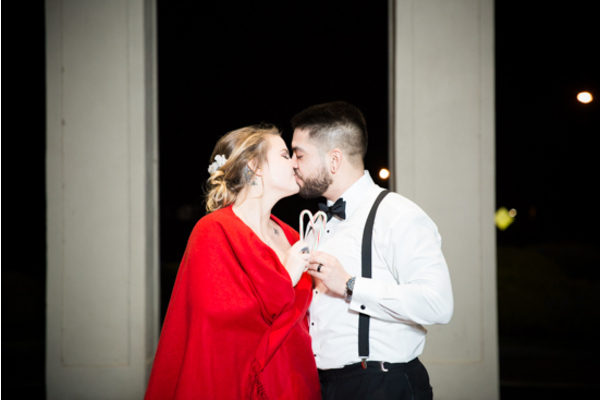 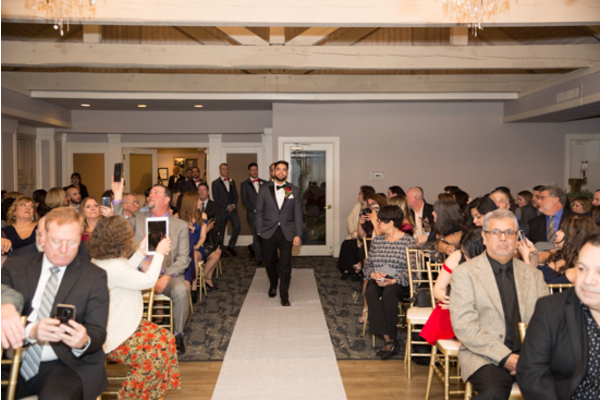 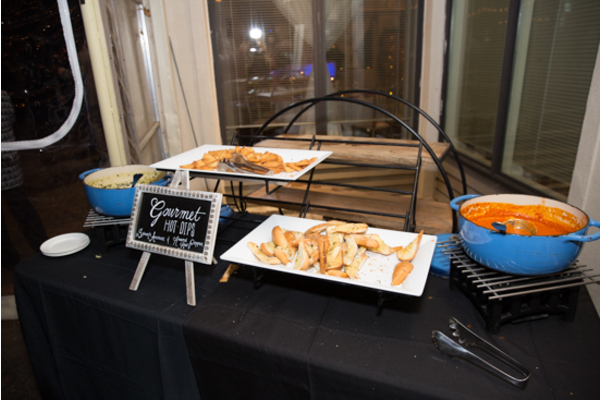 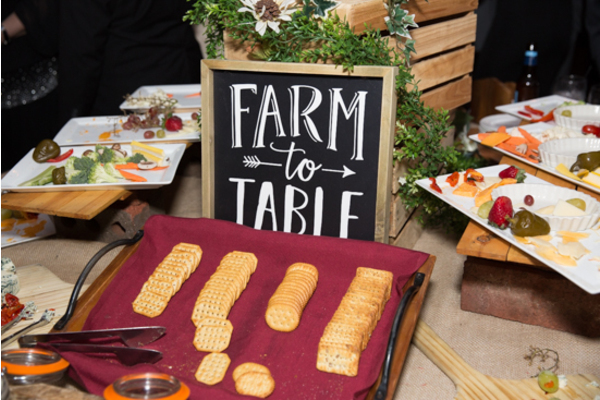 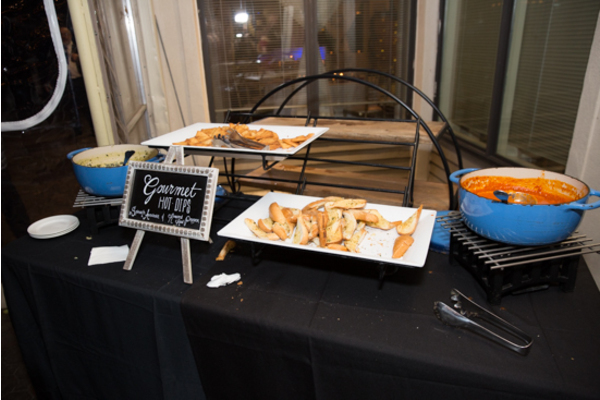 Overall, lifelong memories were made on this night, and we were so happy that we could celebrate with them! 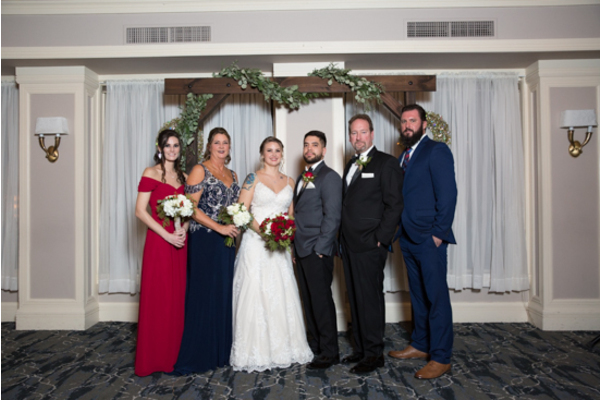 Congratulations, again, to Samantha and Jake. 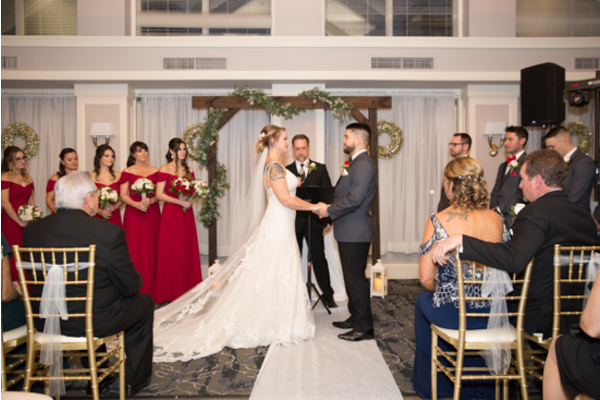 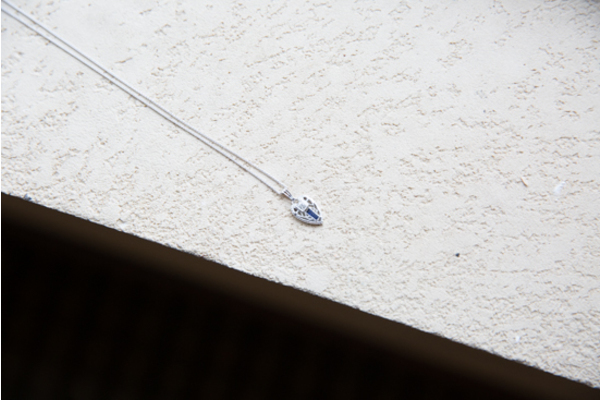 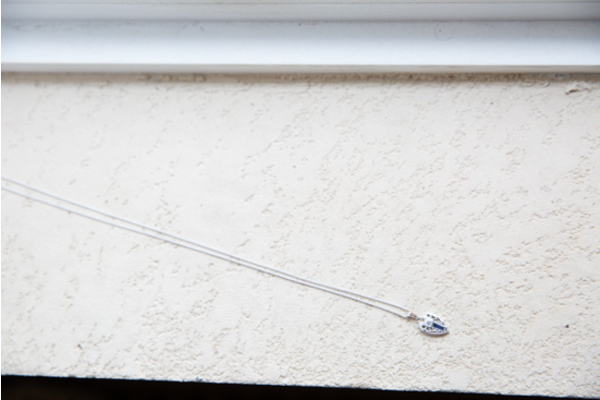 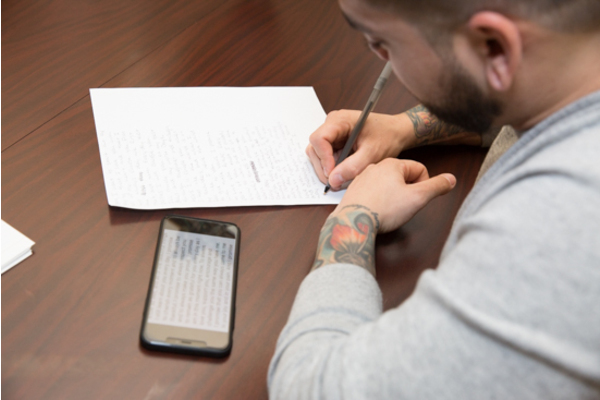 We wish you both a happily ever after!